Your community. 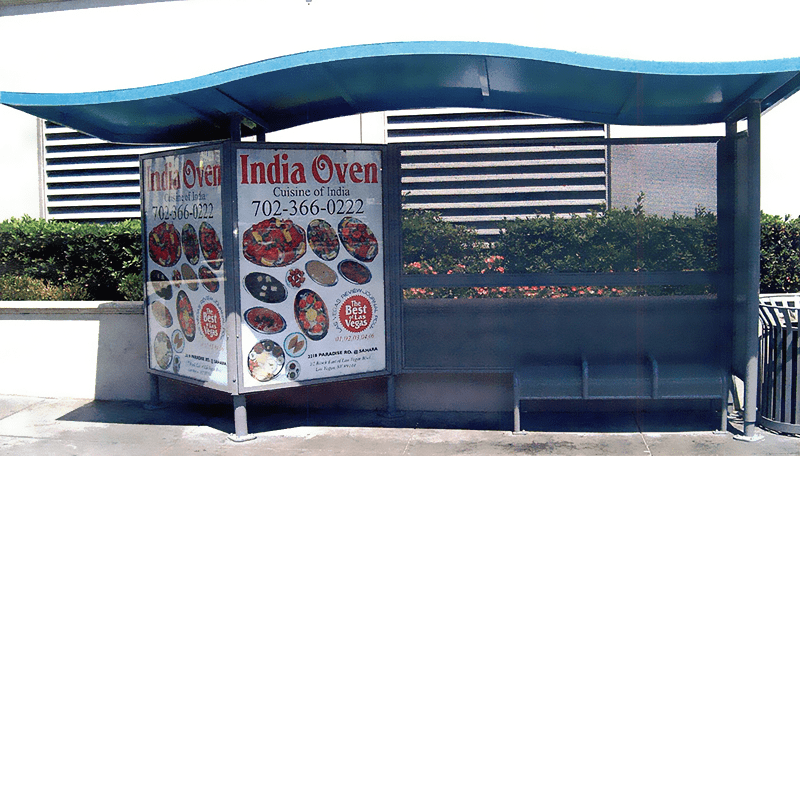 Our outdoor furniture solutions. The perfect fit. 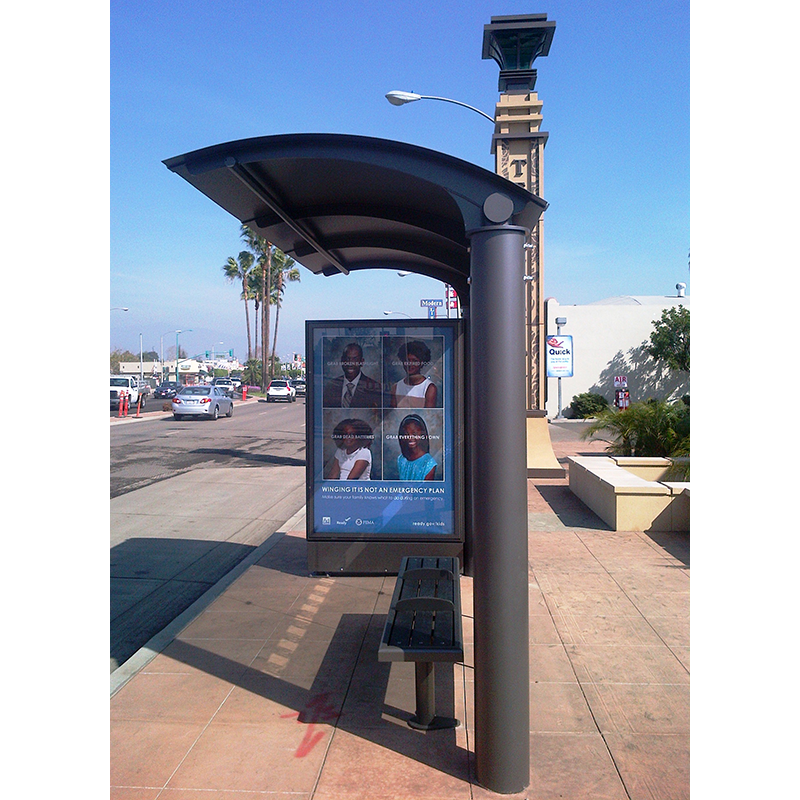 Tolar Manufacturing has been providing distinctive Sense of Place™ transit shelters and street furniture solutions for public transit agencies, outdoor advertising companies, municipalities and government agencies since its founding in 1991 by Gary Tolar. 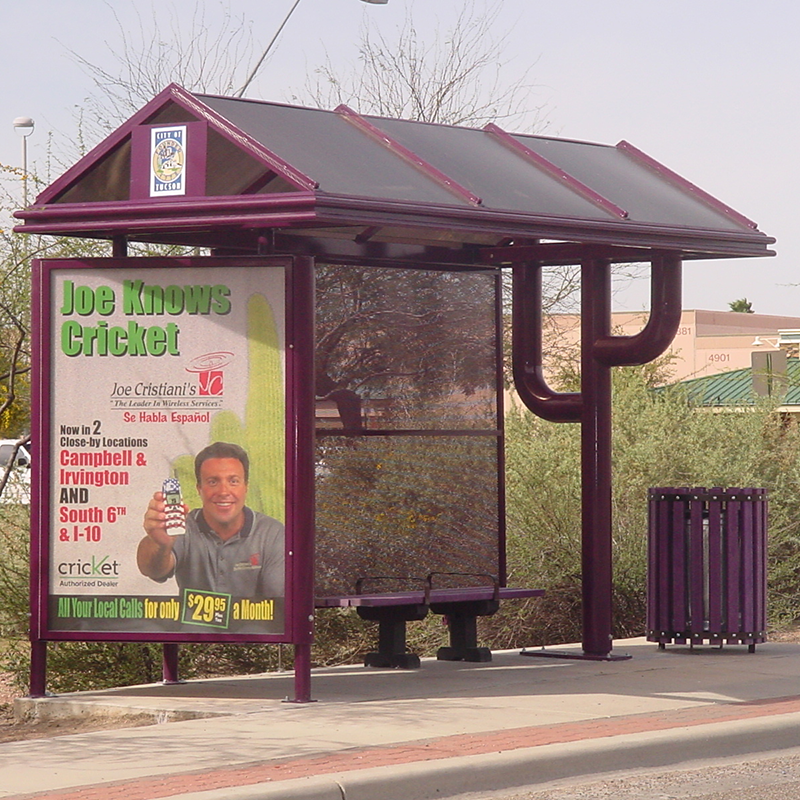 With over 25 years experience, Tolar Manufacturing is the industry-leading resource that communities across North America turn to when looking for best-in-class transit shelters, bus benches, bus stop street furniture, solar solutions and outdoor advertising displays. 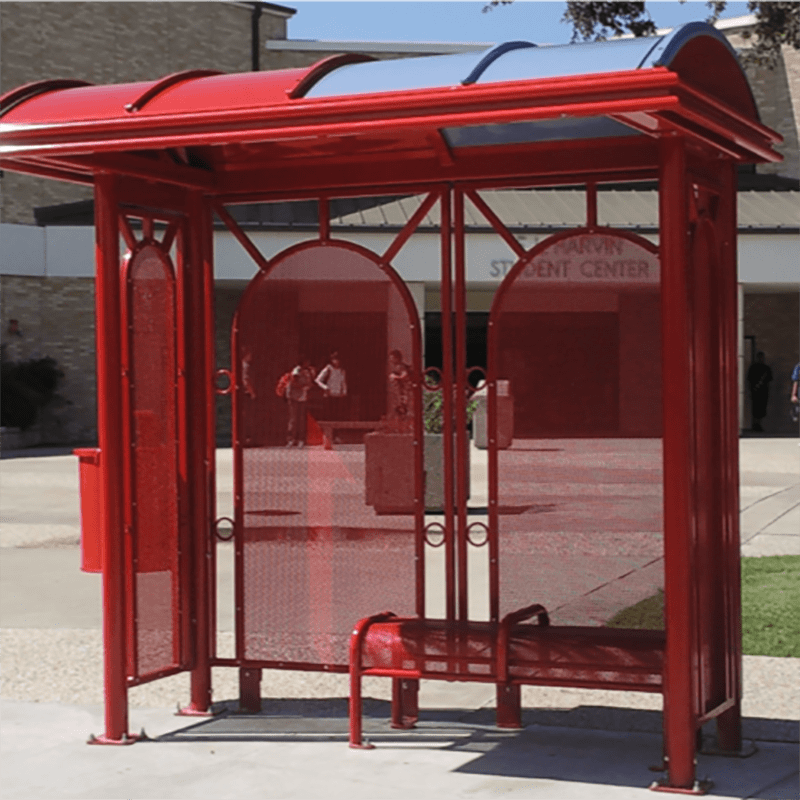 Tolar’s 500+ designs and hundreds of customized solutions deliver the style, value and durability clients demand, due to its creative design process, rigorous materials specifications and world-class manufacturing standards. We welcome you to browse our many Projects of Distinction below. 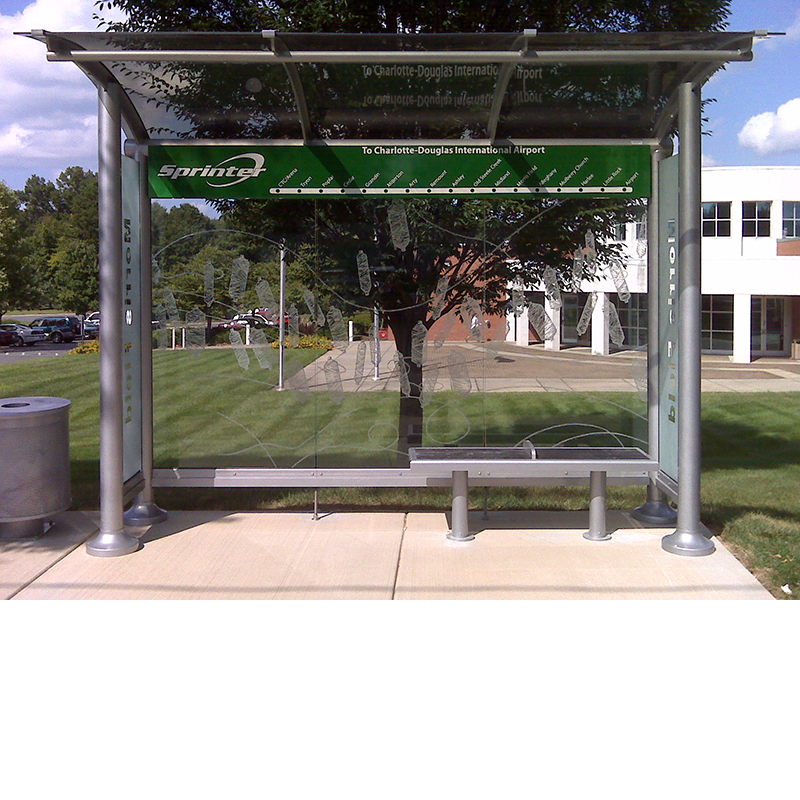 Montgomery chose Tolar Manufacturing for the transit shelter element of their stem rebranding. 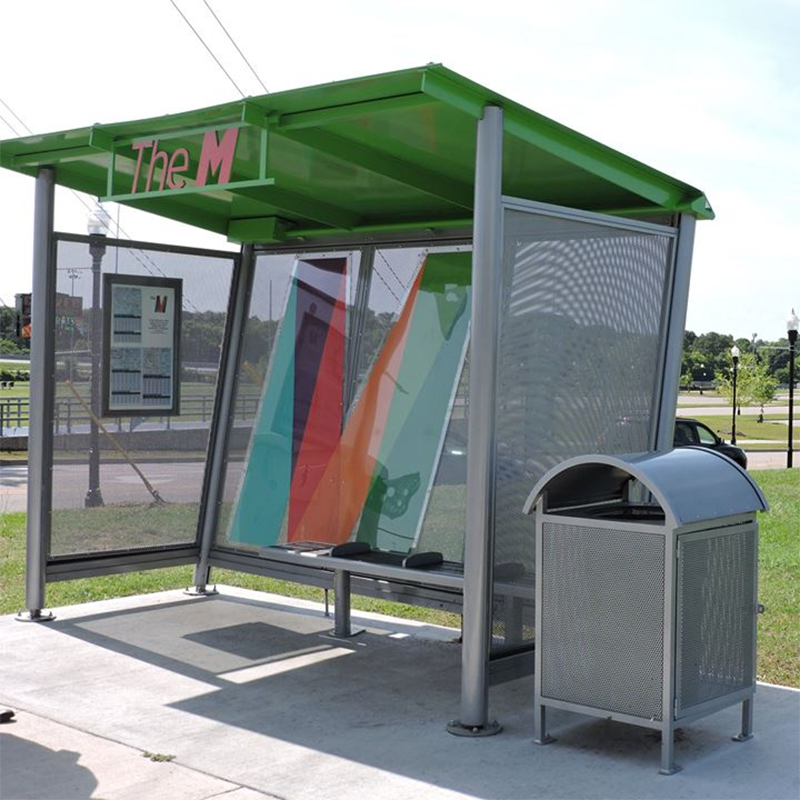 Now known as “The M” the 12′ shelters from our Signature Empire design includes a large M on the rear wall, integrated map case, location banner, Mesa bench, perforated metal trash receptacle and solar illumination. 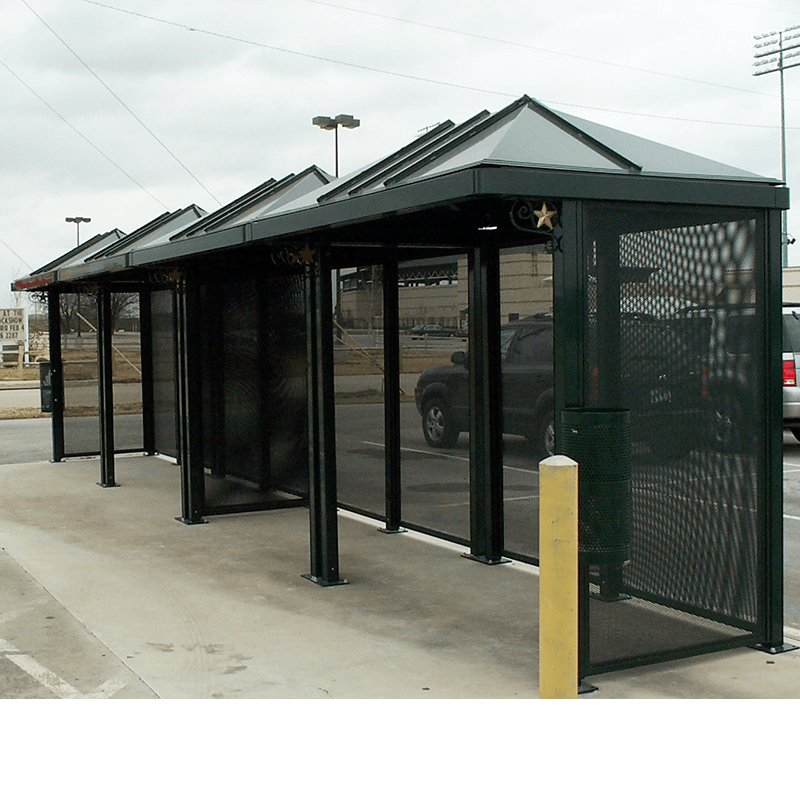 Tolar Manufacturing, through a competitive bid process, was awarded the opportunity to design and fabricate 8’ shelters from our Signature Empire line. 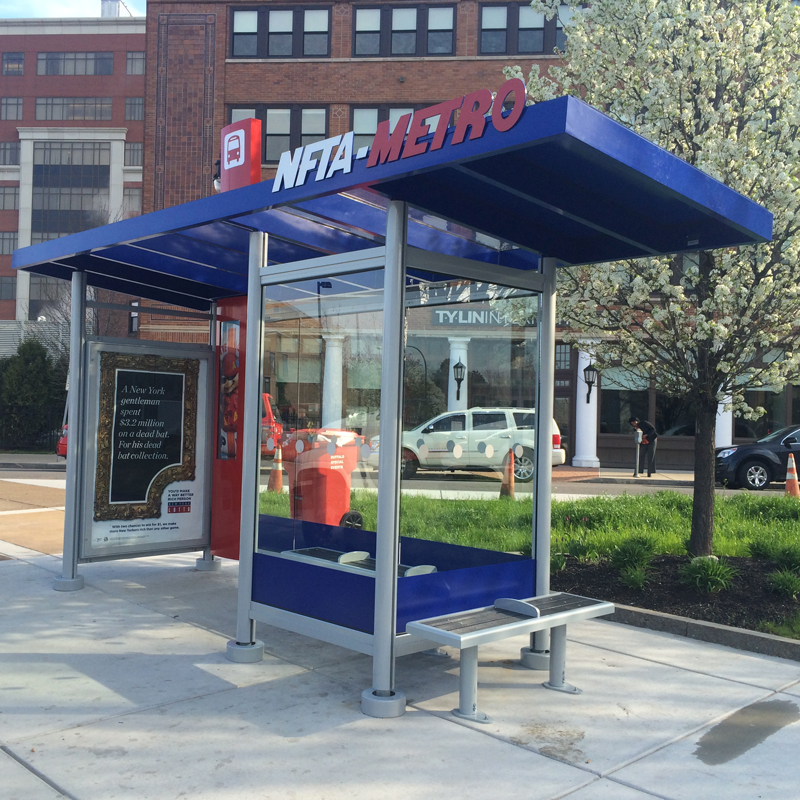 Featuring an angled flat roof, back-to-back media display kiosk, perforated aluminum walls, integrated map case and Mesa aluminum framed bench, the new shelters are designed to coincide with the relaunch of the new Rock Region Metro transit service in the Metro Little Rock area. 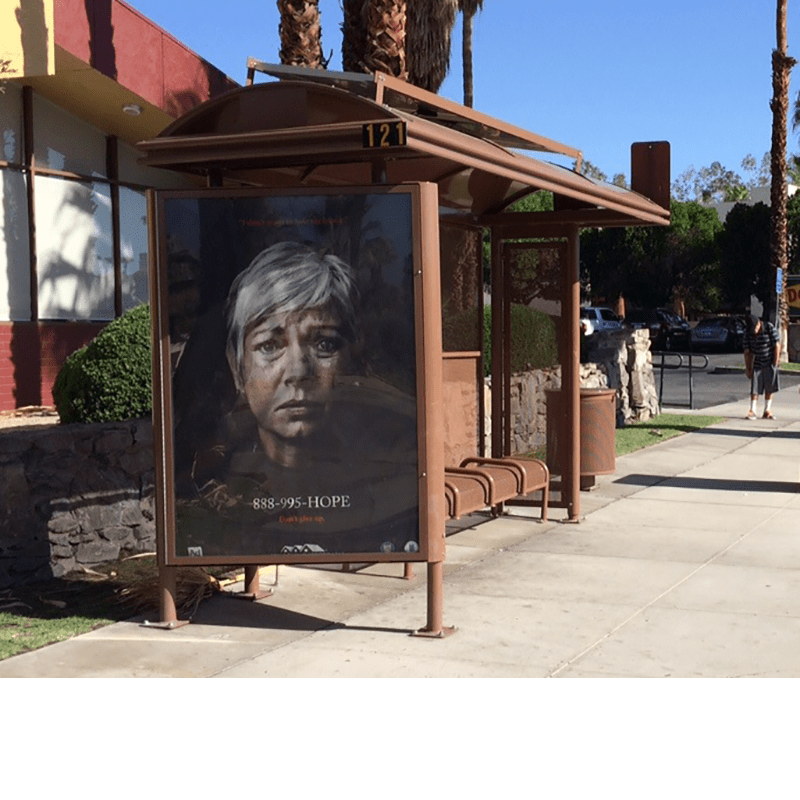 Tolar was tasked by its outdoor advertising client to develop a design that reflects the southwest spirit of Tucson. 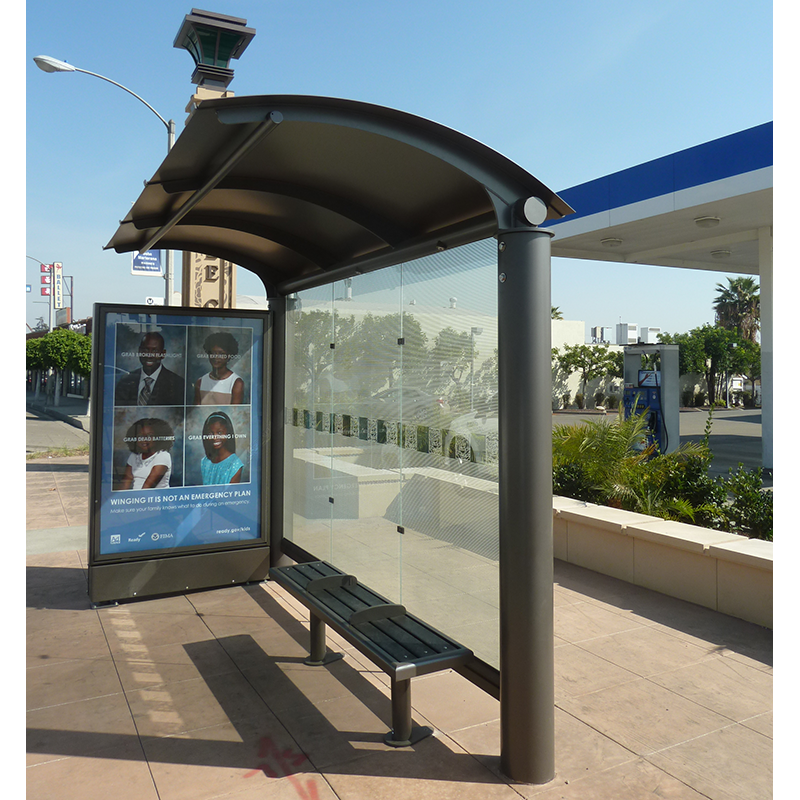 Working with our client to execute their design intent, we developed a high peak shelter with a fabricated Sahuaro post to support the roof opposite the advertising kiosk. 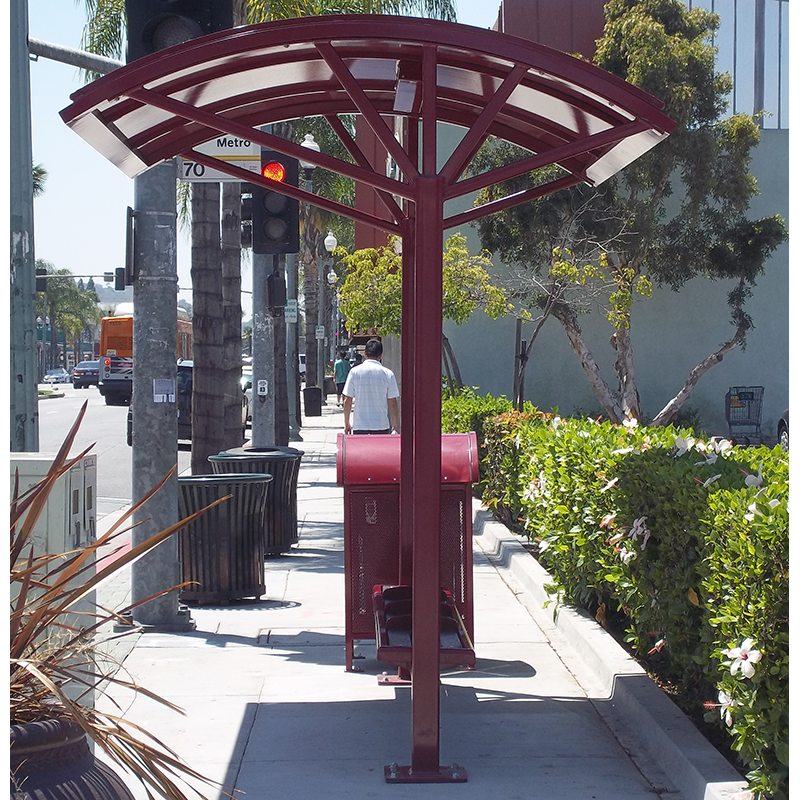 The shelter, illuminated by solar lighting, features a water drainage system designed to water the drought tolerant landscape. 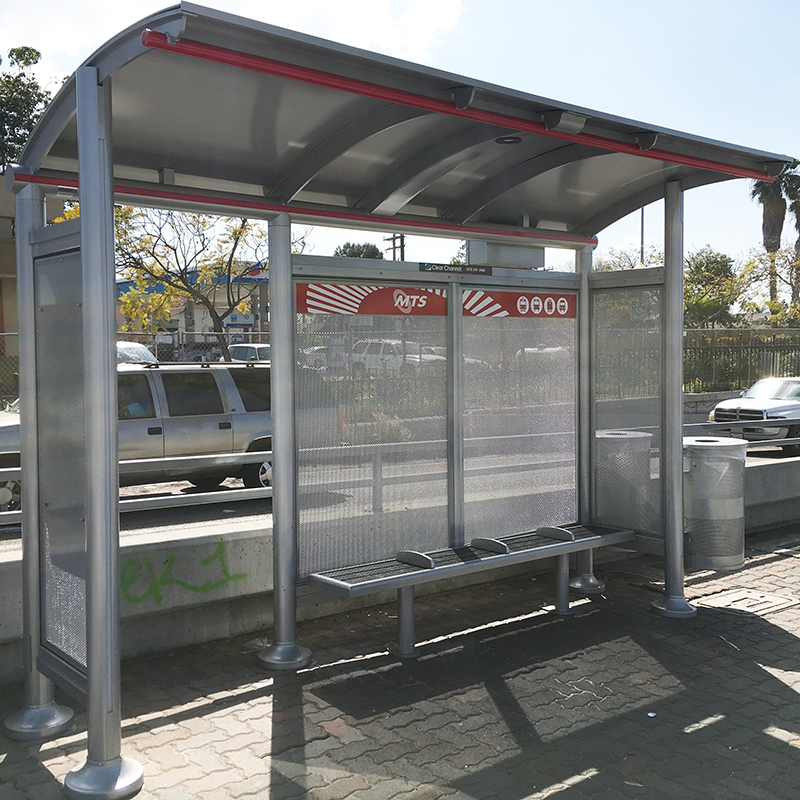 The customized shelter also includes perforated metal walls, a recycled slat bench and trash receptacle. 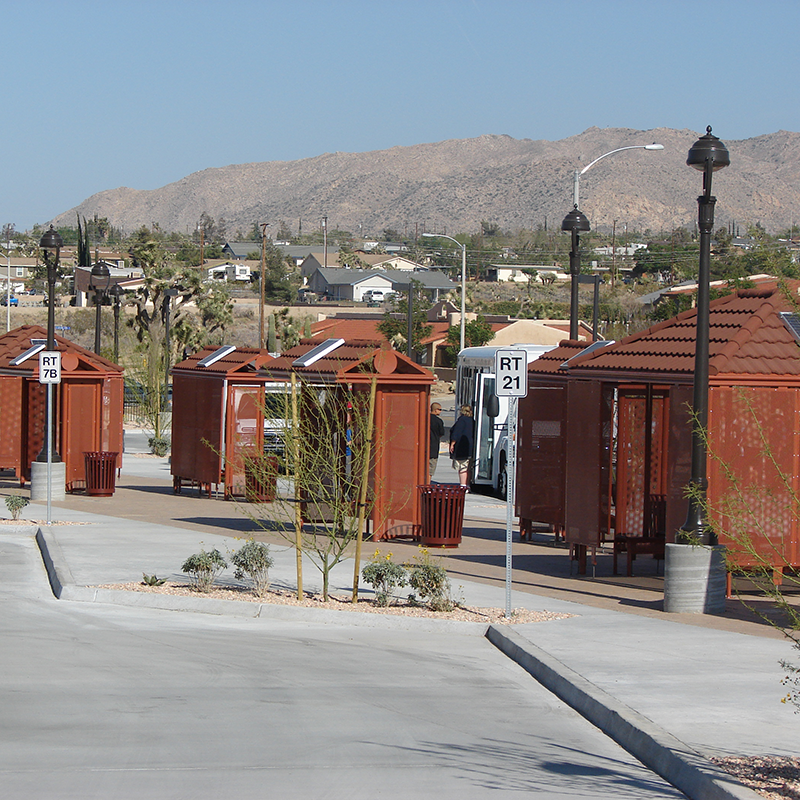 The Sahuaro line has grown through the life of the project to meet the needs of our client with over 10 versions of the Sierra Series Sahuaro shelter placed throughout the Tucson area. 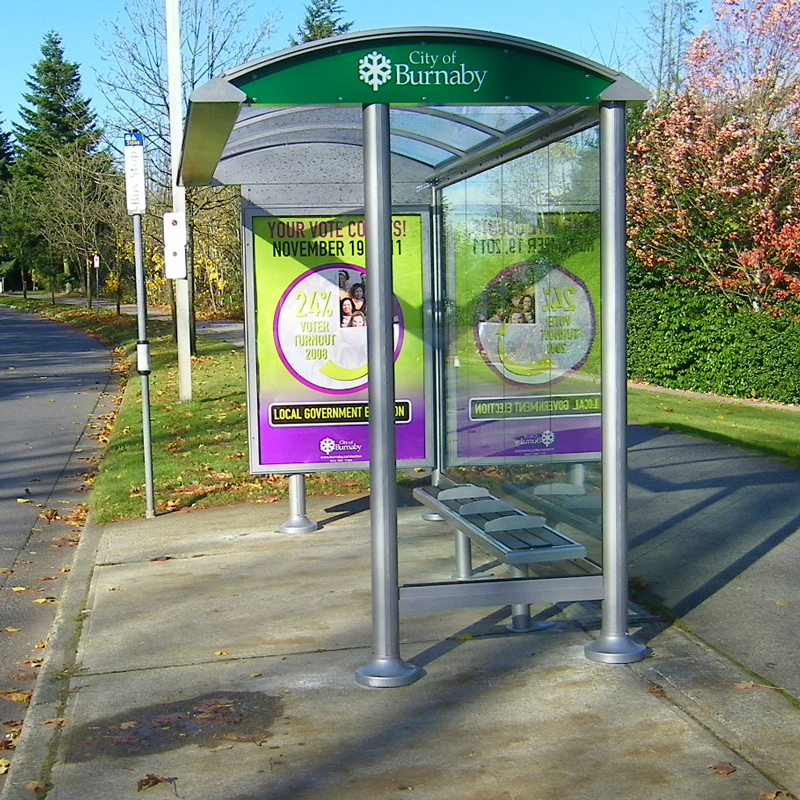 In Burnaby (BC) Canada, major streets often follow the old horse trails between Vancouver and New Westminster while other famous streets often trace the venerable Trans-Canadian highway. 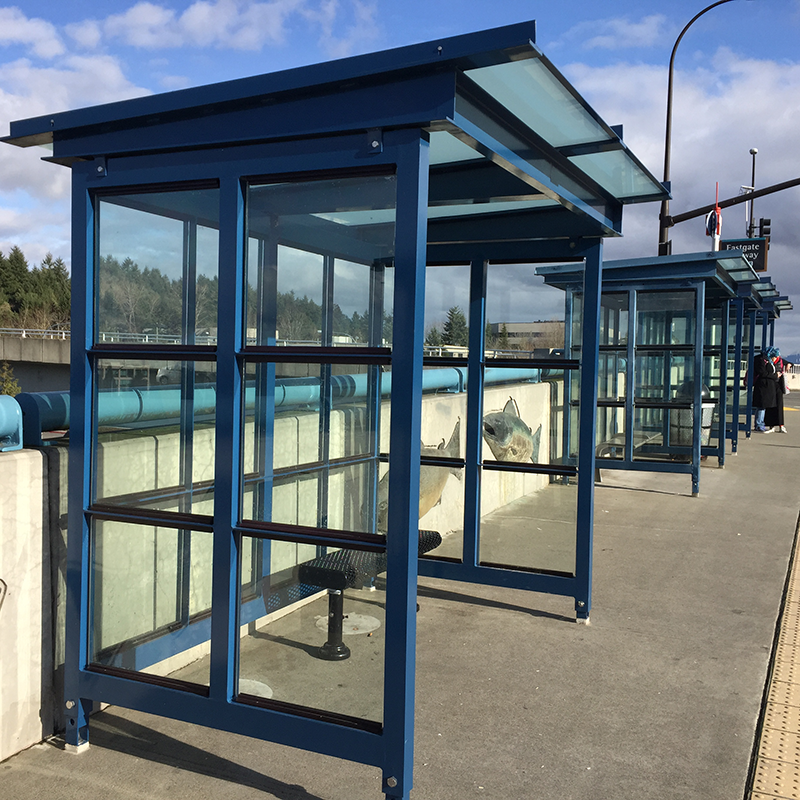 Now, featuring customized Tolar Euro shelters, Burnaby has developed a modern network of streets well served by the Metro Vancouver Bus System run by the Coast Mountain Bus Company, a division of TransLink. 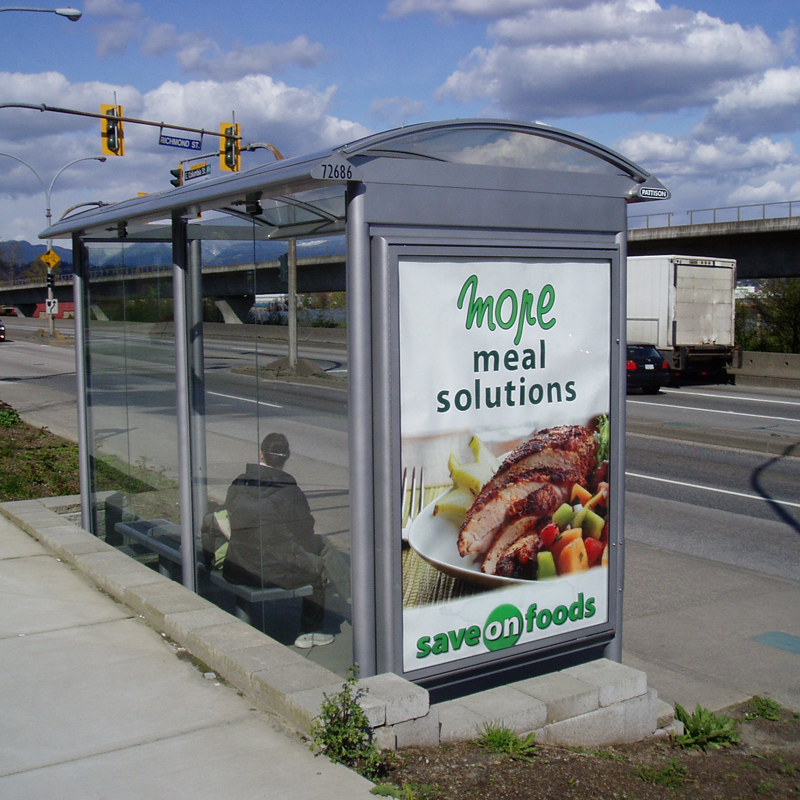 The Tolar team worked with our valued outdoor advertising client in British Columbia to execute transit shelters from our Euro series. 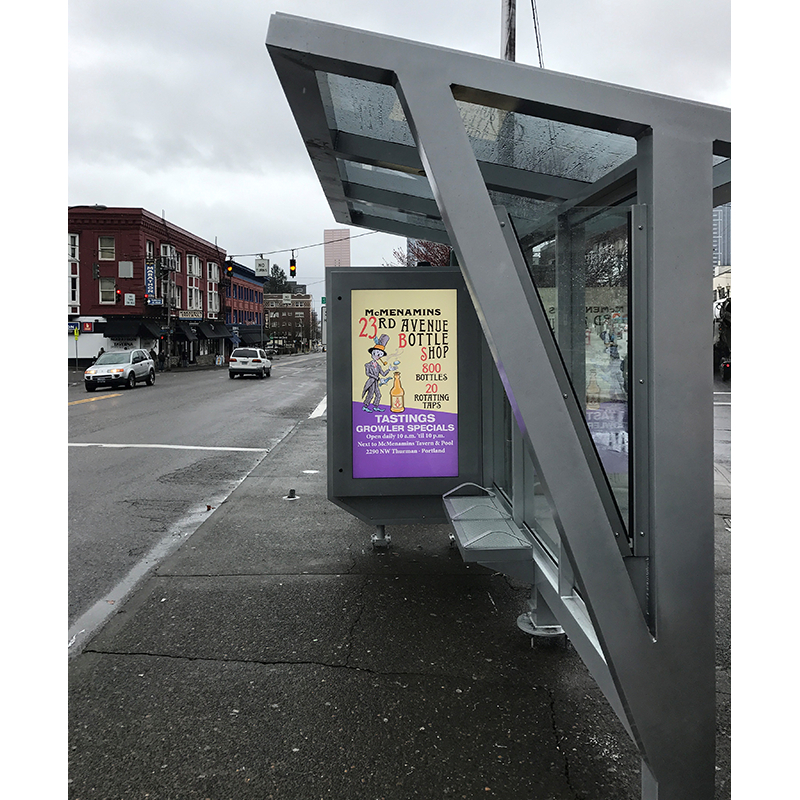 The shelters focus on a design that protect transit riders from West Vancouver weather through the use of a wider roof, integrated drain within the rear posts, back-to-back media display kiosk, 3/8” clear tempered glass, durable baked powder coat finish, and LED illumination. 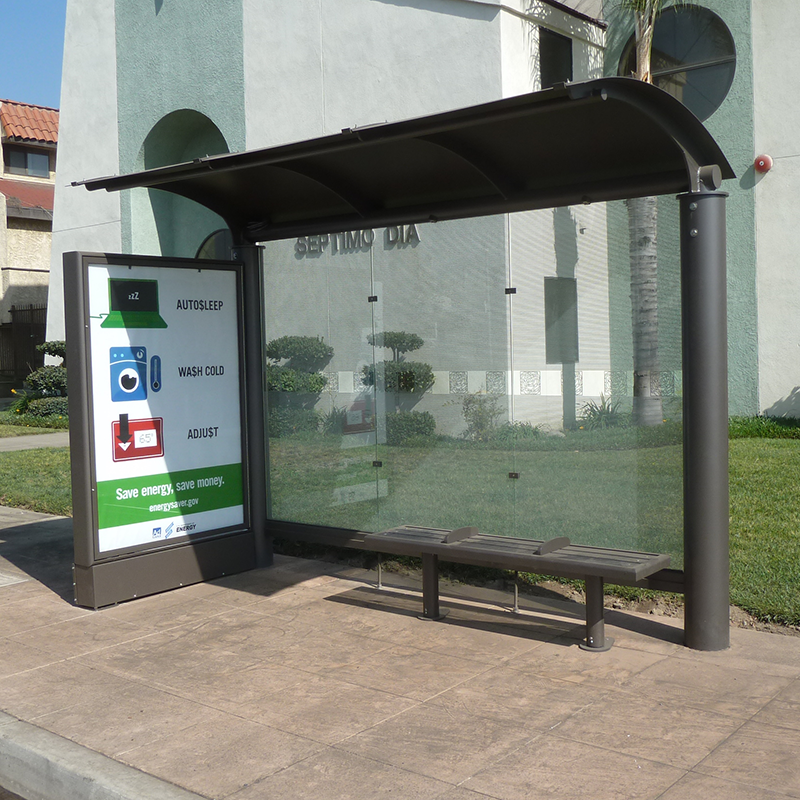 The City of Anaheim (CA) approved this design developed by Tolar Manufacturing and its out of home advertising partner. 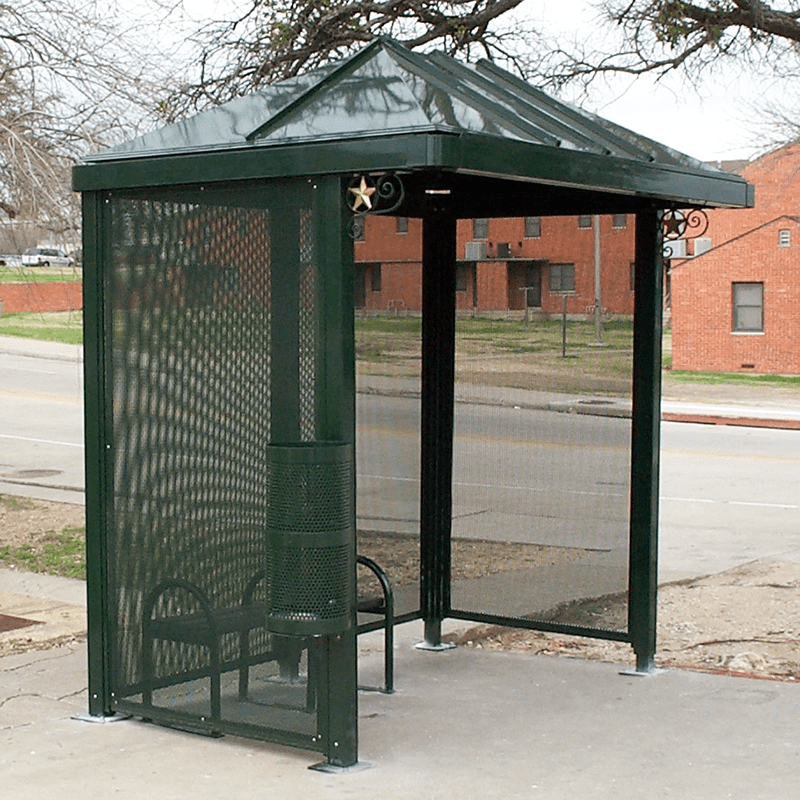 The 18’ hip roof shelter from Tolar’s Signature line features all aluminum construction, simulated tile, decorative finials, a flat back-to-back kiosk and a 12’ expanded metal bench. 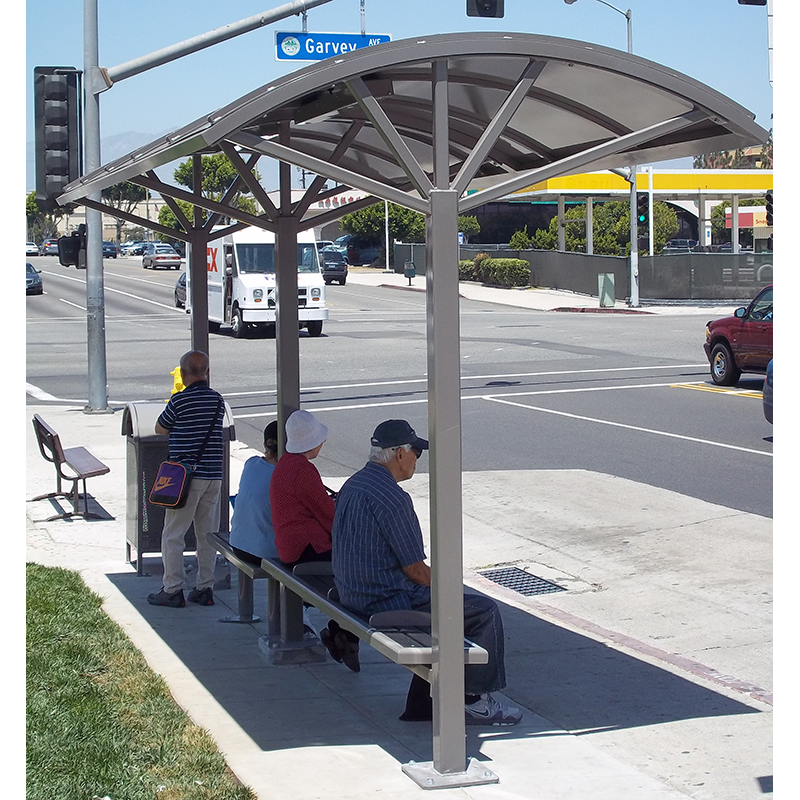 The modified hip design allows for installation in areas with limited right-of-way. 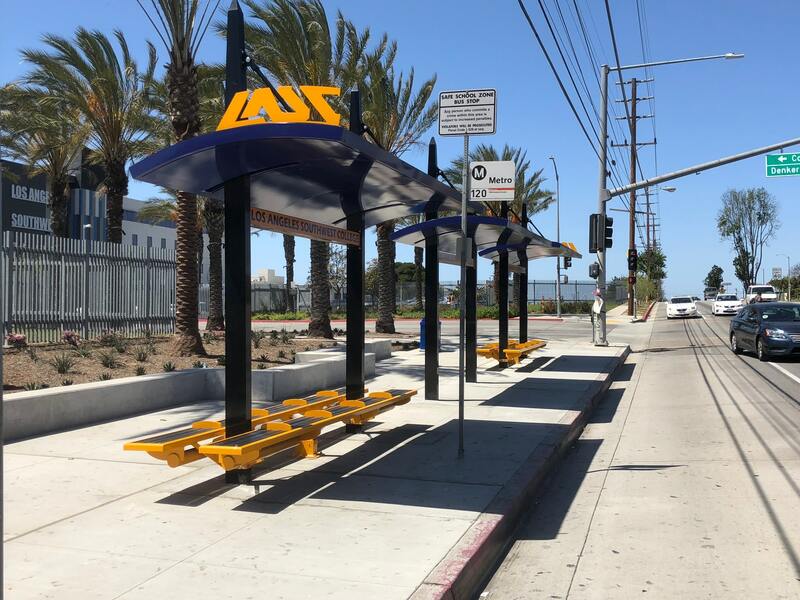 Tolar Manufacturing worked with the City of Azusa and the contractor developing the Azusa Metro Gold Line site to select shelters from our Sierra line, which matched the design and aesthetics of the modular street furniture solution for the adjacent Foothill transit stops. 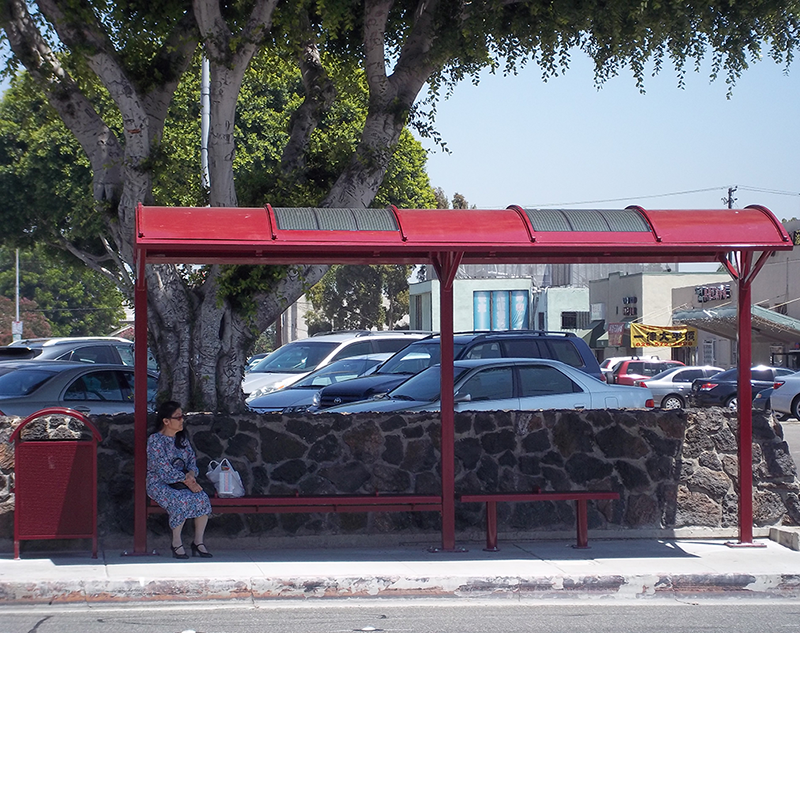 The shelters feature a 13’ length high peak roof with Gerard roof tile, perforated aluminum walls, integrated map case, perforated metal bench and dusk to dawn solar illumination. The Coachella Valley includes many diverse communities ranging from Palm Springs to Palm Desert and Cathedral City to Indio. 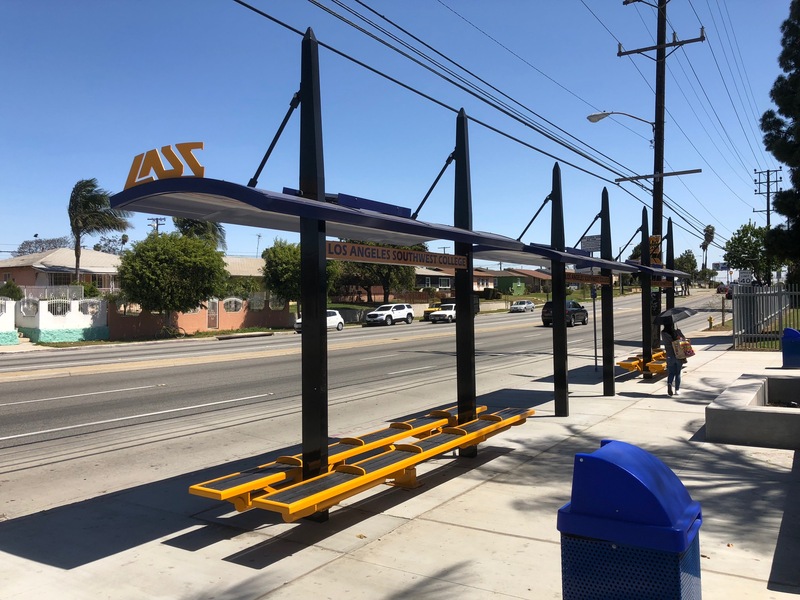 Sunline Transit Agency (Thousand Palms, CA) takes their responsibility of transporting customers on-time from point A to point B seriously with their environmentally friendly CNG fleet of transit coaches and development of clean, distinctive solar illuminated transit shelters. 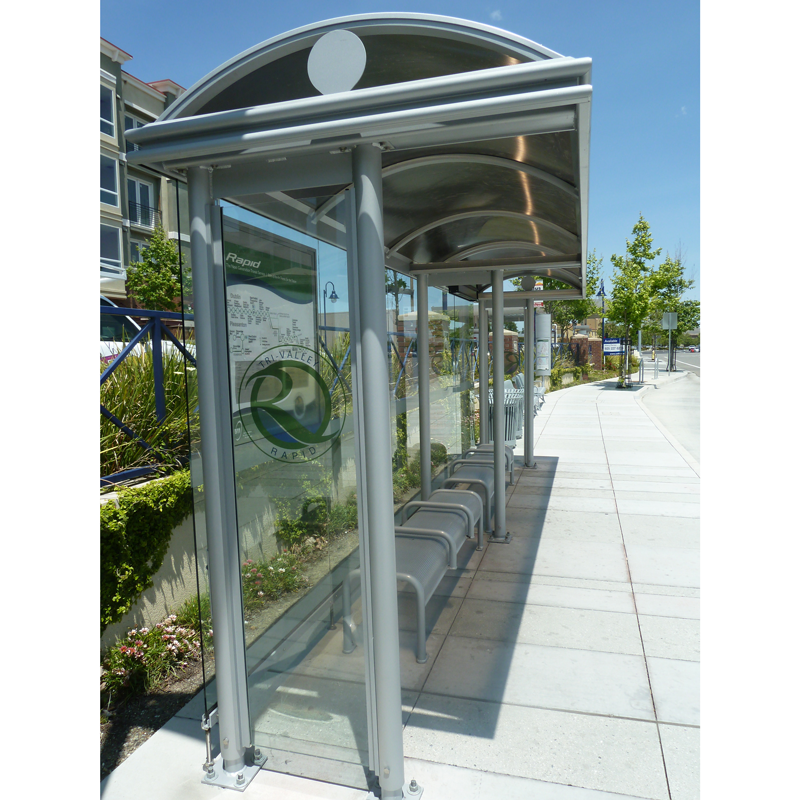 Through a competitive bid process, Tolar Manufacturing was awarded the opportunity to provide transit shelters, and related amenities based on our Sierra Series. 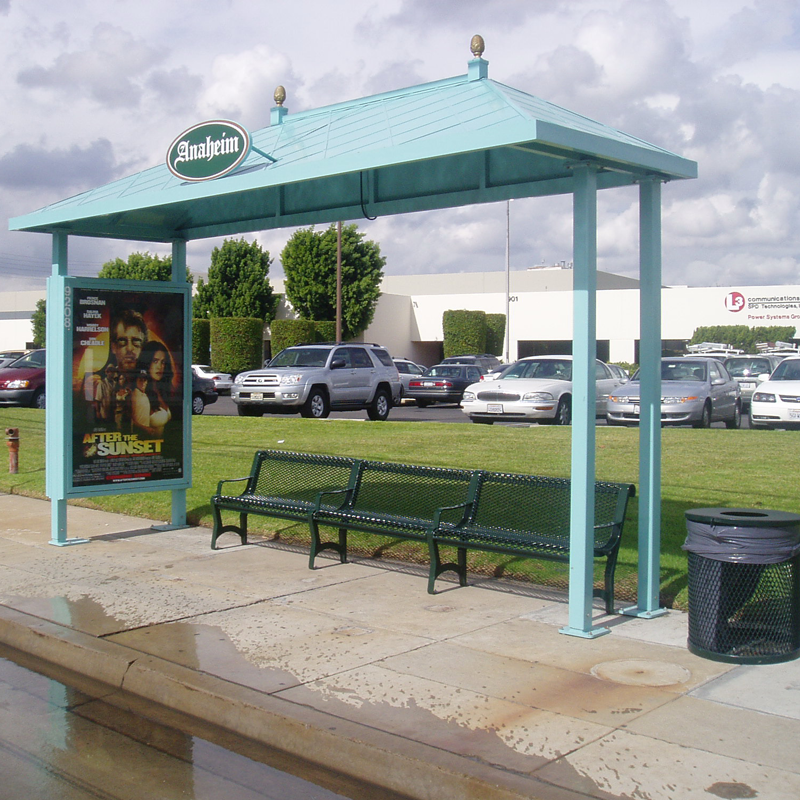 The shelters are designed to provide additional shade and comfort to Sunline’s valued customers through the use of three different shelter sizes in both advertising and non-advertising configurations. 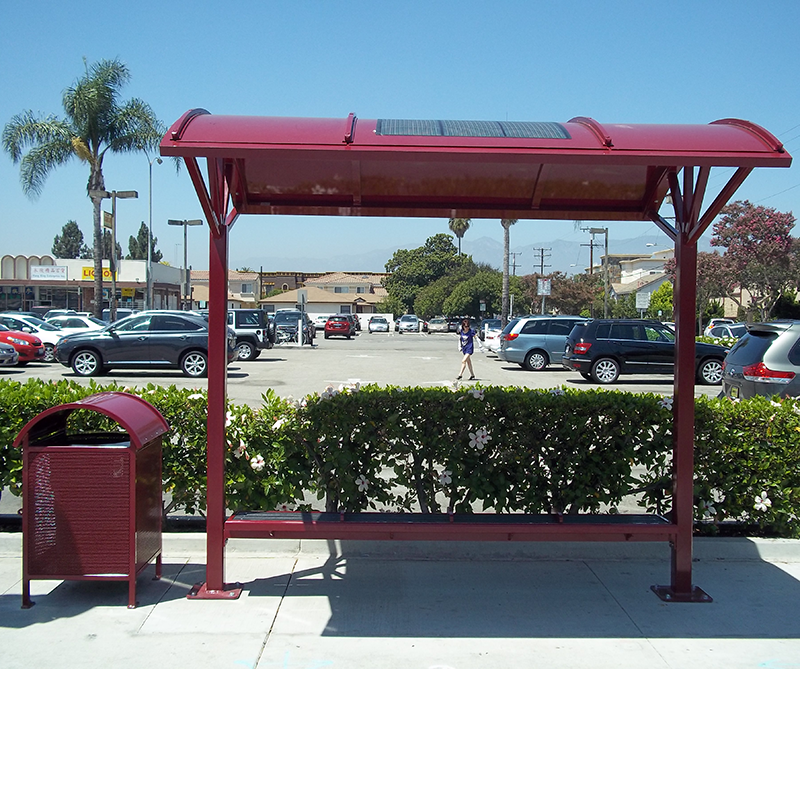 All shelters include a passenger information case, bench, trash receptacle and state of the art, reliable LED solar illumination. 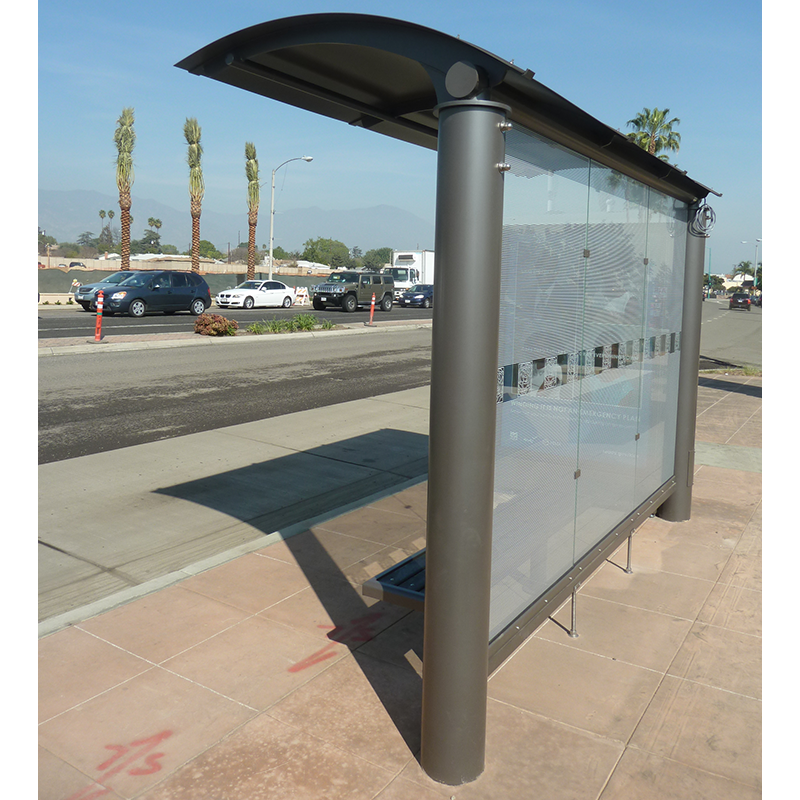 Tolar Manufacturing recently completed the design and fabrication of distinctive Signature series transit shelters for the City of Corona. 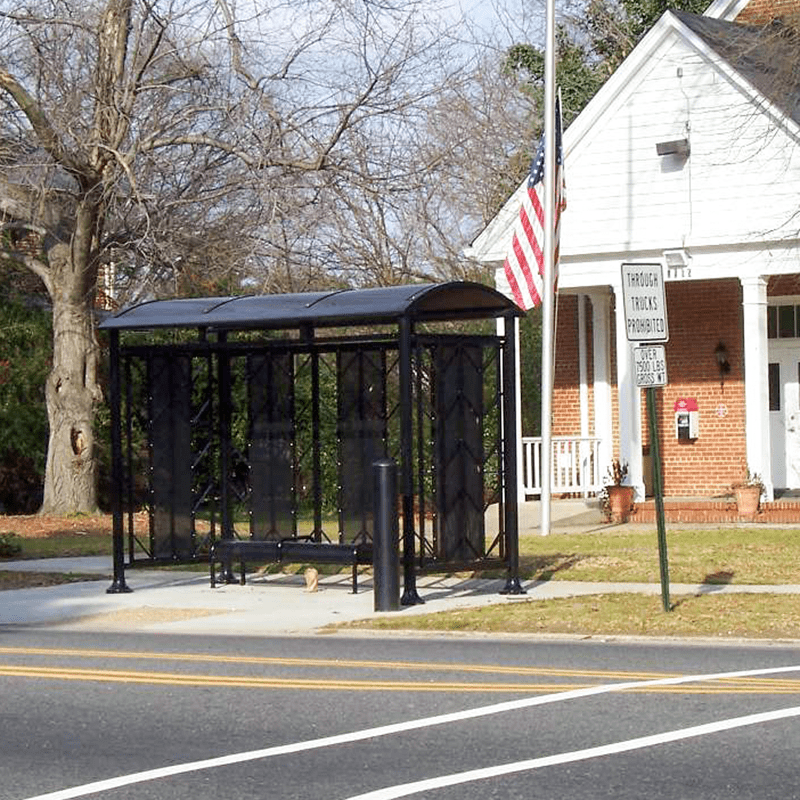 The contract, awarded through a competitive bid process, allowed Tolar a tremendous opportunity to show our expertise in the community that the company has proudly called home since 2001. 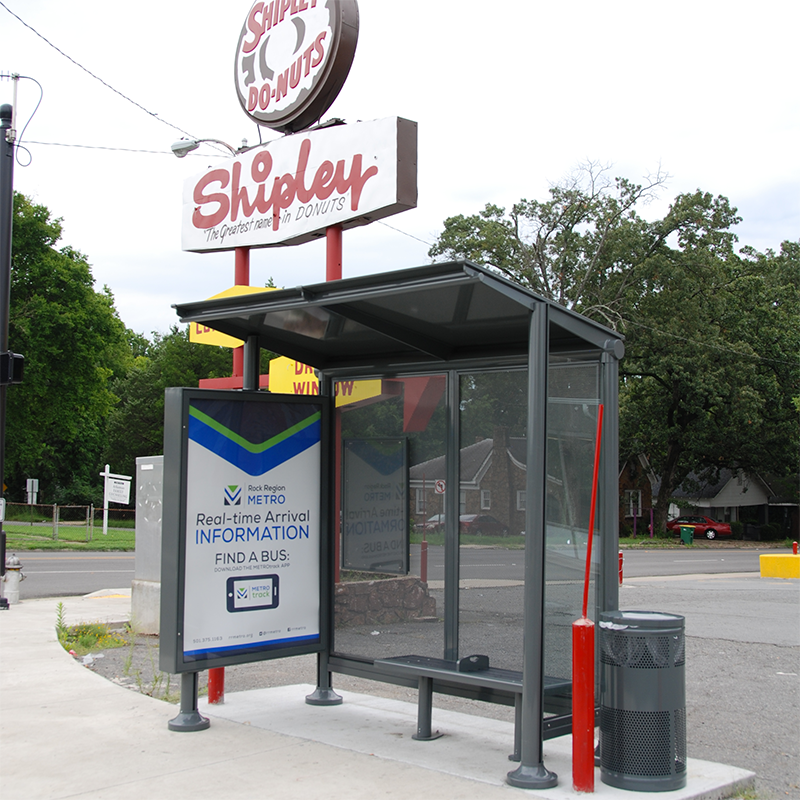 Residents and visitors to The Circle City now have best-in-class bus shelters to enjoy while waiting for coaches from Riverside Transit and the Corona Cruiser. 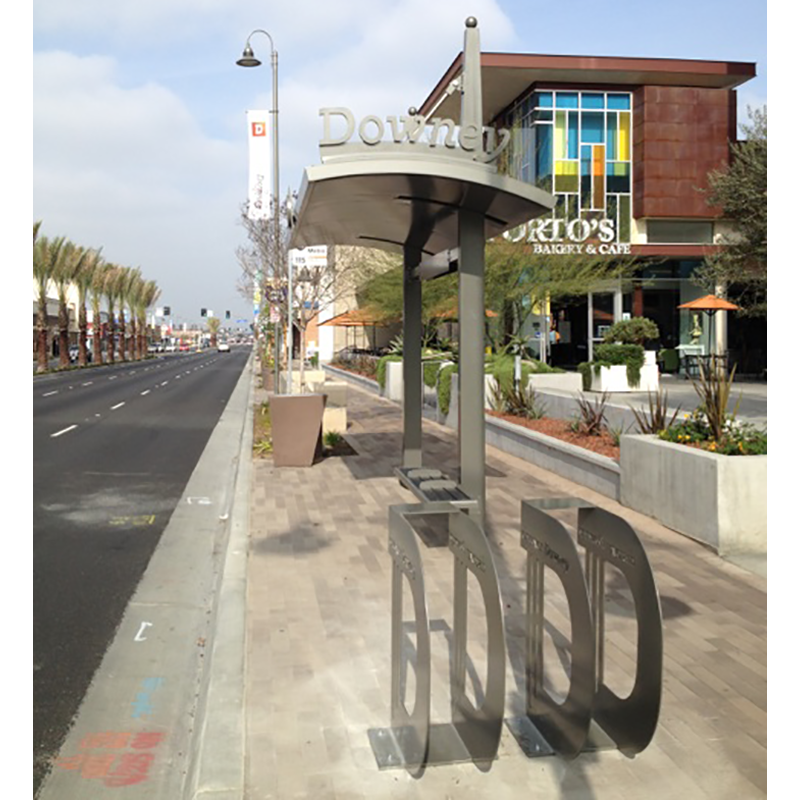 Located in southeast Los Angeles, the City of Downey is the birthplace of NASA’s Apollo space program. 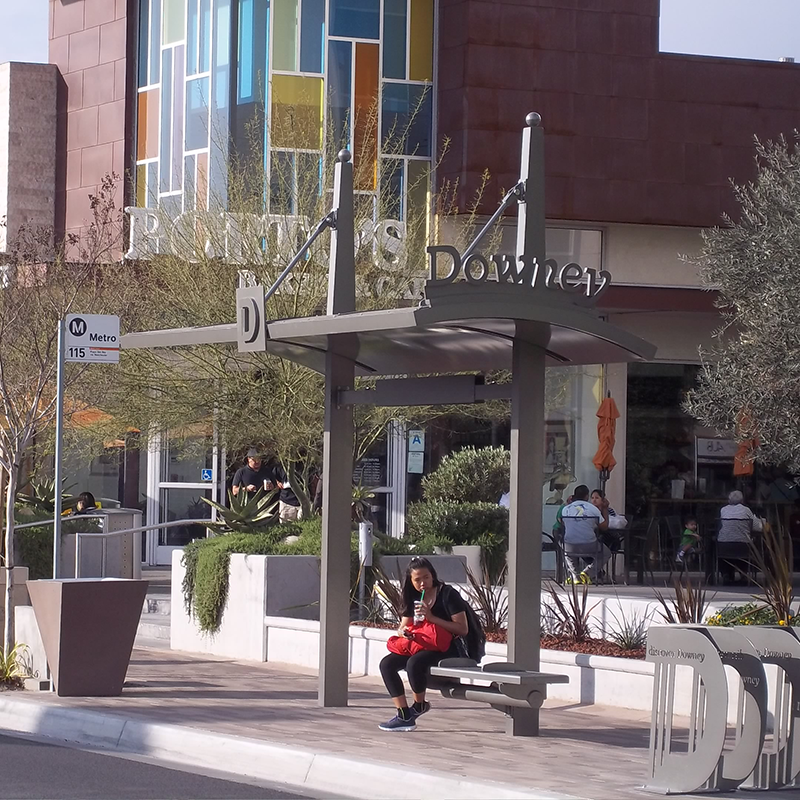 Downey continues to be a place of hard-working people with a strong sense of community. 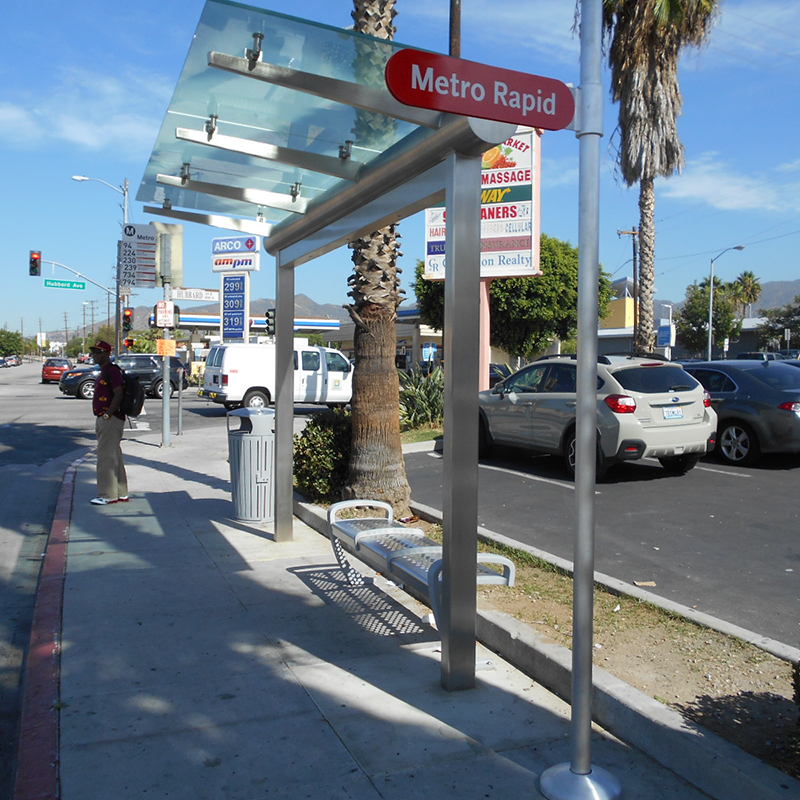 Public transit is a key component of the city’s mobility program. 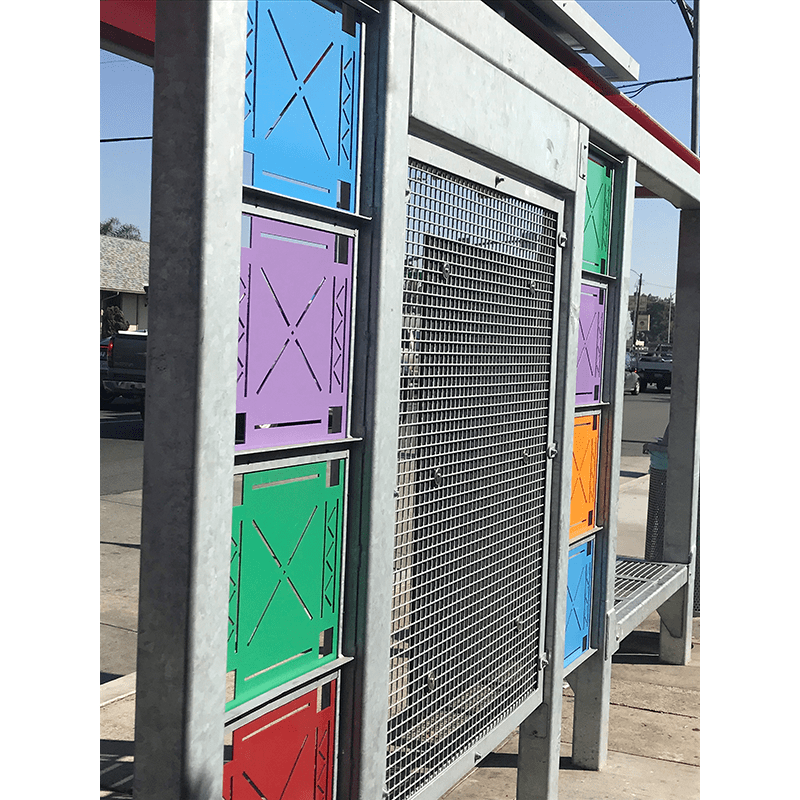 Tolar Manufacturing is proud to work with Downey staff to develop transit shelters that reflect the community and is in line with the city’s recent revitalization of a portion of Firestone Boulevard, a major thoroughfare. 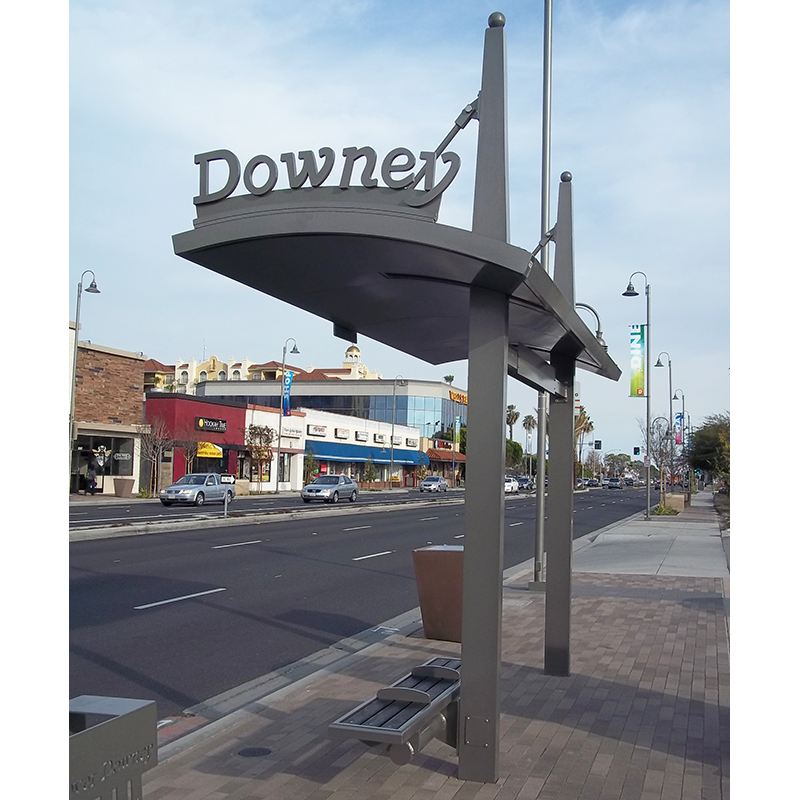 This Signature Series shelter was created with many unique elements to make it distinctively Downey. With transit service provided by the North County Transit District, the City of Escondido is home to San Diego County’s first bus rapid transit route. 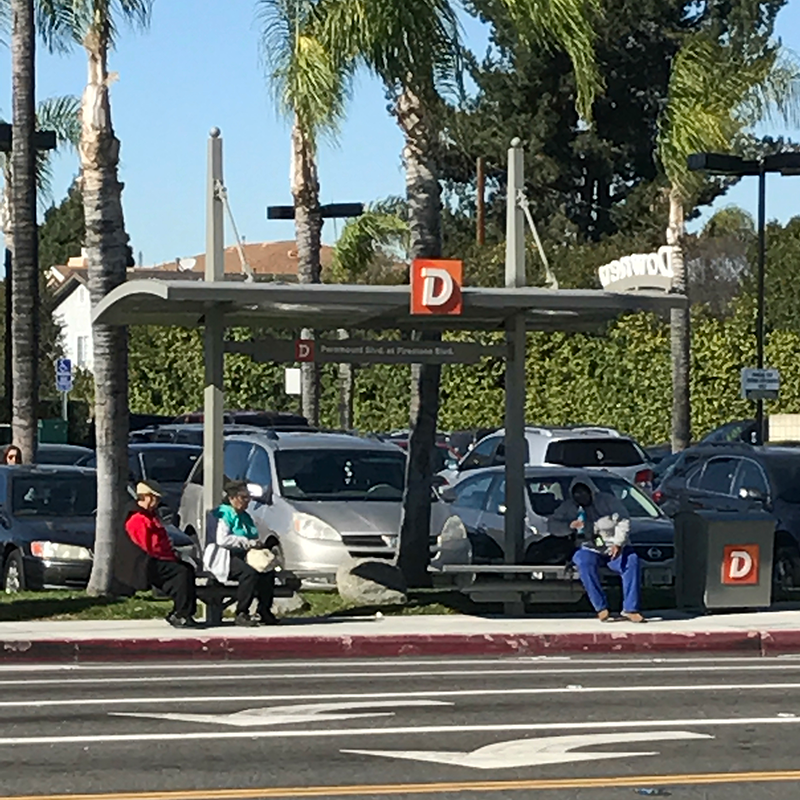 The six-mile route serves the Escondido Transit Center, the downtown business community, Bear Valley Parkway, Westfield North County Shopping Mall, and the Del Lago Transit Station. 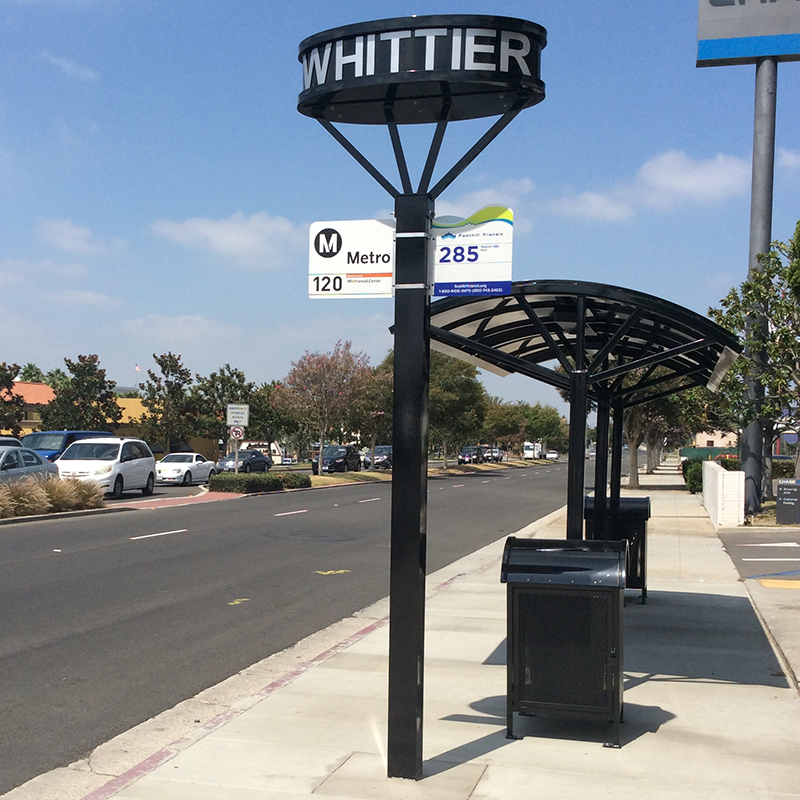 The route also connects to regional services, such as the SPRINTER, I-15 Express Buses, and the future I-15 Bus Rapid Transit system. 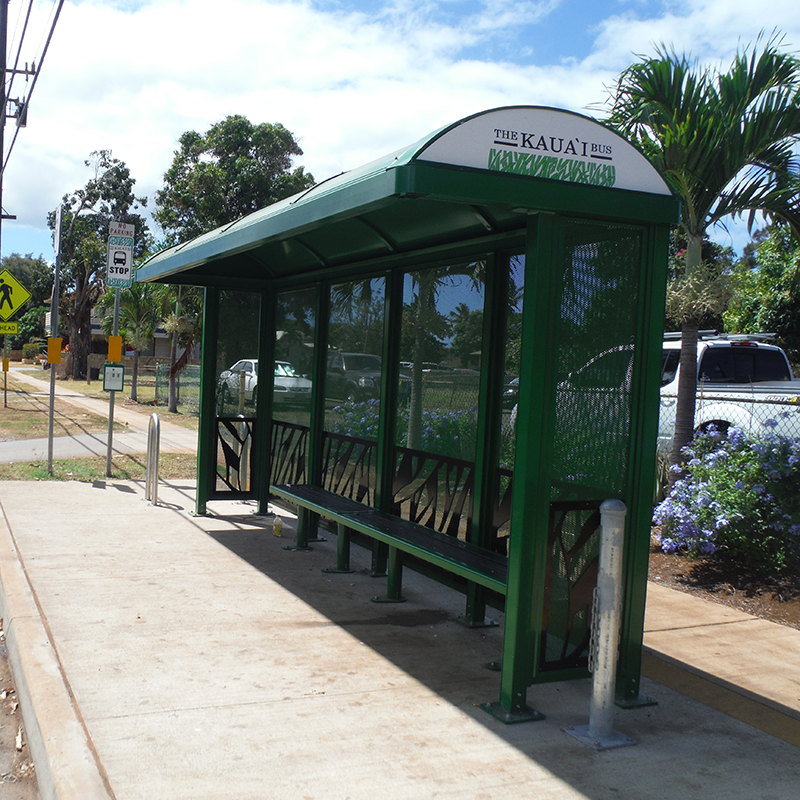 The project is essentially a $4 million upgrade to the existing BREEZE Rapid Route 350, making it a more convenient, rapid, and reliable route. 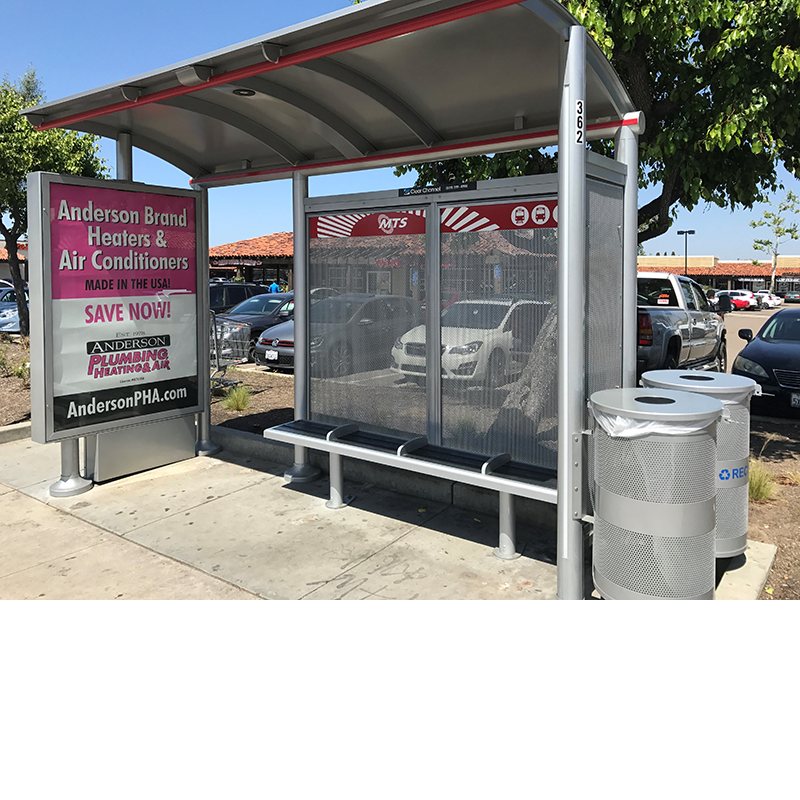 The first fully deployed Rapid Bus project in the region, it is a collaboration between the SANDAG, the NCTD, and the City of Escondido. 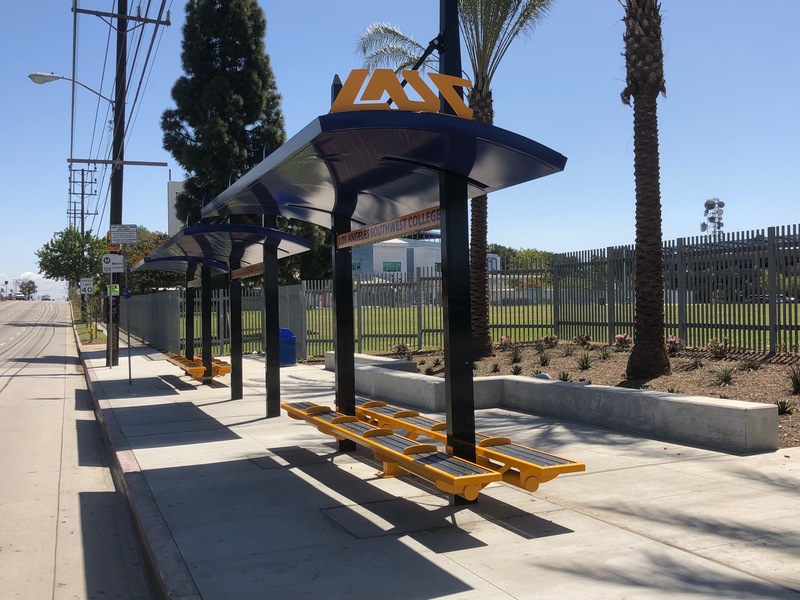 Amenities on the new system include new benches, Tolar transit shelters, display kiosks and digital message signs that indicate the arrival time for the next bus. 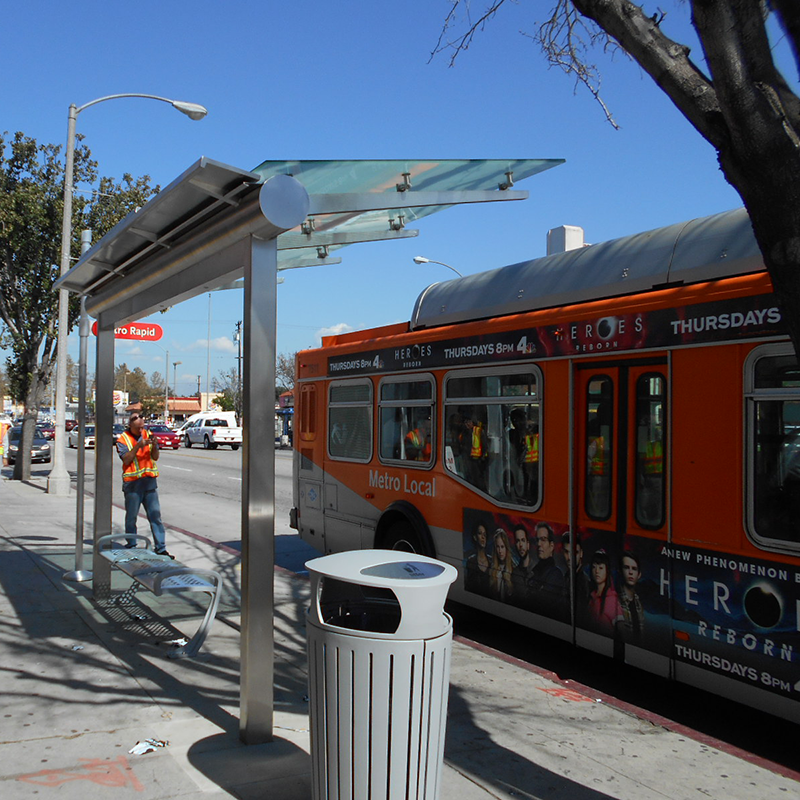 Many of the new Tolar fabricated shelters are lighted using solar power. 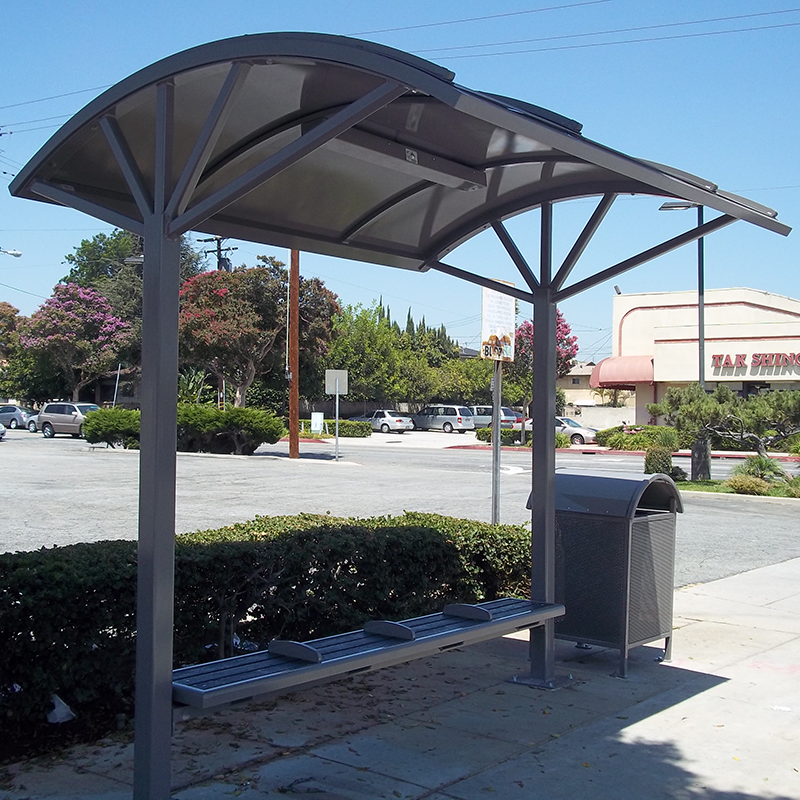 Tolar Manufacturing is pleased to introduce their latest Signature shelter line that was recently installed in Glendale. 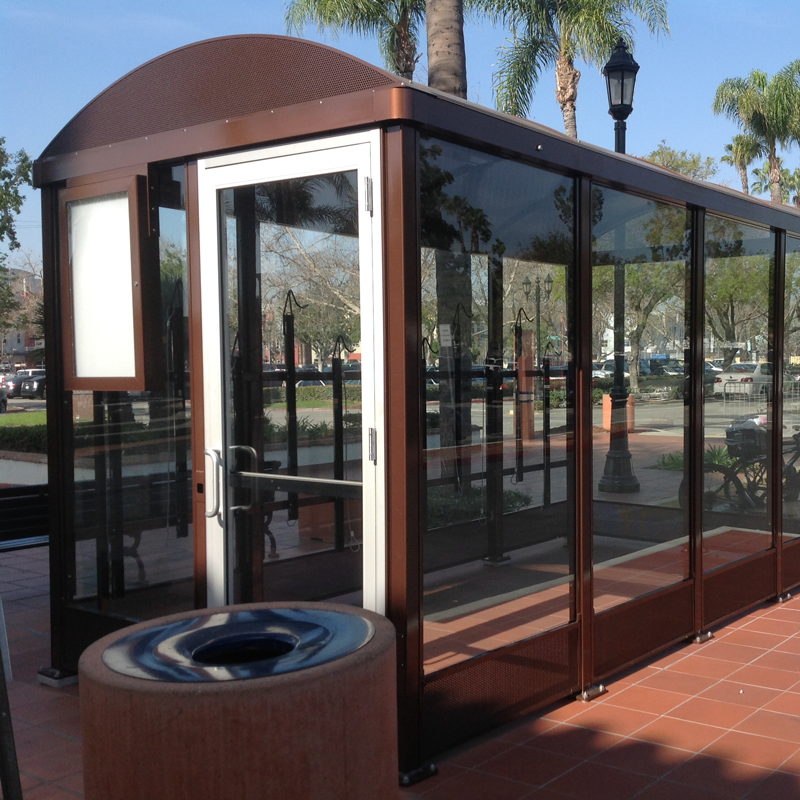 This shelter design is available in lengths from 10’ to 20’ and features an open European design that complements the Brand Avenue corridor. 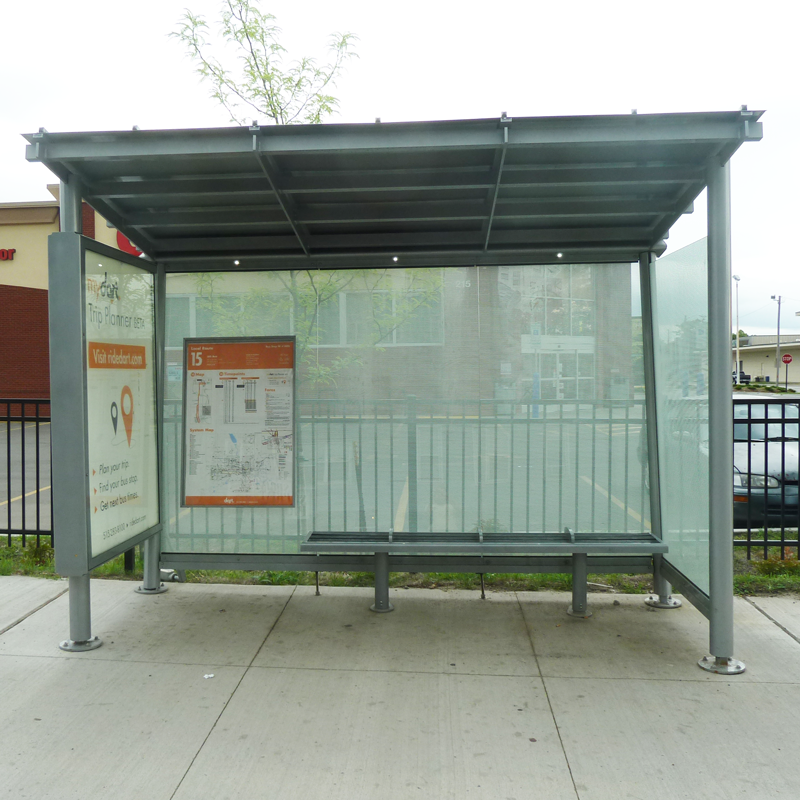 The surface mount shelter features Lexan roof panels, flat back-to-back ad kiosk and a matching streamlined perforated metal bench. 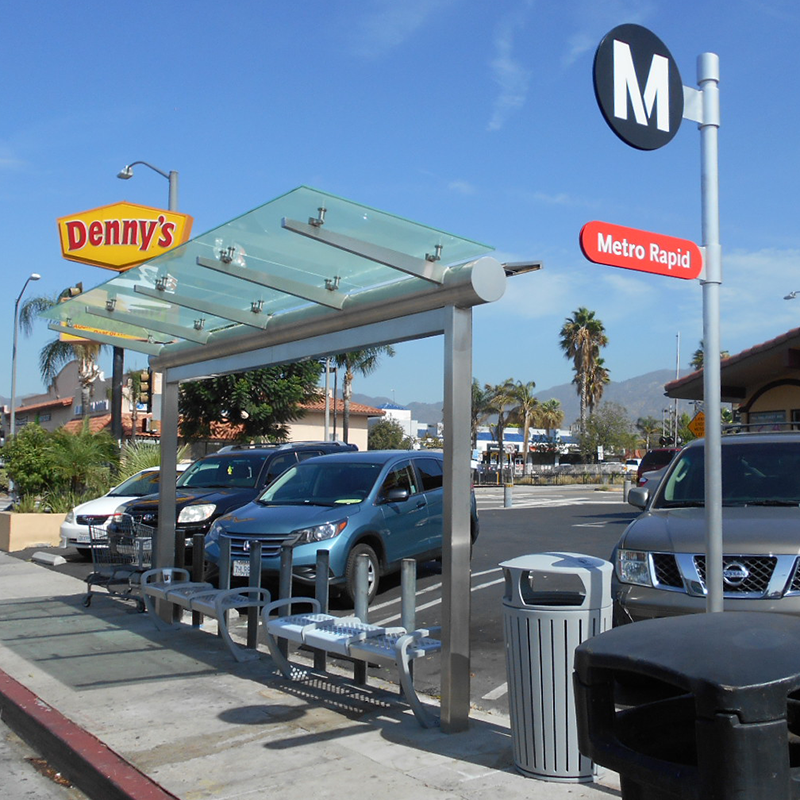 Hawthorne, CA in Los Angeles County has a very high transit ridership. 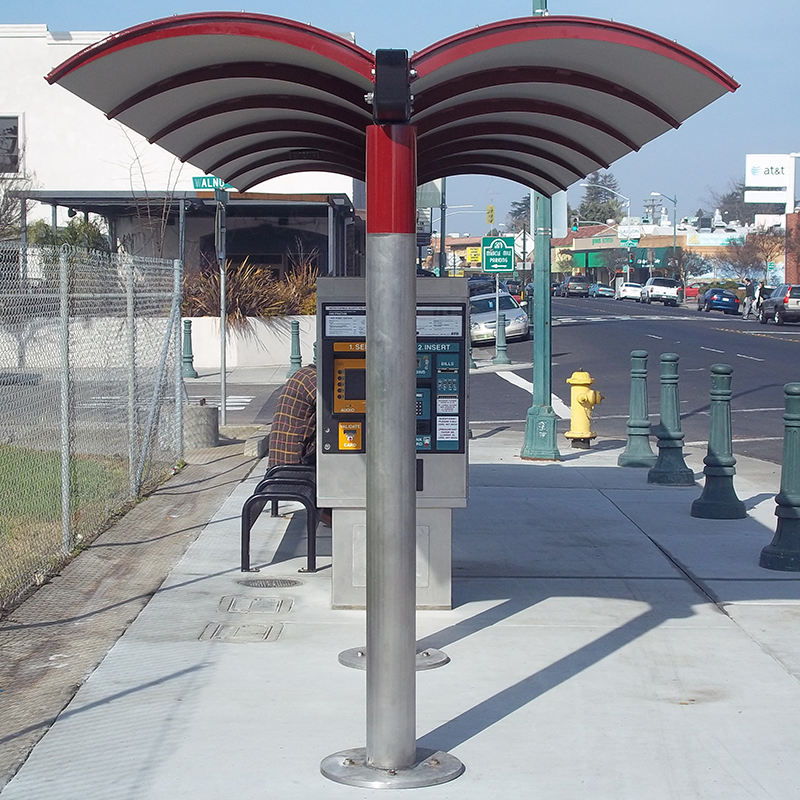 When the City planners made the decision to redesign Hawthorne Boulevard, they worked with Tolar Manufacturing to incorporate 26’ Euro Dome Roof shelters with customer herringbone walls, steel strap benches, integrated map case, LED illumination and a bicycle rack. 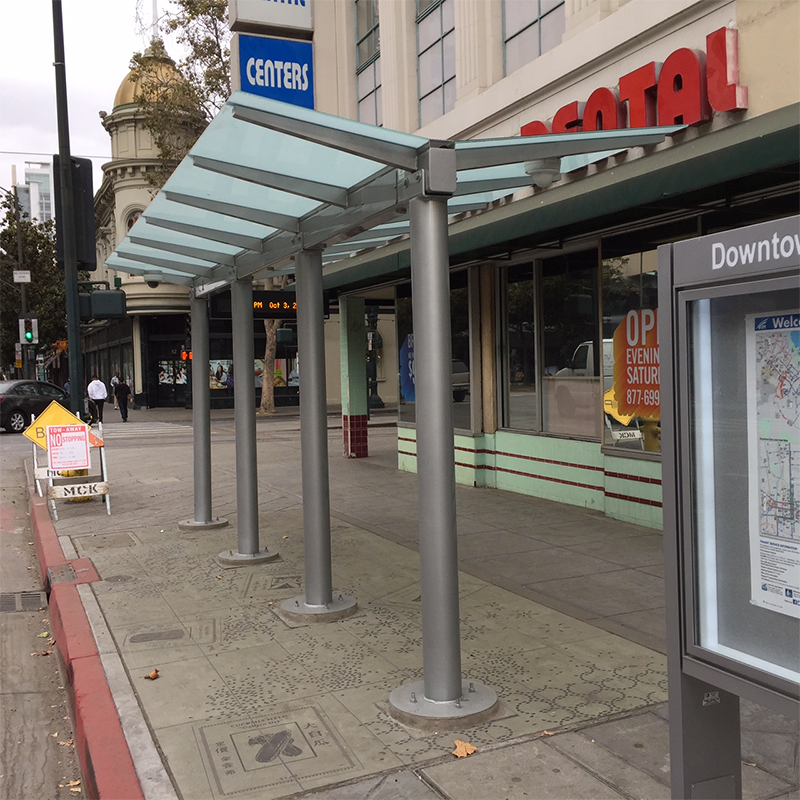 The Tolar team appreciates the City for placing value on the needs of transit riders when providing quality amenities that create a true Sense of Place™. 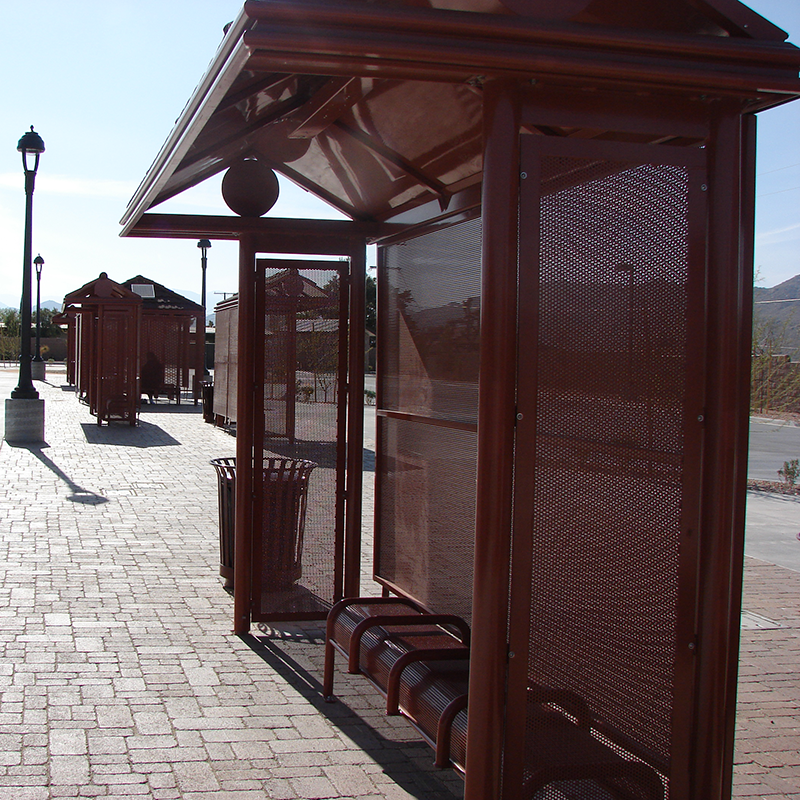 The Victor Valley Transit Agency selected Tolar’s Signature Pacific shelter design for use in many of their High Desert communities. 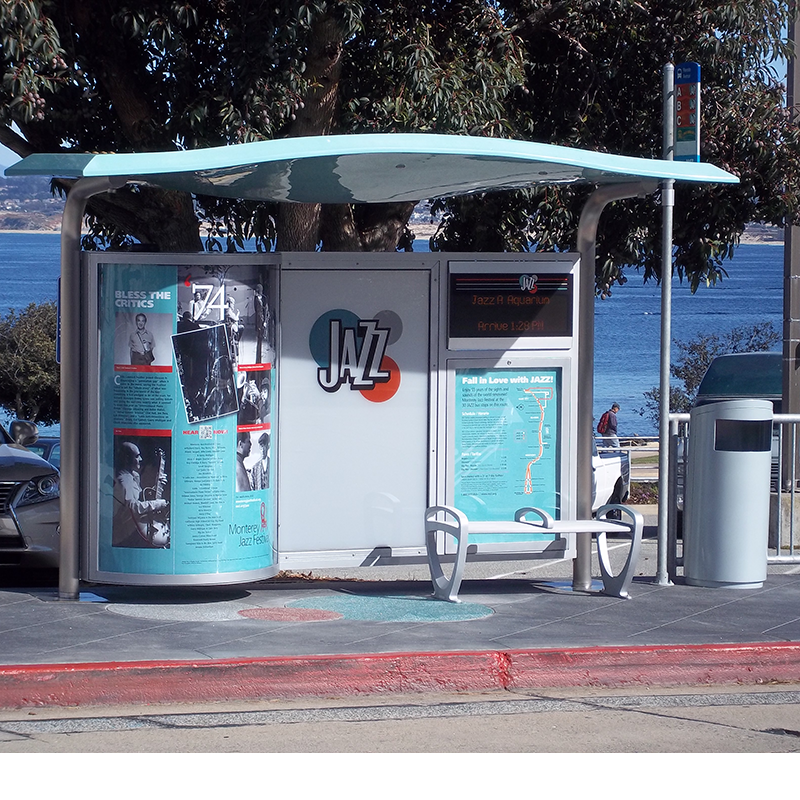 The design offers a high profile marketing tool for the transit district and a quality transit amenity for their riders. 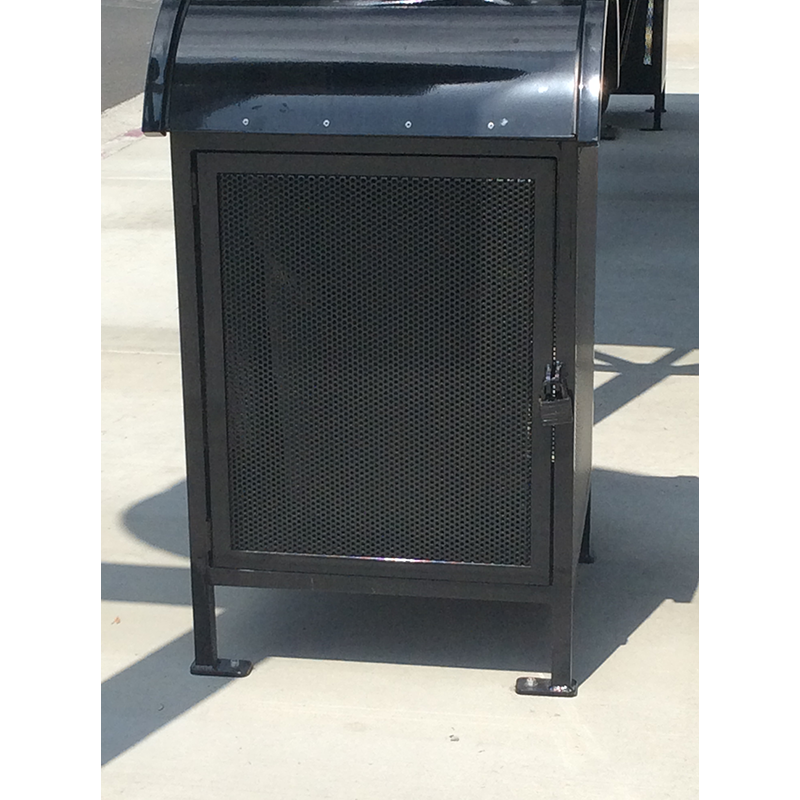 The shelter is available in ad and non-ad configurations and is accompanied by a perforated metal bench and shelter mounted trash receptacle. 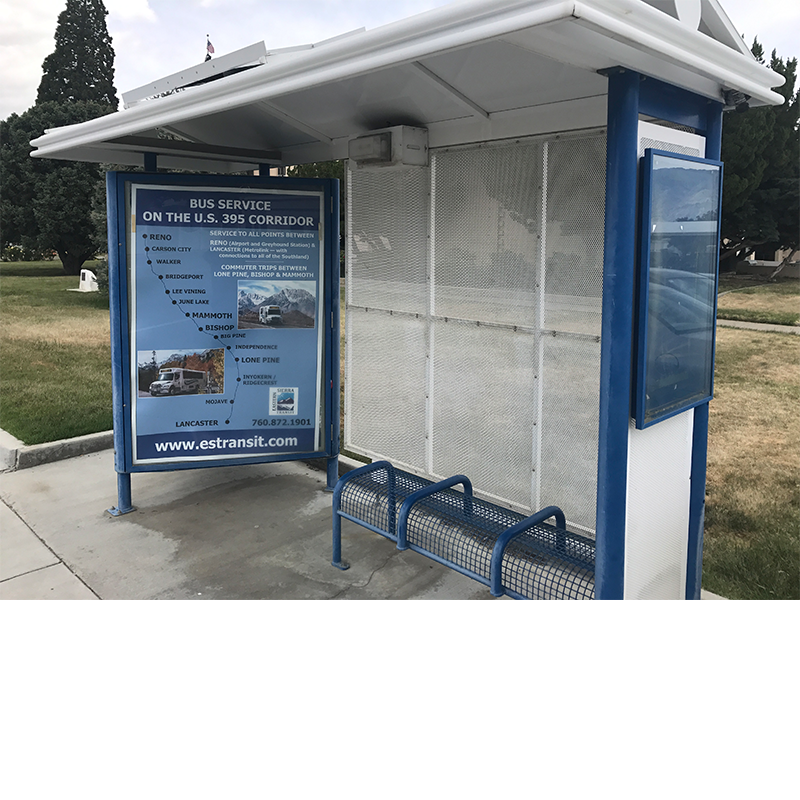 These Sierra series transit shelters have been creating a Sense of Place™ for Eastern Sierra Transit in the high desert of Independence, CA since 2001 and are still relevant today! 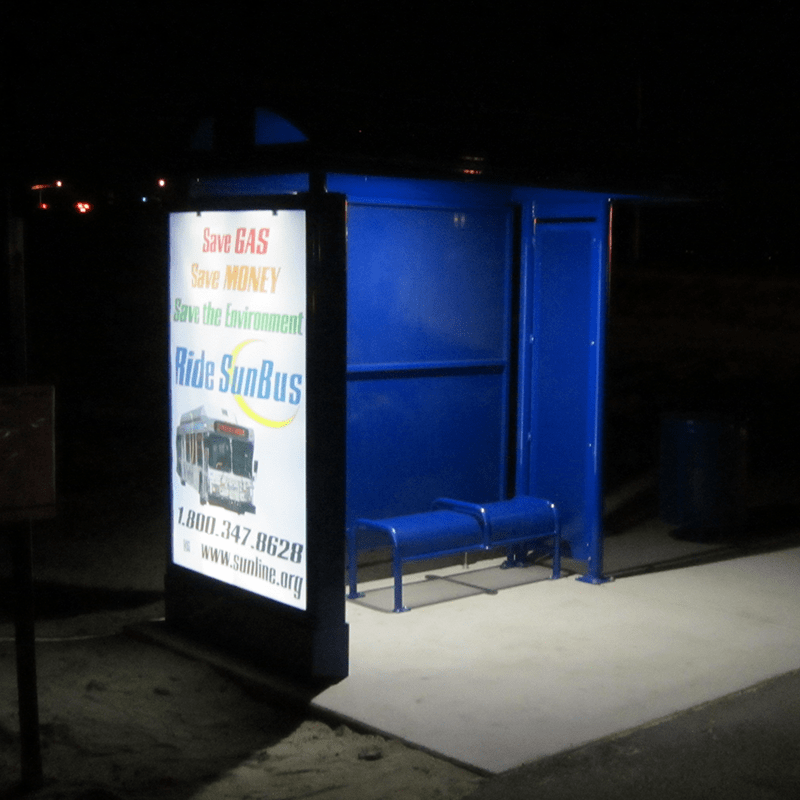 The shelters are placed along the agency’s popular highway 395 service. 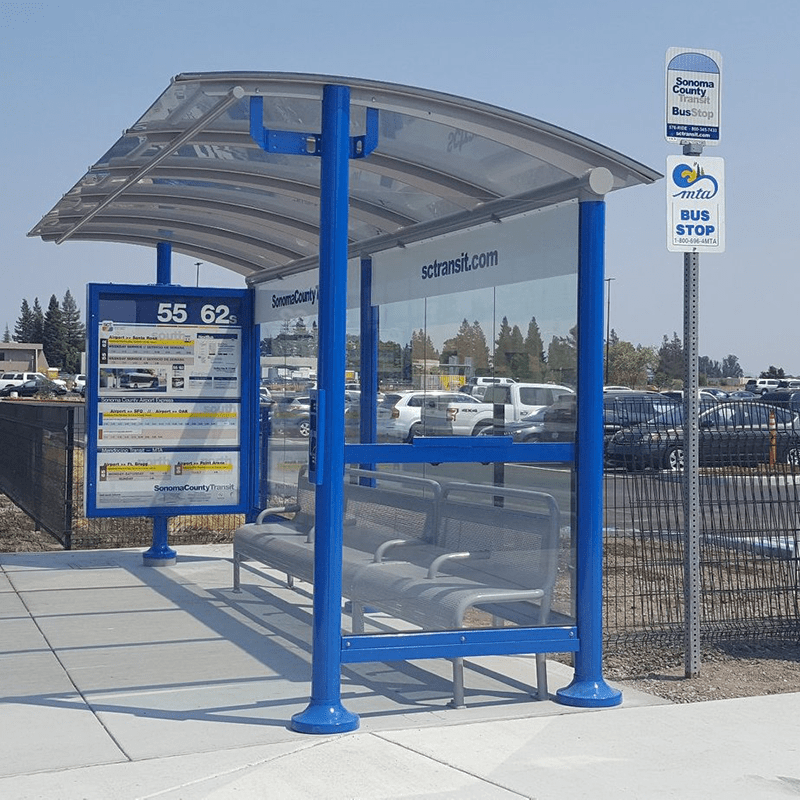 Tolar Manufacturing was fortunate to be selected to design and fabricate four unique shelter styles to kick-off the Livermore Amador Transit Authority’s Tri Valley Rapid BRT Service. 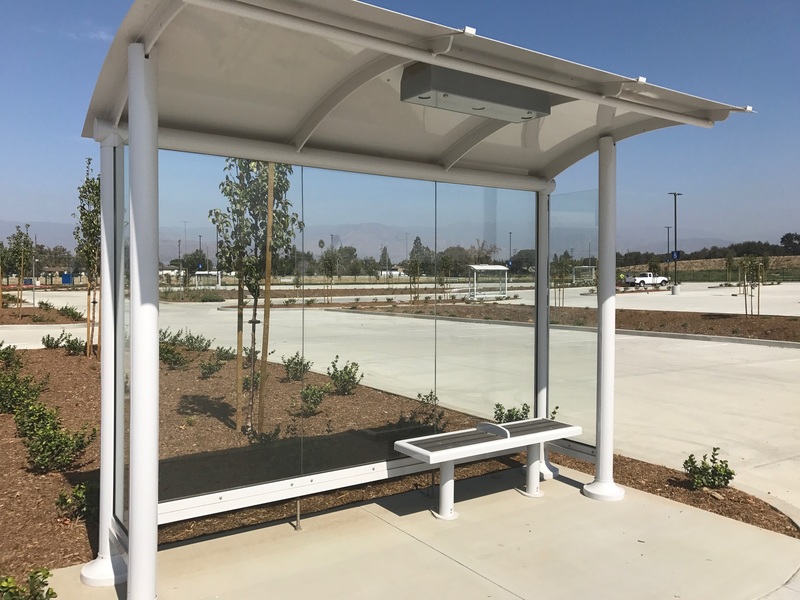 Tolar used its state of the art engineering software and worked closely with LAVTA, their design team, the agency selected contractor and other vendor supplied elements, to custom design transit shelters for the project using a combination of both our Signature Sunset and Sierra lines. 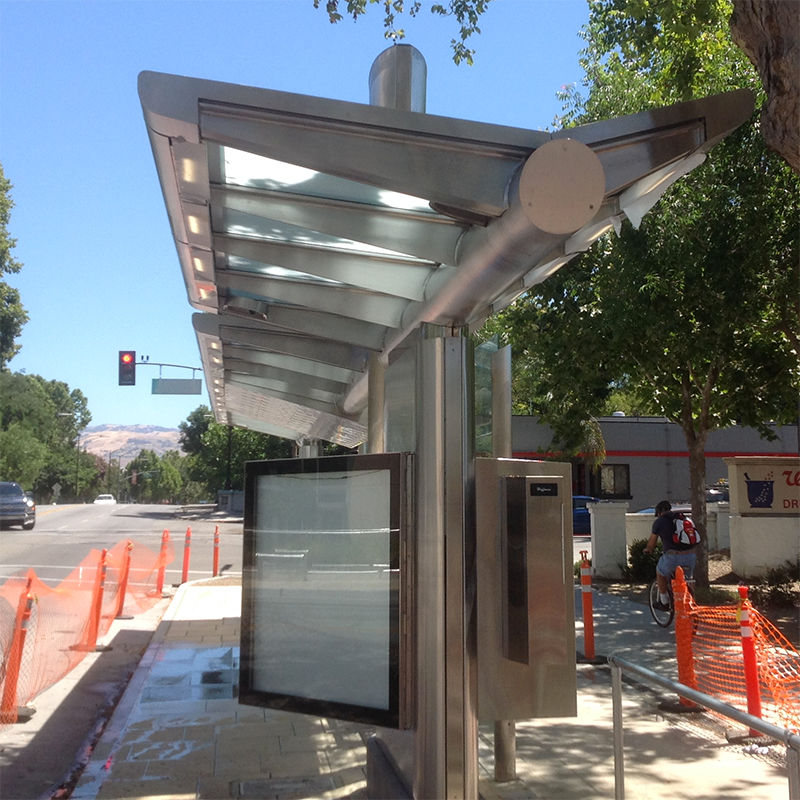 Unique elements of the shelter include Tri-Valley laminated glass, radius roof and many other features used to brand the project. The project also included a custom paint finish. 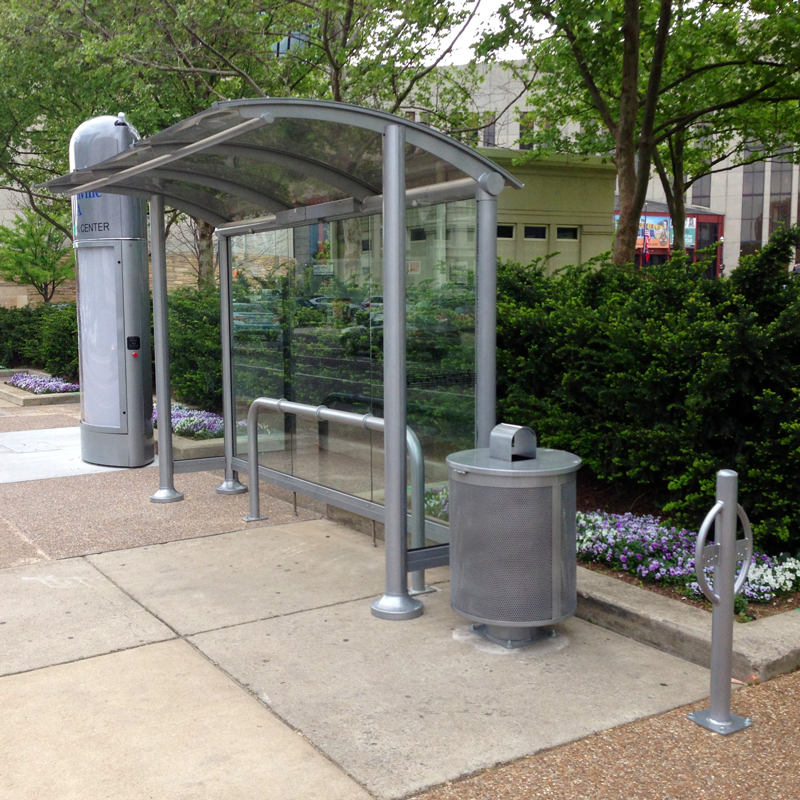 Tolar Manufacturing worked with the awarded contractor, their installation contractor, and multiple departments at the transit agency to execute four sizes of stainless steel transit shelters to provide passengers the amenities they need across the multiple jurisdictions served by Metro’s Rapid service. 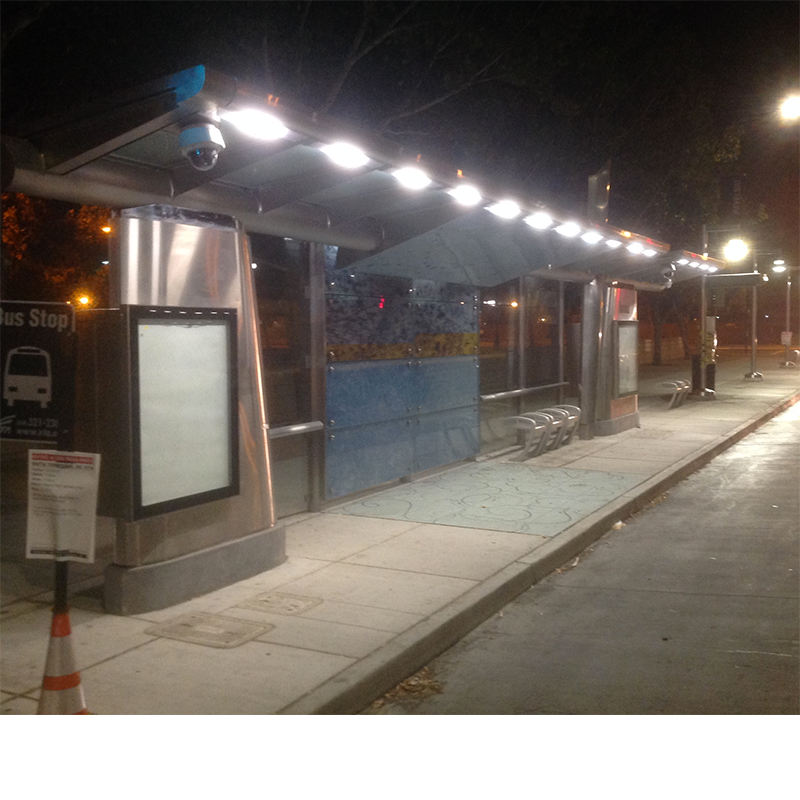 With stainless steel framing, laminated glass roof panels and dusk-to-dawn solar powered LED illumination. 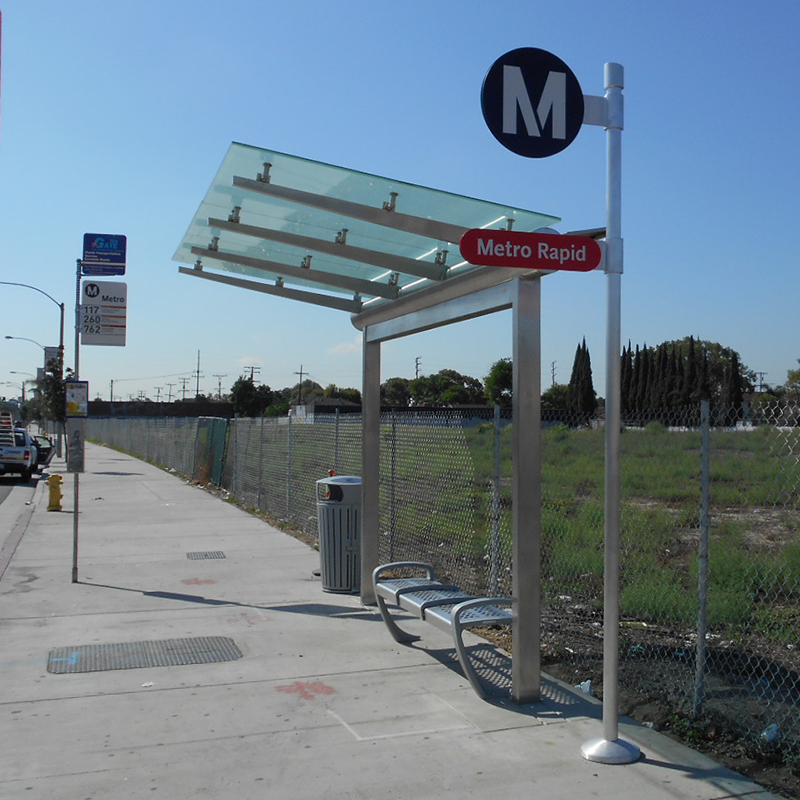 The stops are complemented by a brushed aluminum Metro branding pole. 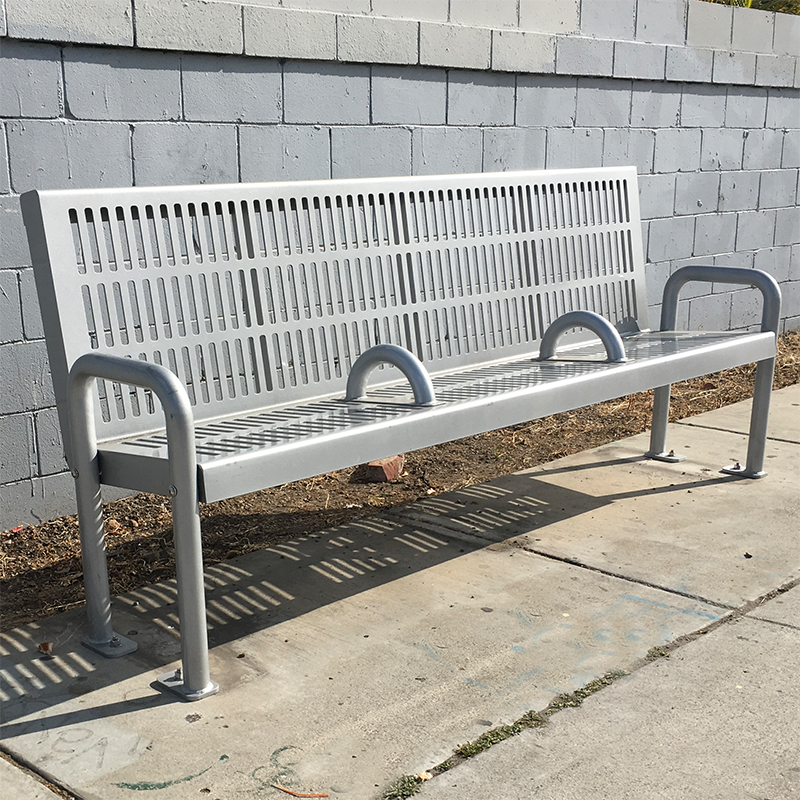 Tolar Manufacturing, though a competitive procurement process, was awarded the opportunity to design and fabricate a new street furniture program for the residents of Lynwood. 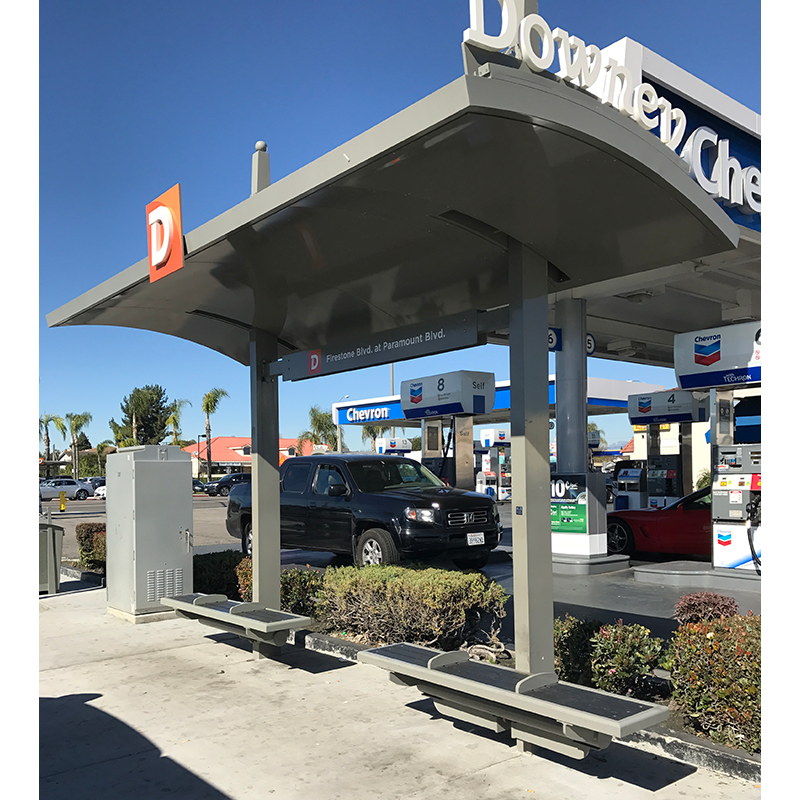 From our Signature Sunset series, these 12’ and 17’ shelters feature 3/8” heat formed roof panels, custom location branding, spun escutcheon covers, dusk to dawn LED solar illumination, 8’ steel strap Lynwood bench and matching trash receptacle. 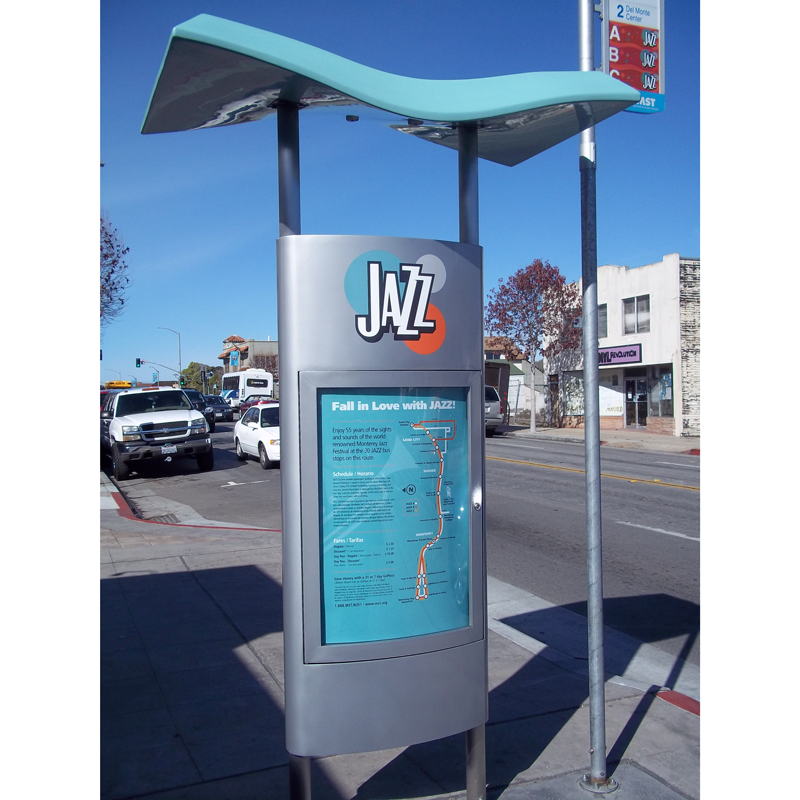 Monterey, CA is known for many things, from its world class aquarium to its internationally recognized Jazz Festival. 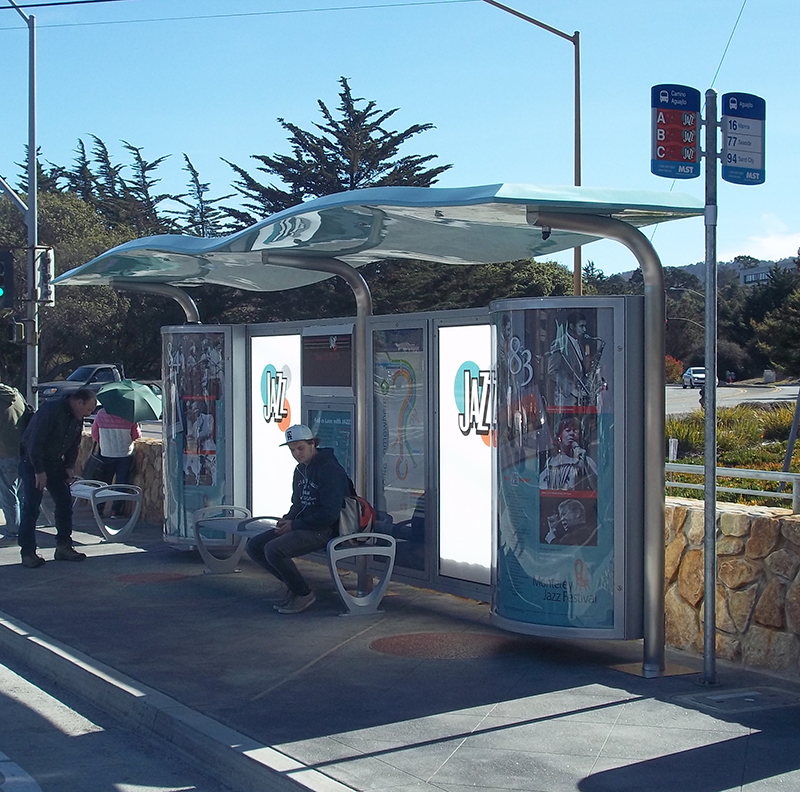 Working collaboratively, the professionals from MST and Tolar Manufacturing brought together many distinctive elements to design and produce another world-class project – BRT shelters and information display totems. 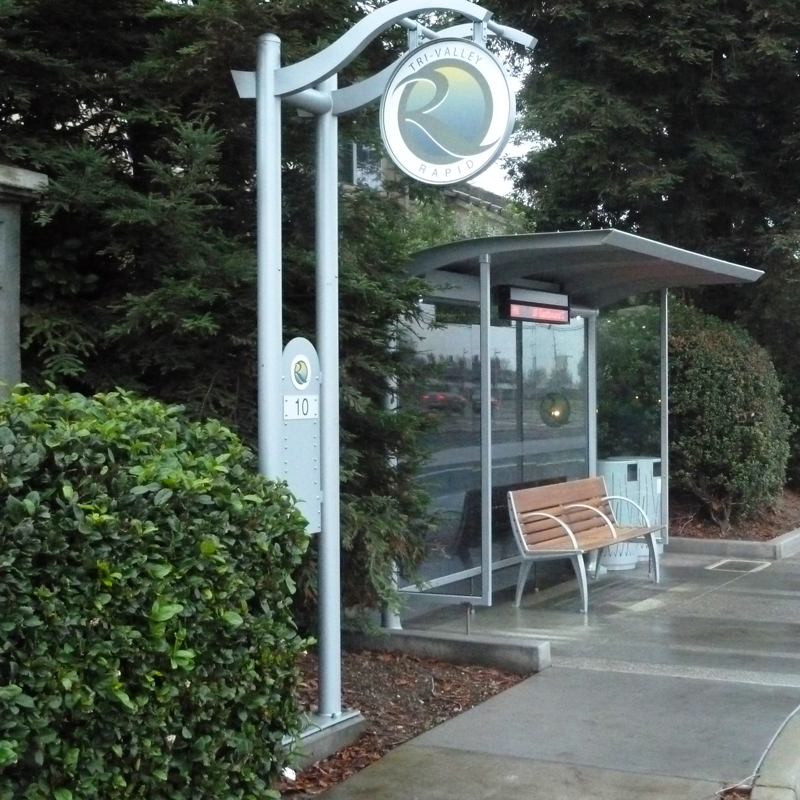 The design brings together many distinctive elements including a fiberglass roof, radius media display kiosk, curved stainless steel support posts, real-time information display, passenger information, and unique agency branding including hardscape accents and PV power for the lighting and information display. 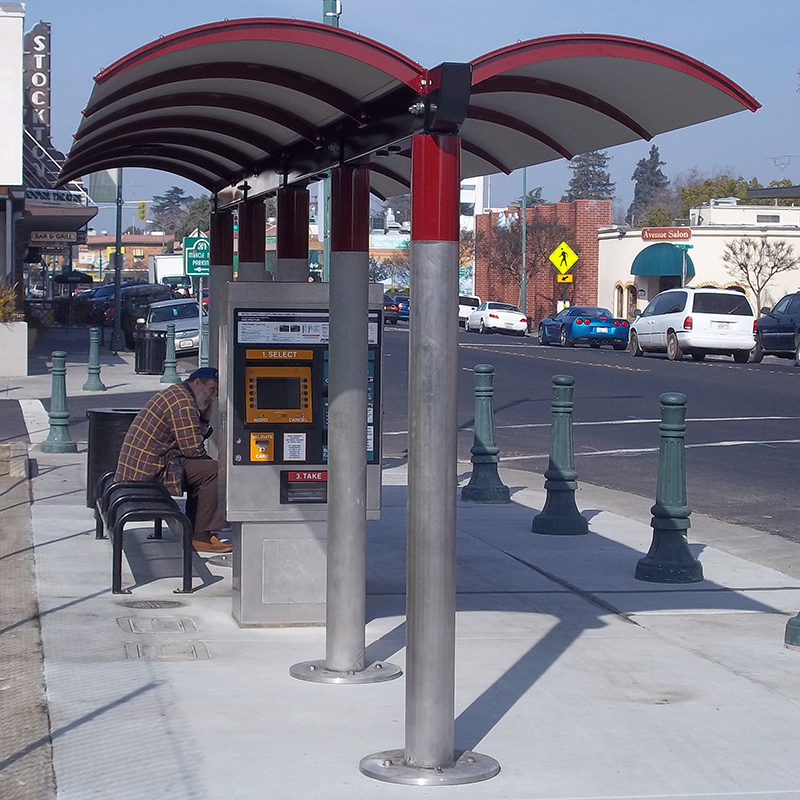 Kudos to the MST team for developing a brand unique to their community, with Tolar’s Signature BRT shelters and totems, in a distinctive way that promotes transit shelters through their community culture. We are proud to be a small part of these big efforts. 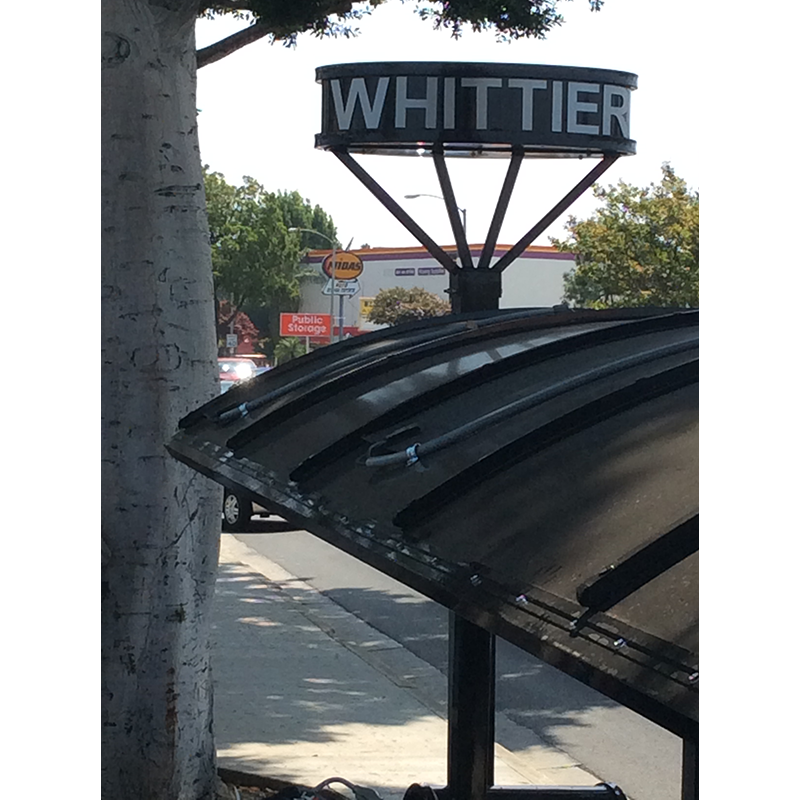 The City of Monterey Park is located east of Los Angeles in the San Gabriel Valley. 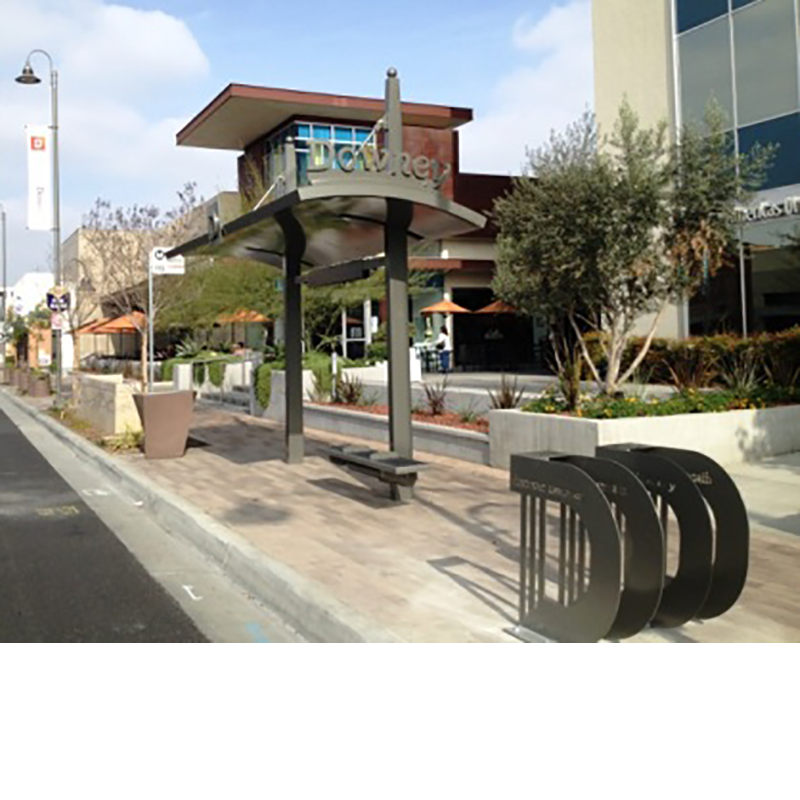 There is a significant Asian population in the community making it a great destination for food and shopping. 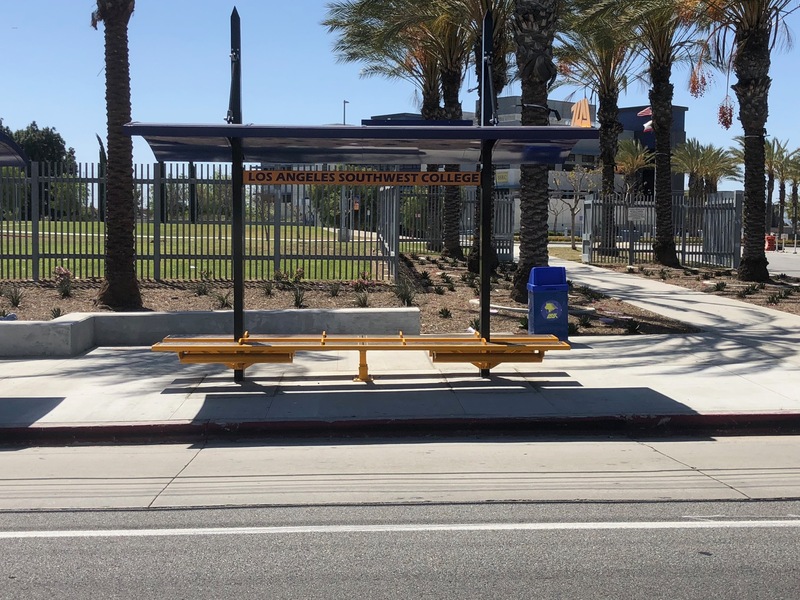 The residents of the community utilize both the local Spirit bus serve as well as LA Metro to make their way around the valley. 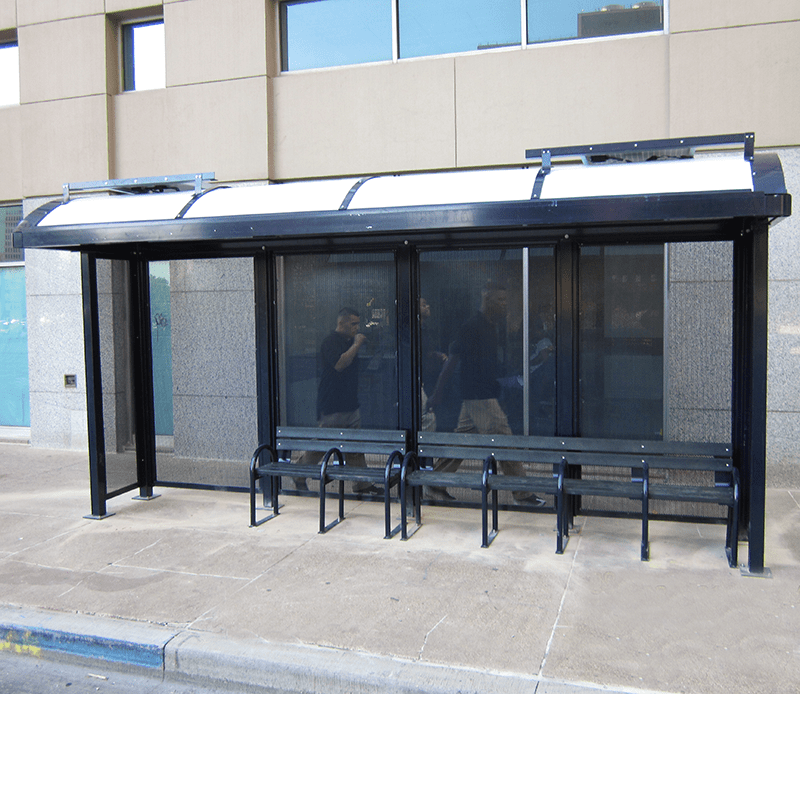 Tolar Manufacturing, working with one of our certified installation contractors was fortunate to be selected to provide shelters from our Signature Voyager series to provide additional comfort to their transit users. 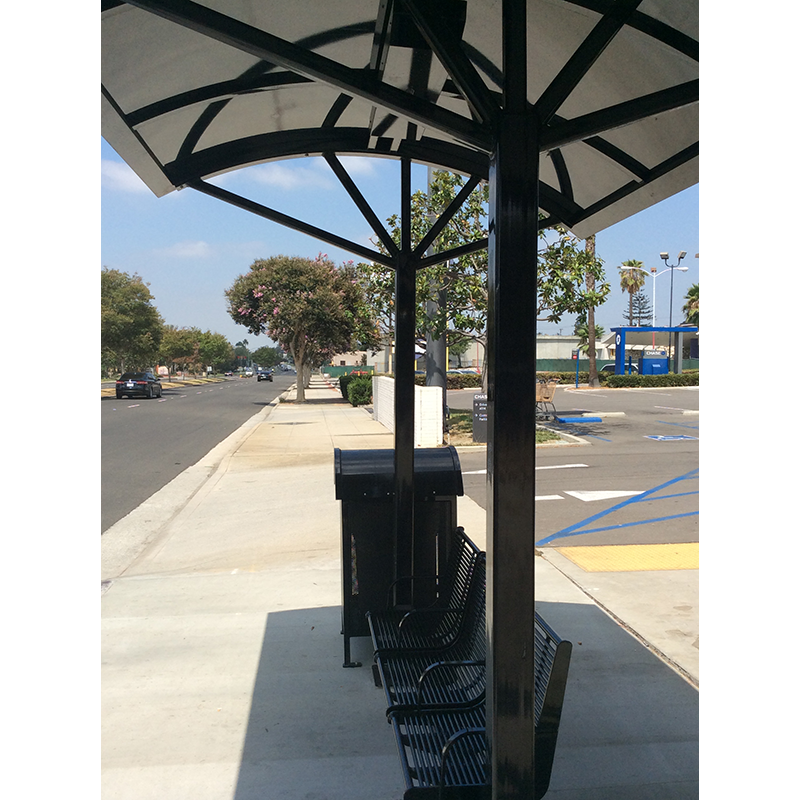 The shelter features an open spoke design with an integrated recycle slat bench and matching trash receptacle. 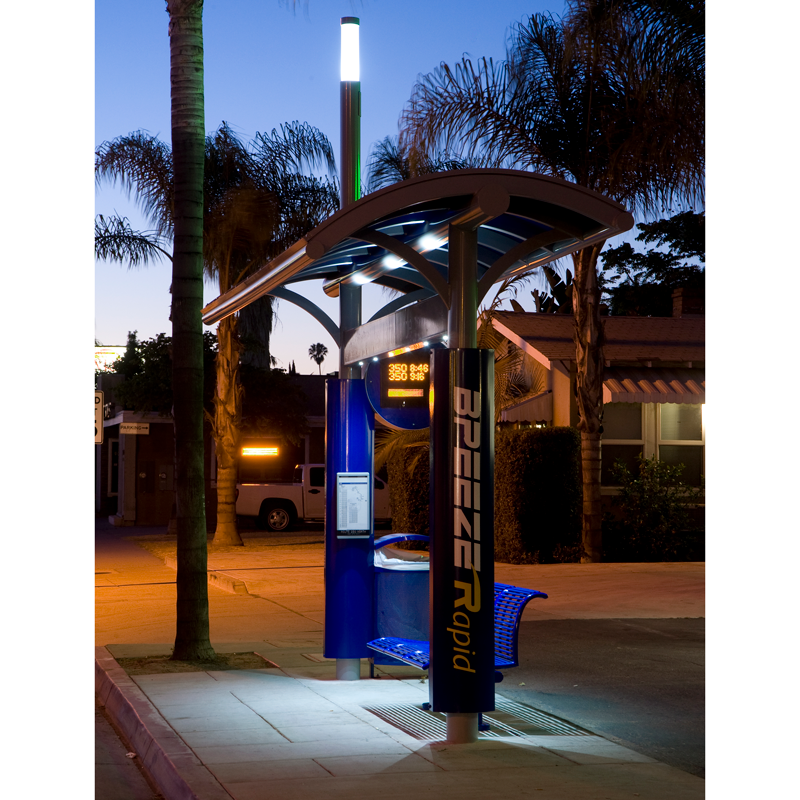 Solar powered LED illumination provides additional protection in the evening hours. 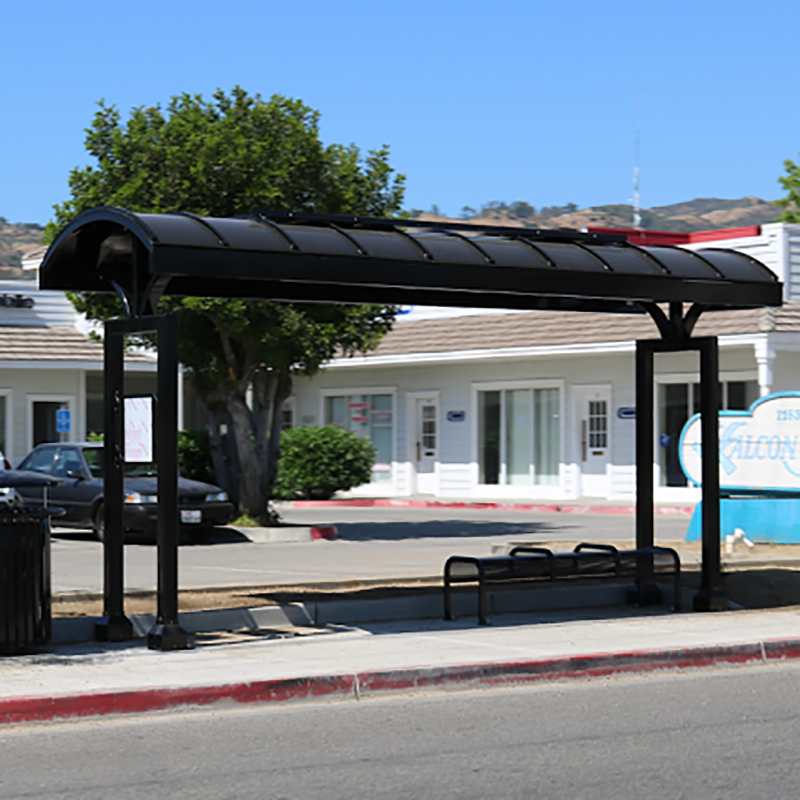 Tolar Manufacturing was selected to provide the transit shelters, benches and solar lighting for the Yucca Valley Transit Center, a key component of the MBTA’s service to the Morongo Basin communities in Southern California. 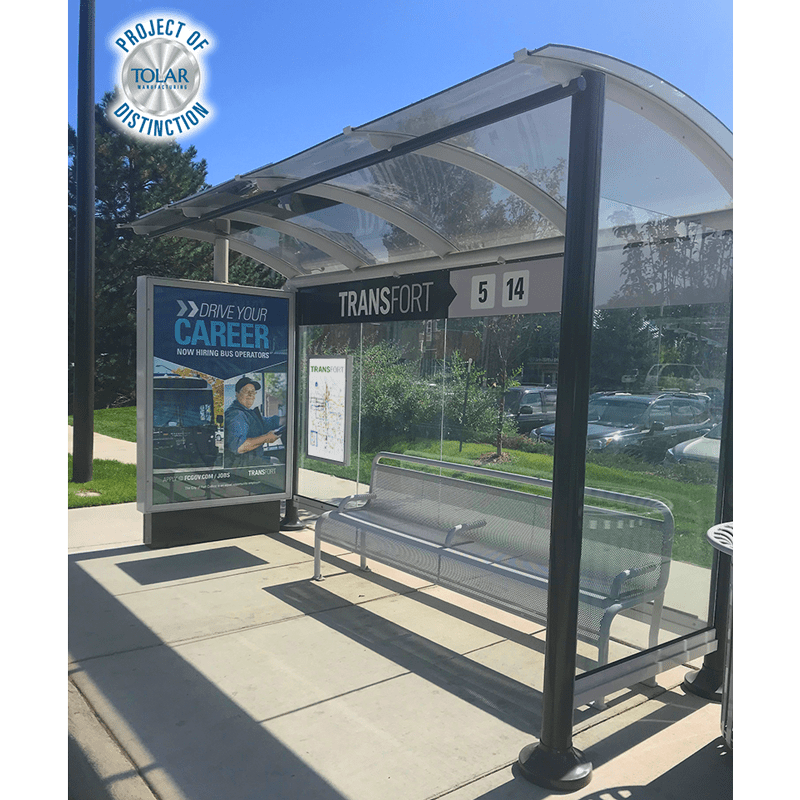 “Our agency works hard with the staffs of the municipalities that are in our service area to ensure that incoming developers include transit amenities as a part of the conditions of approval for whatever project they are proposing. 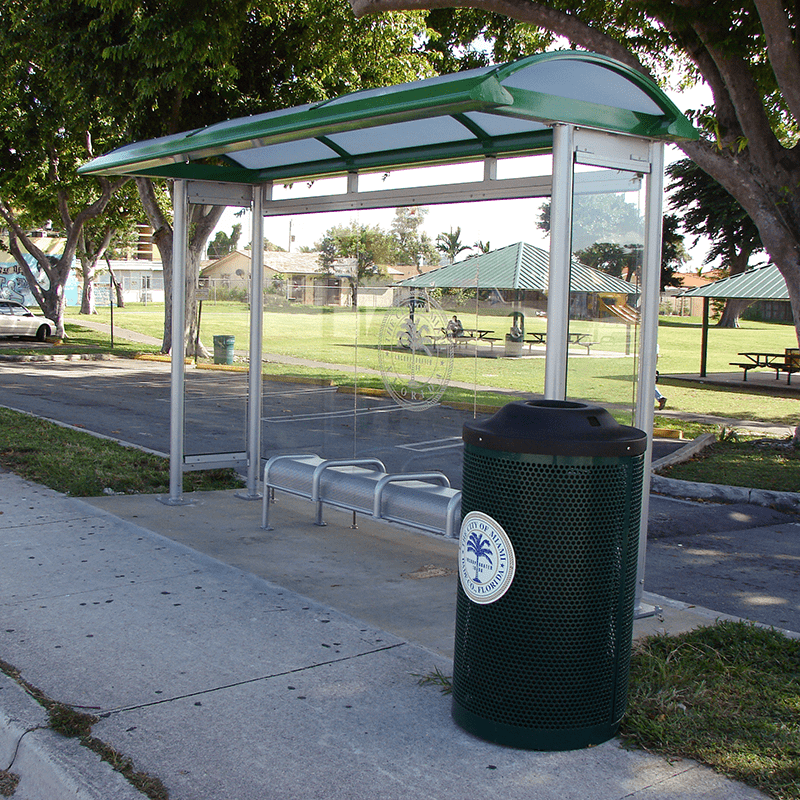 Tolar is an important part of that process, as these developers work with Tolar’s sales staff to incorporate shelters, benches and waste receptacles in their proposed site plans. 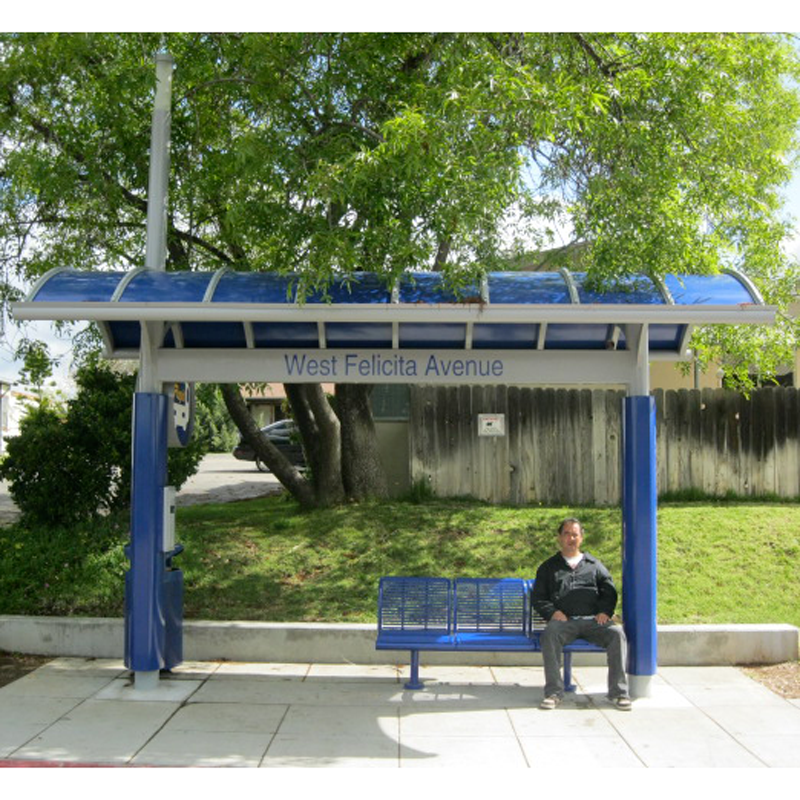 To date, 36 developments have been conditioned to provide bus shelters for us. This is only possible because we work in true partnership with a firm that diligently provides guidance and support to these developers- even if they are making small purchases. 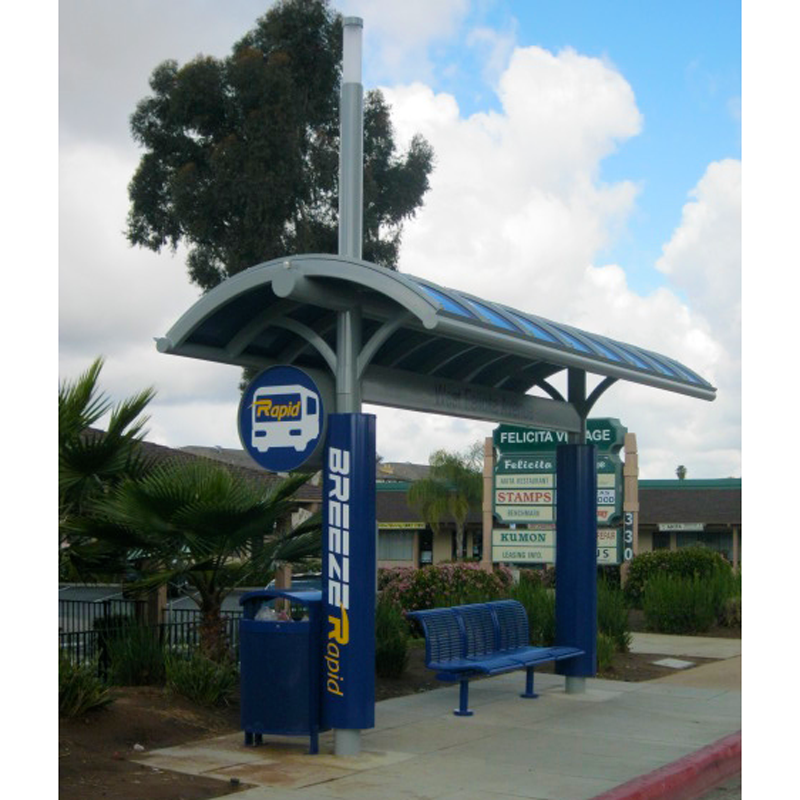 We thank Tolar Manufacturing for its contribution to our community,” stated Joe Meer, General Manager, Morongo Basin Transit Authority. 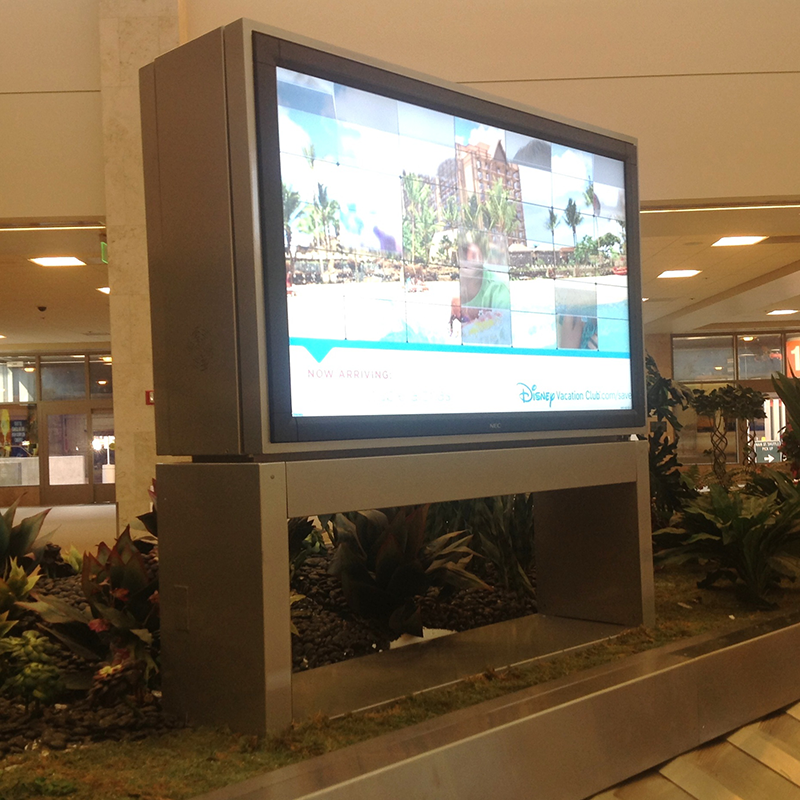 Tolar Manufacturing, through our valued outdoor advertising client, worked with airport staff to develop a multi-platform media display solution. 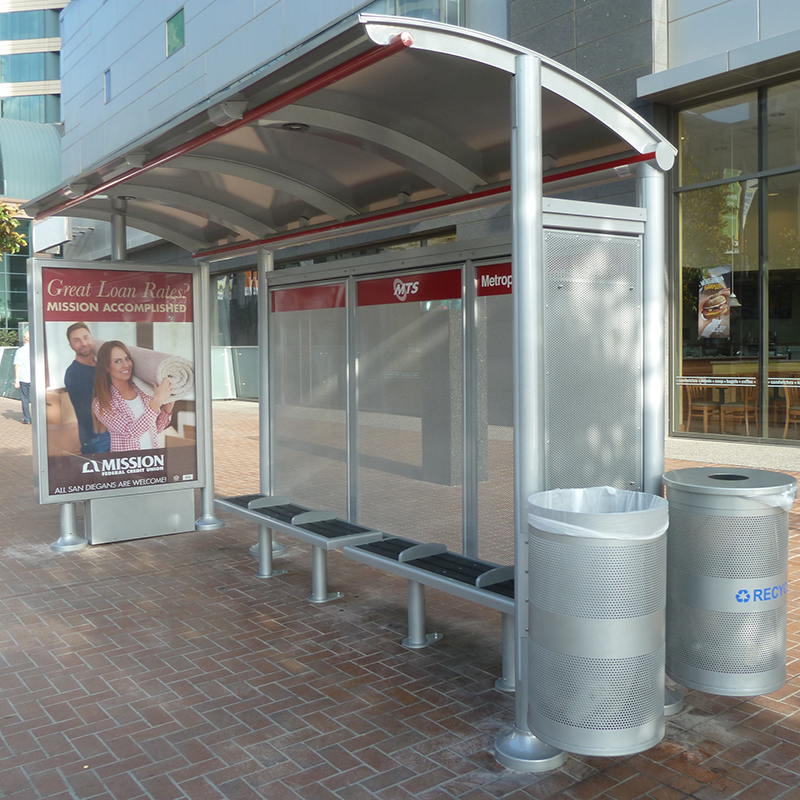 Stainless steel display structures included wall mounts, bag deck displays, trash and recycle receptacle displays, and free standing units. 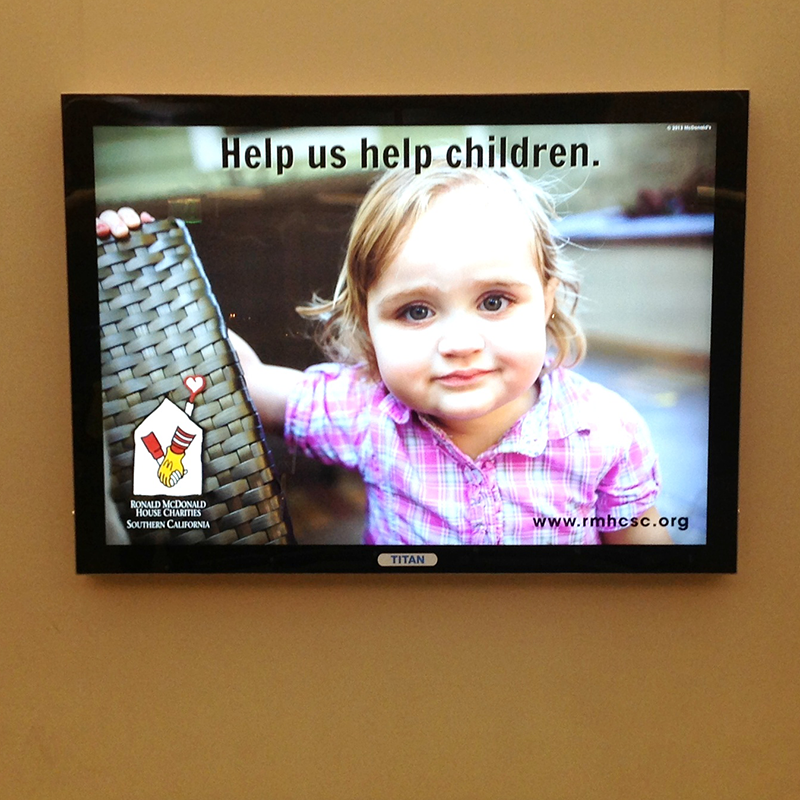 The units display advertising through static LED and digital faces. 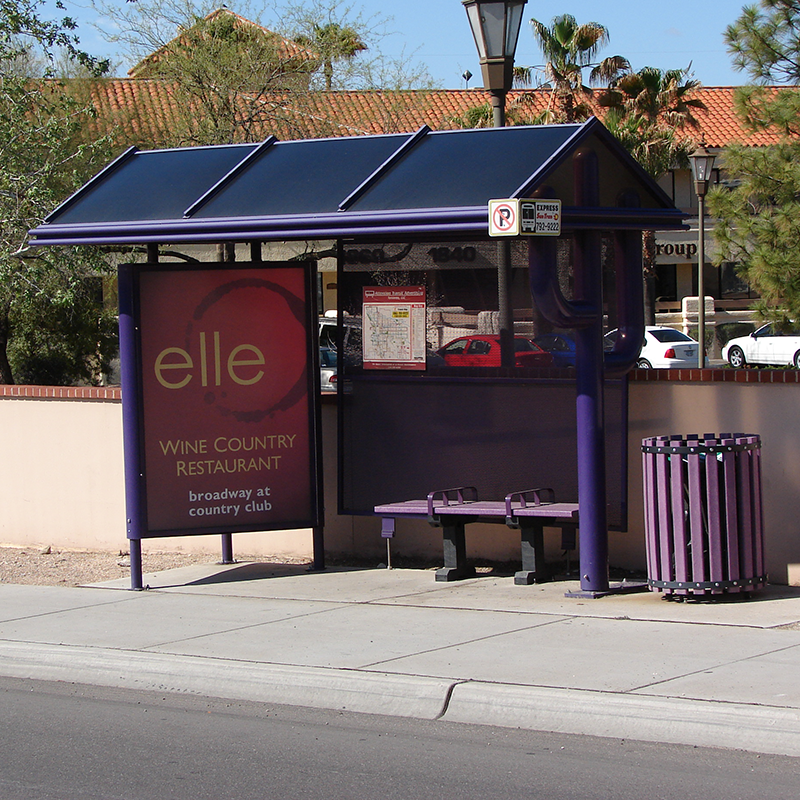 These 10’ shelters from our Signature Sunset line feature aluminum roof panels, 3/8” clear glass, dusk to dawn LED solar illumination and a comfortable Mesa bench. 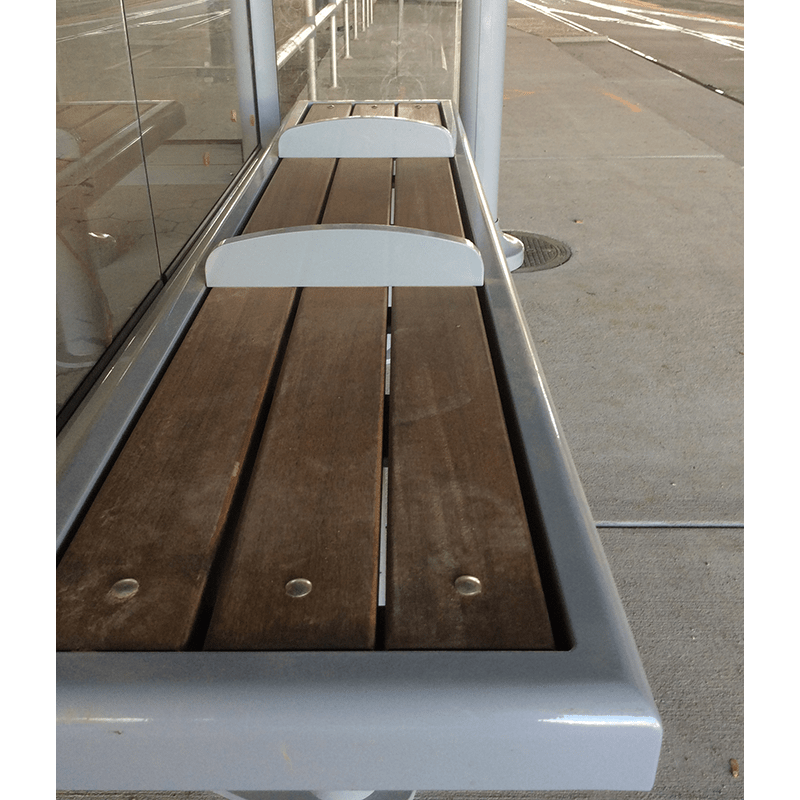 Tolar Manufacturing, though a competitive RFP process, was awarded a contract to provide benches to San Diego MTS. 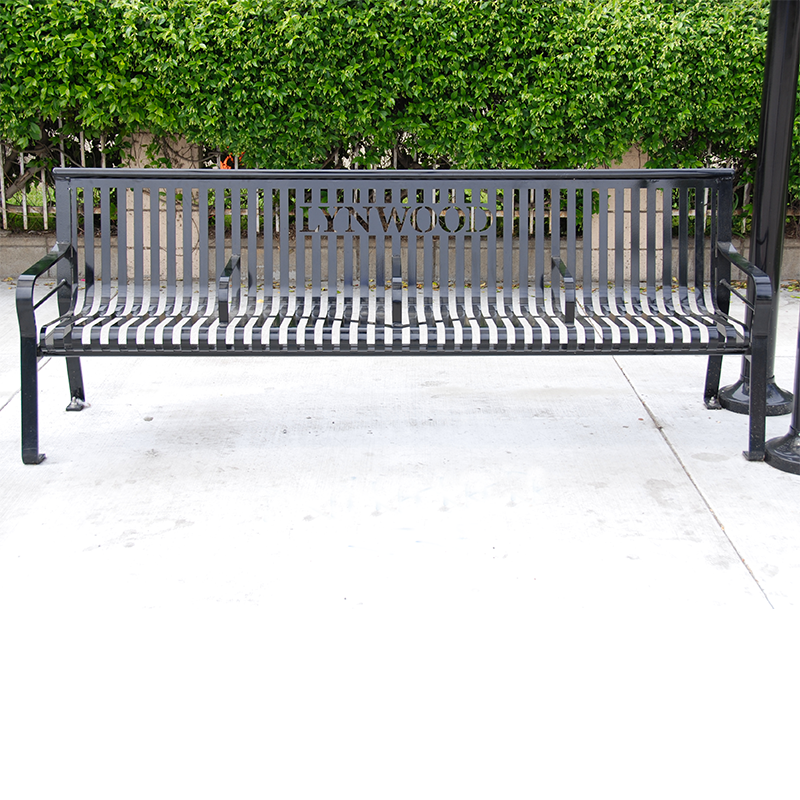 The 7’ steel platform benches offer durable, yet esthetically pleasing amenities for MTS’s valued customers. 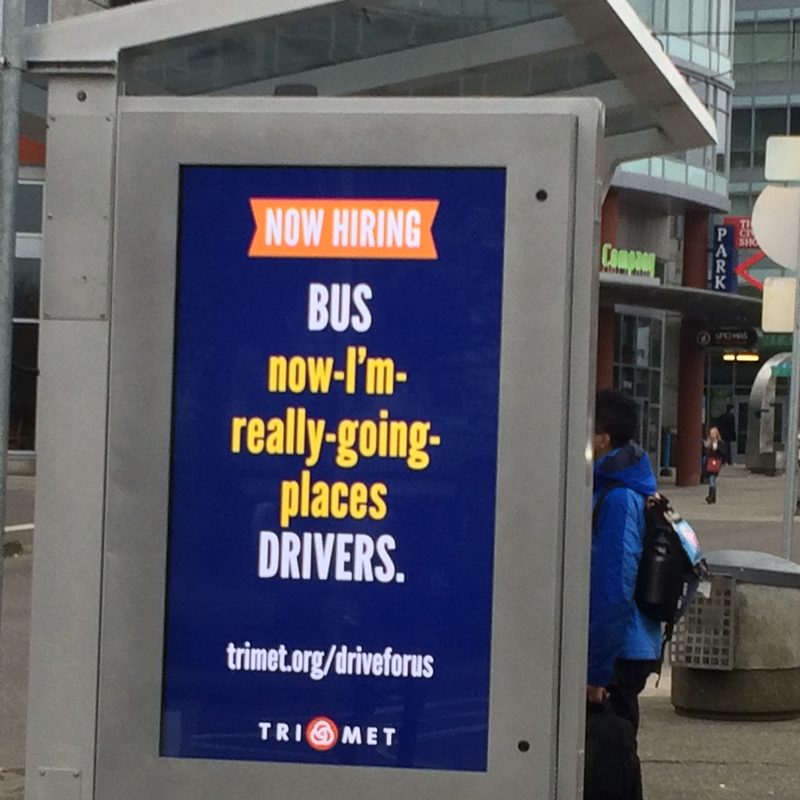 The first mile/last mile connection is becoming more and more relevant in our public transit conversations. 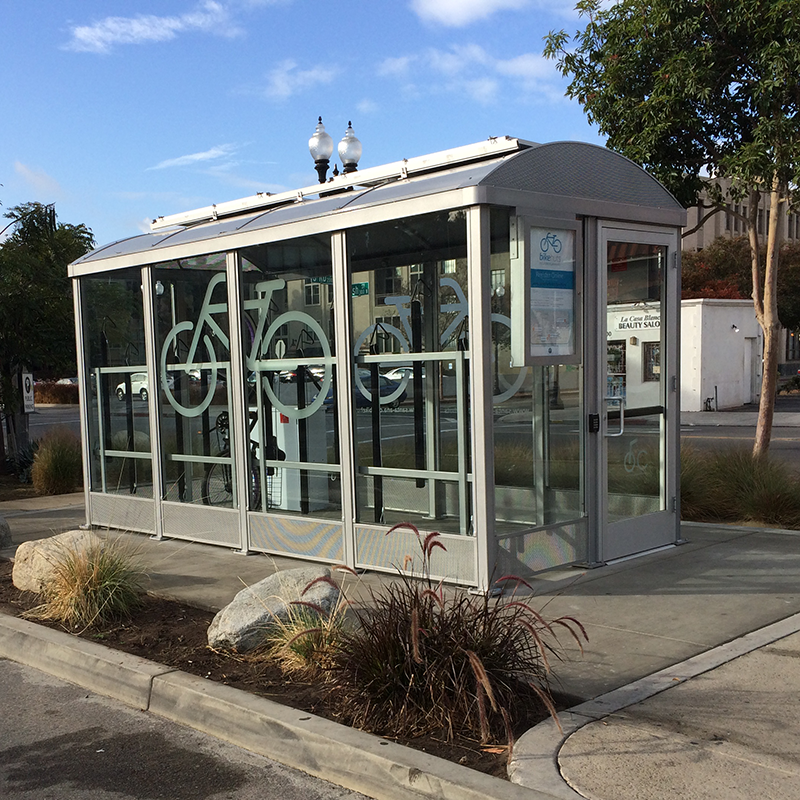 One of the ways to provide that connection is though community bike share programs. 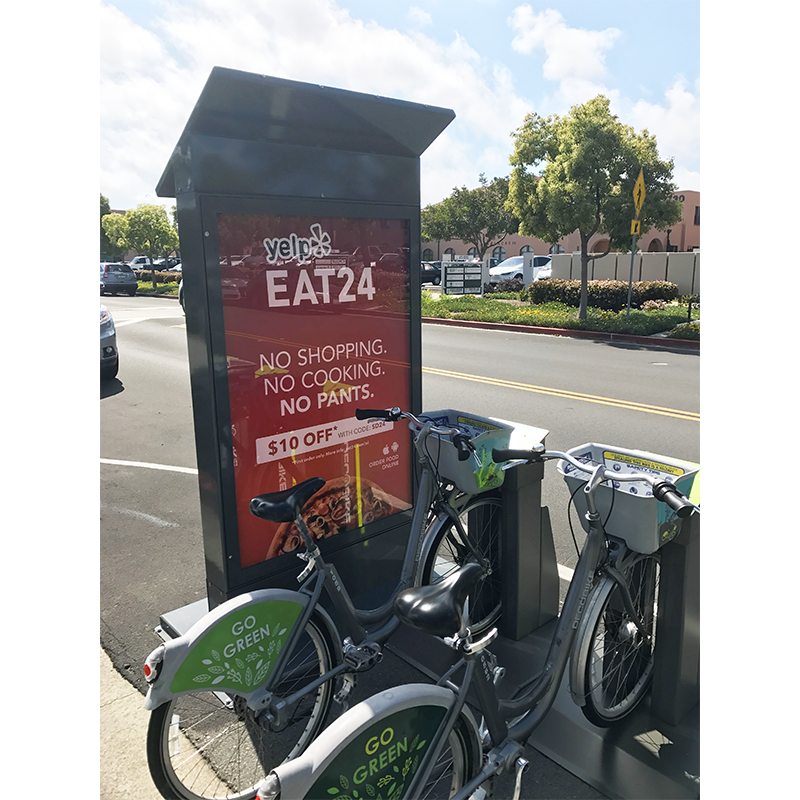 For the San Diego bike share program Tolar Manufacturing was asked to provide an illuminated advertising kiosk solution to support the revenue component of the program. 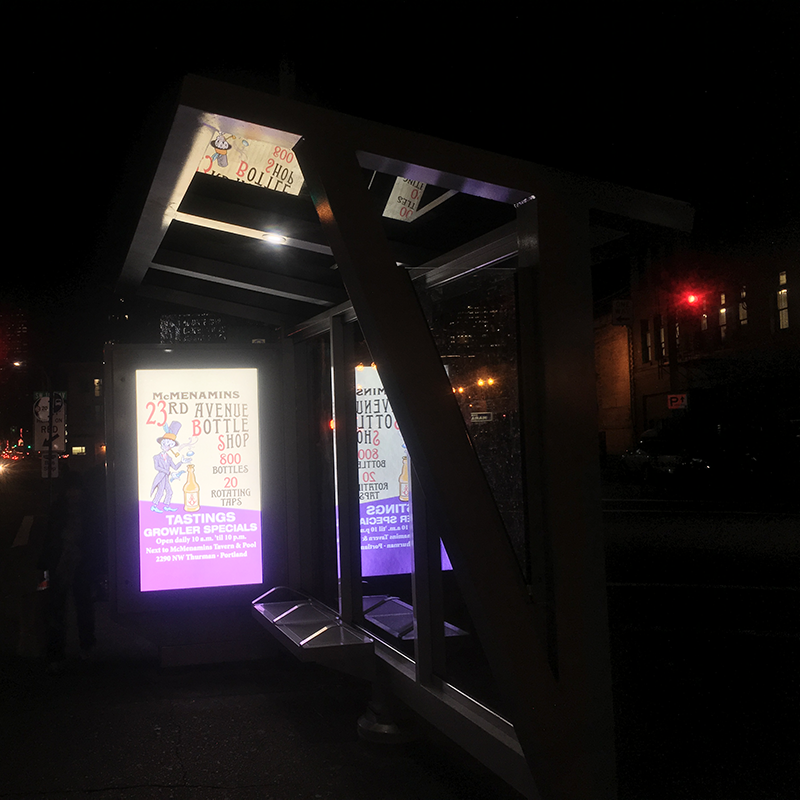 These custom two-sided kiosks allow for solar powered LED illumination in the advertising display for high visibility during the evening hours. 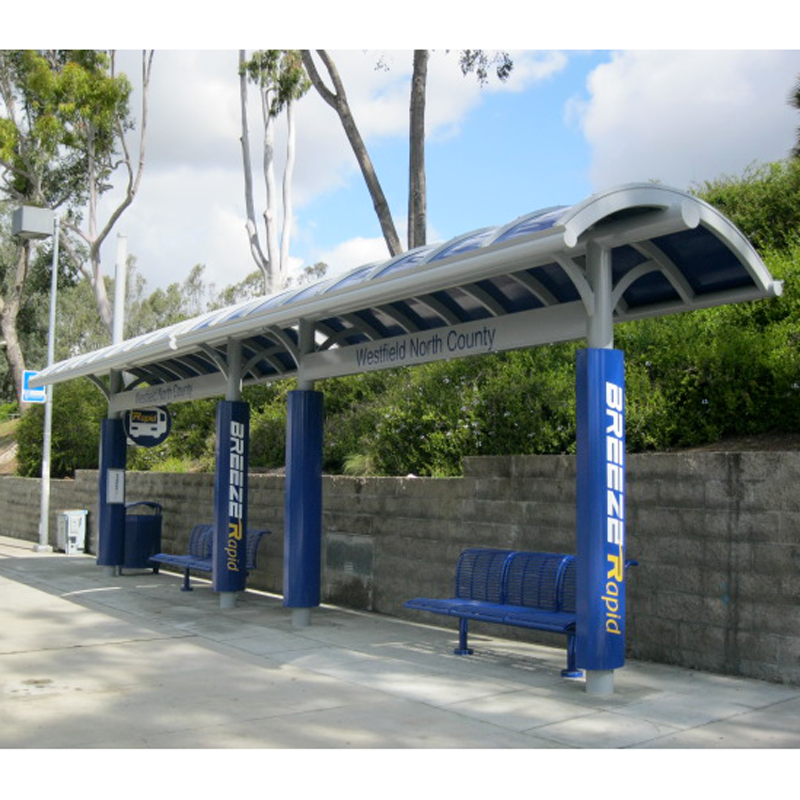 Tolar Manufacturing, through an RFP process, was selected by the San Diego MTS to design and fabricate multiple transit shelter options for installation throughout their service area. 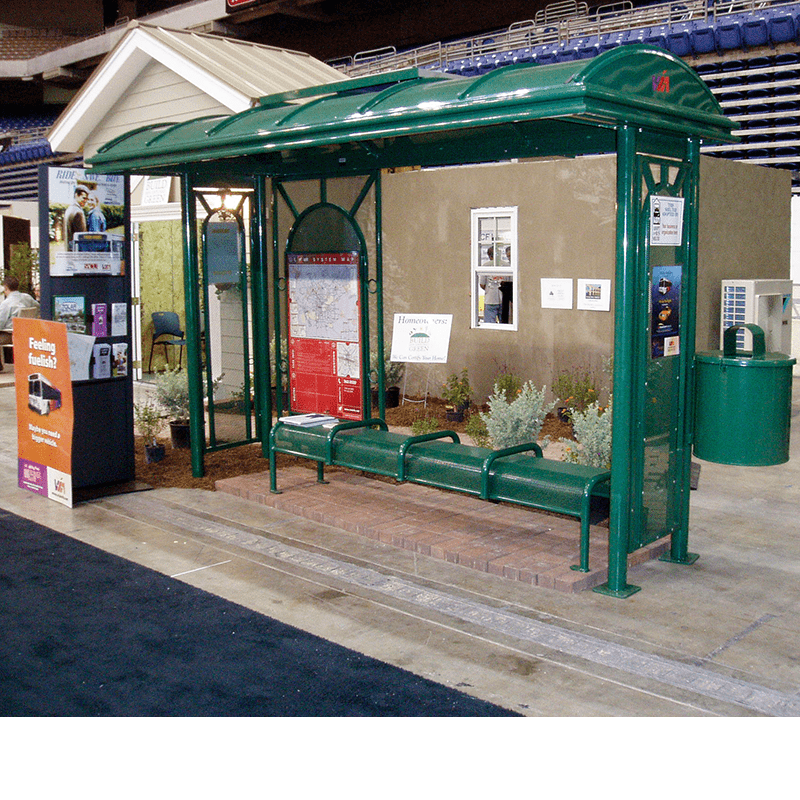 The multi-year award features custom shelter designs based on Tolar Manufacturing’s Signature Sunset series. 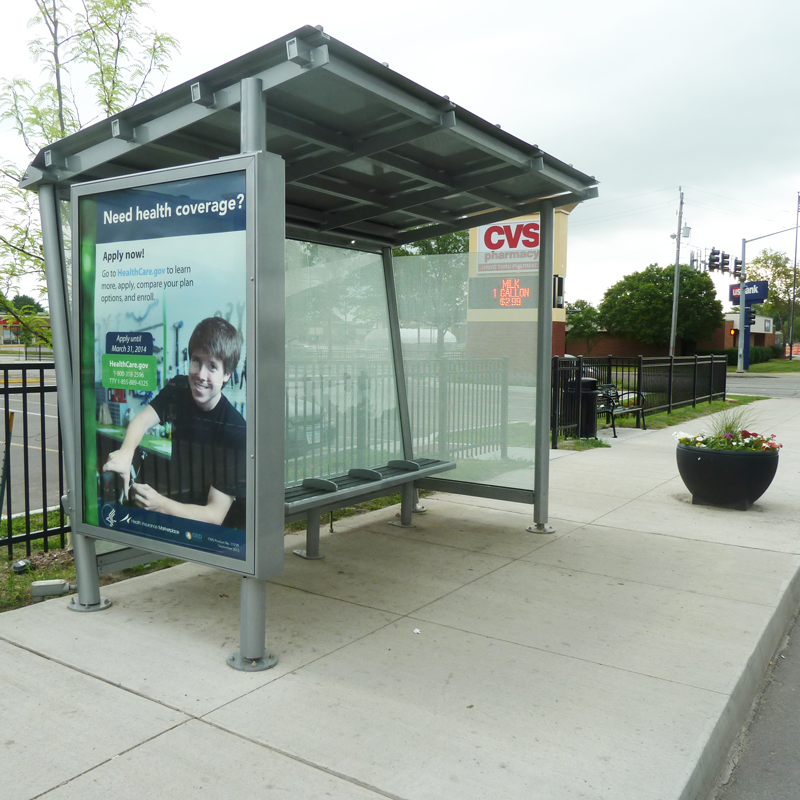 Included in the portfolio are 13’ and 17’ advertising shelters as well as 13’ and 17’ non-advertising shelters. 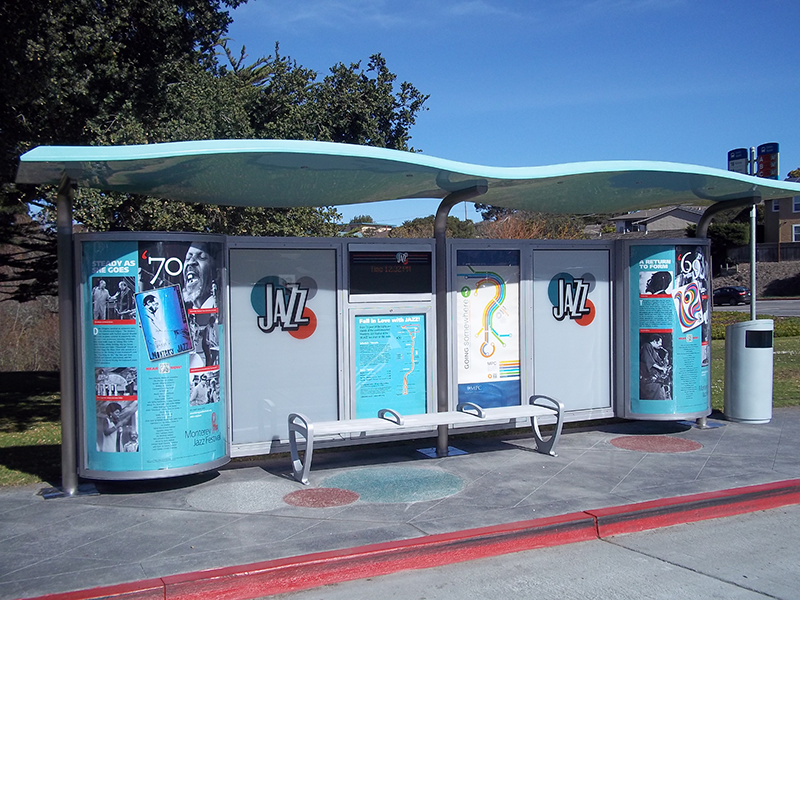 The advertising shelters feature a flat back-to-back media display kiosk, aluminum roof panels, agency branding on the rear wall, spun escutcheon covers, integrated map case, Mesa benches, trash and recycle waste receptacles, solar powered LED illumination in the advertising kiosk, as well as roof and accent lighting. 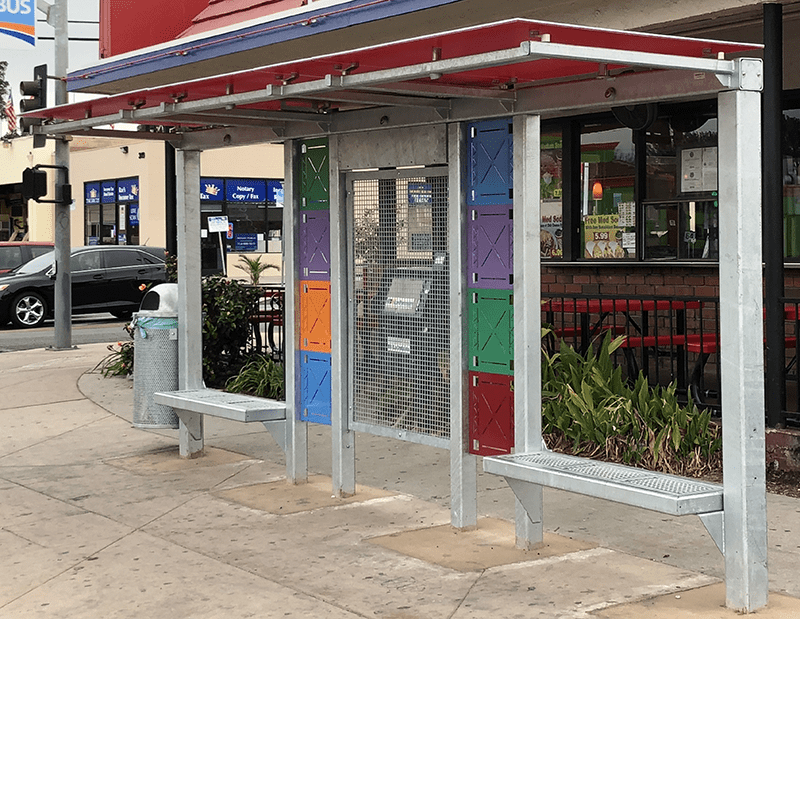 The non-advertising shelters feature aluminum roof panels, agency branding on the rear wall, spun escutcheon covers, integrated map case, Mesa benches, trash and recycle waste receptacles, solar powered LED illumination in the advertising kiosk, and roof and accent lighting. 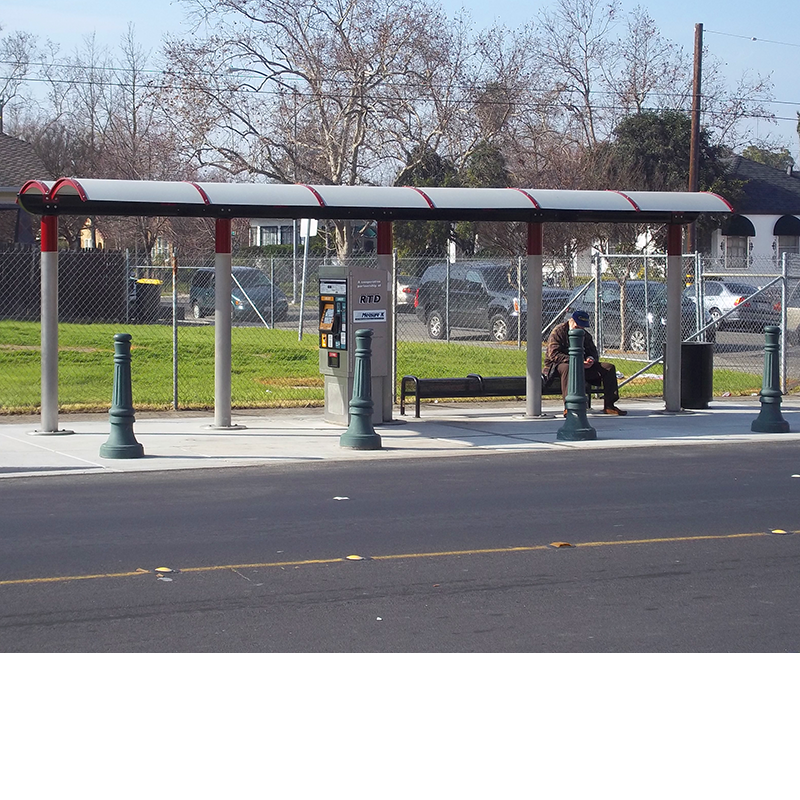 Tolar Manufacturing was fortunate to be awarded a contract for the BRT stations and various elements of San Jose’s Alum Rock BRT project. 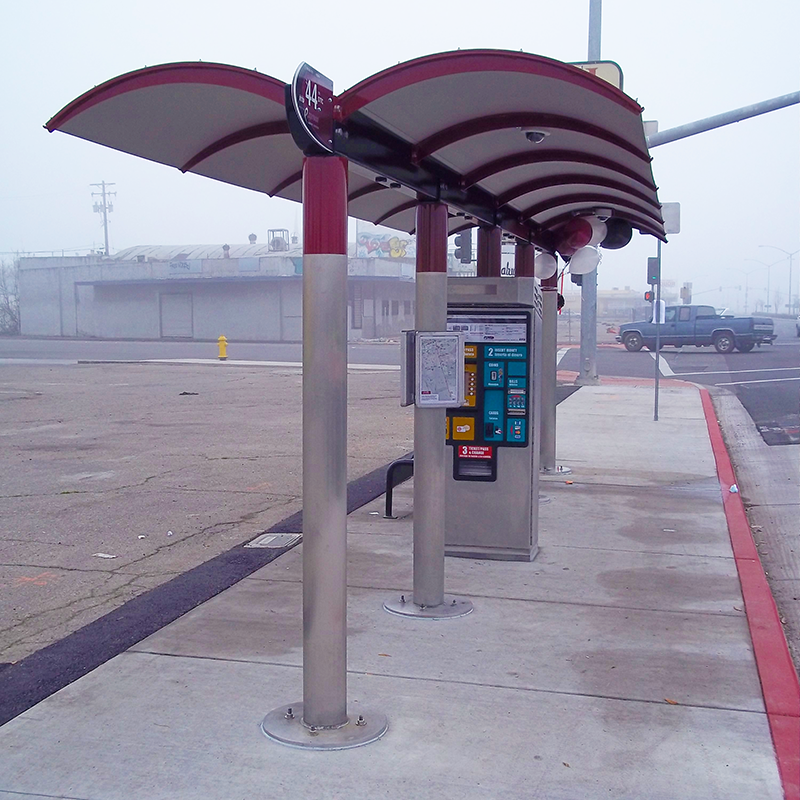 Working with the project designers, engineering firms and the transit agency Tolar fabricated 48’ shelters with stainless cladding, equipment cabinets with transit information displays, rail barriers, and light poles. 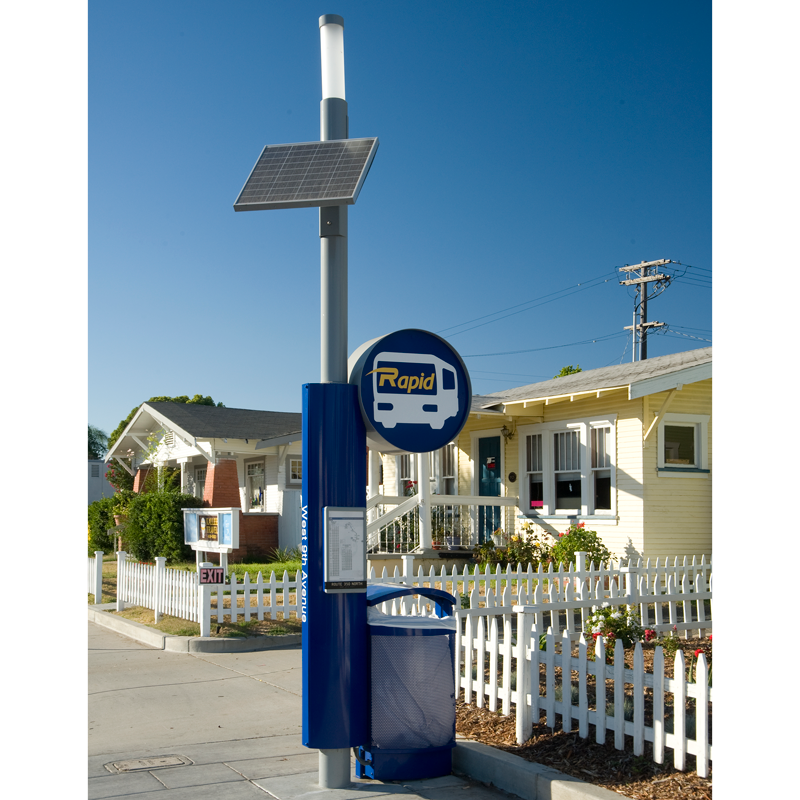 In May 2015, the City of Santa Ana, California did something innovative to help address the public transportation challenges faced by “first-last mile” passengers. 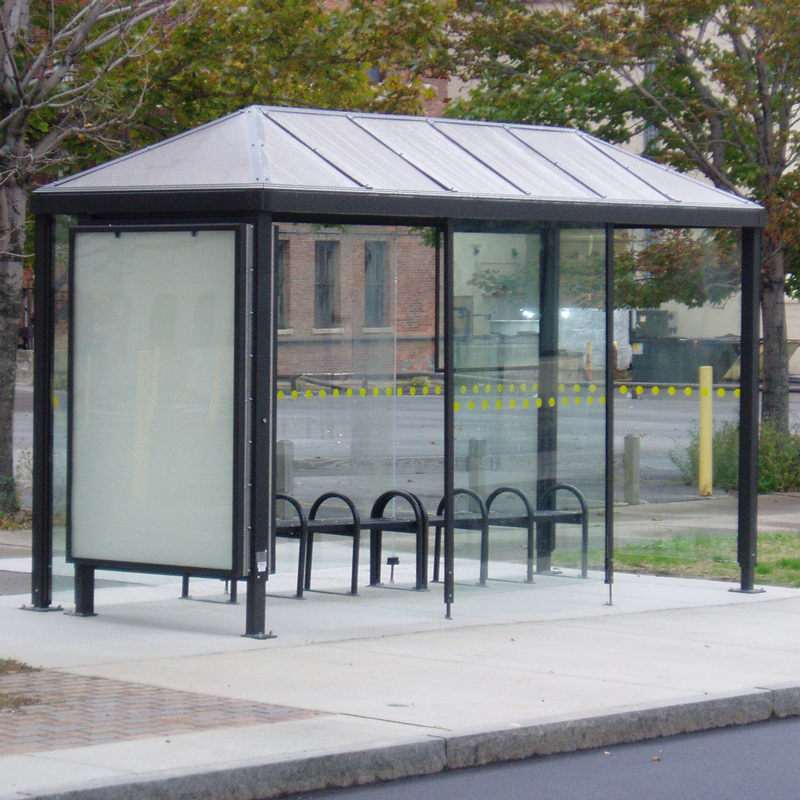 They became the first city in their county to install “Bike Huts” throughout their community. 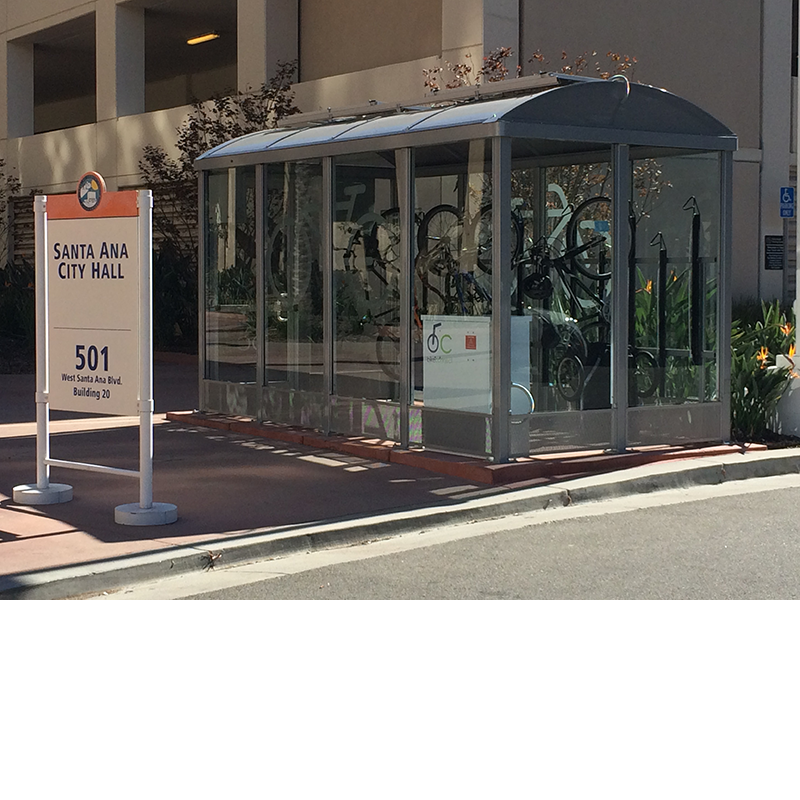 To date, the city has installed four Bike Huts, two located in the downtown core, one in the heart of the City’s Civic Center and one at the Santa Ana Regional Transportation Center. 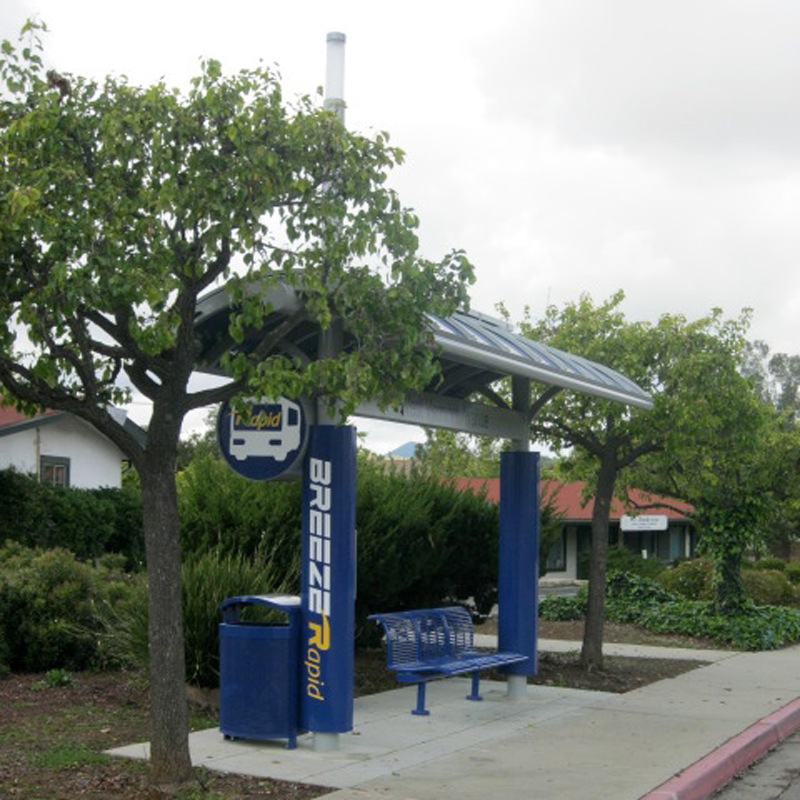 The solar-powered, stand-alone, completely enclosed Bike Huts are a joint product of Tolar Manufacturing and Irvine-based Acire, Inc. under their BikeConnect brand. 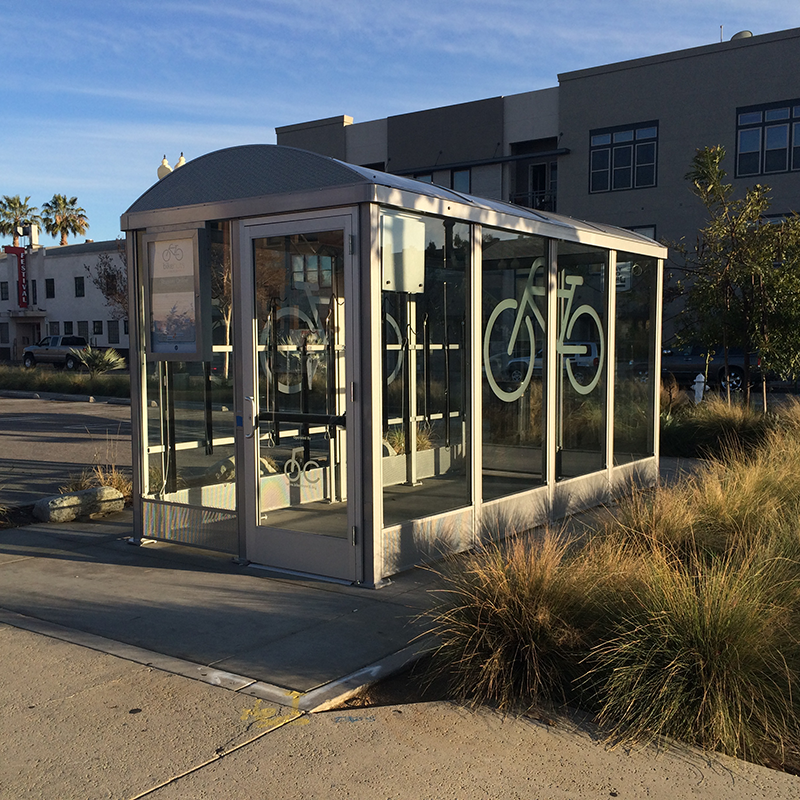 The collaboration combines BikeConnect’s world-class centralized web-based bike management and administration system with Tolar’s vast design and manufacturing capabilities of award-winning bus shelters and street furniture. 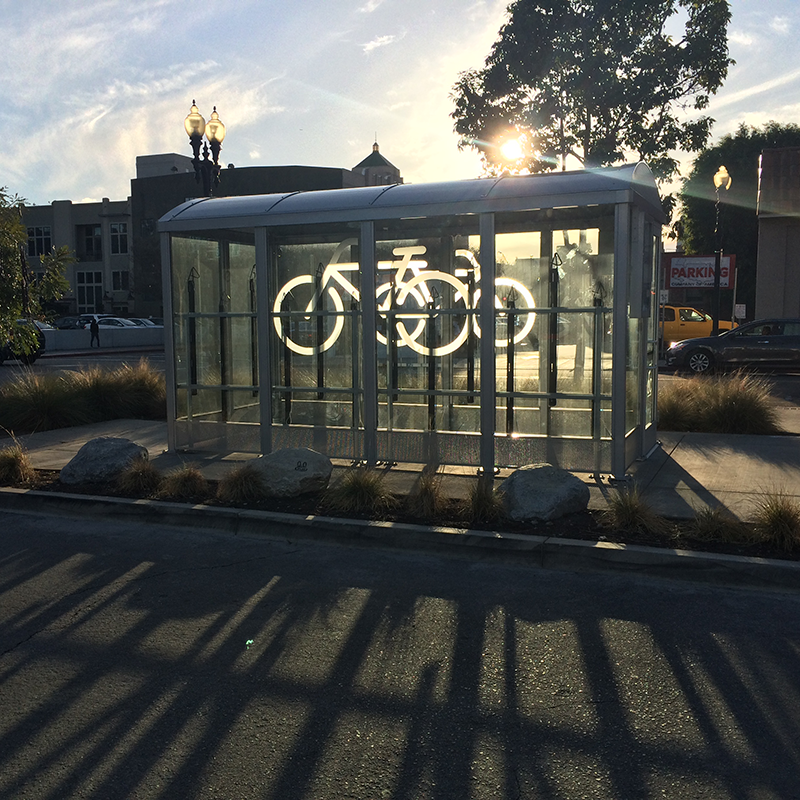 The Santa Ana Bike Huts are made from 100% recyclable materials and equipped with automated LED security lighting. 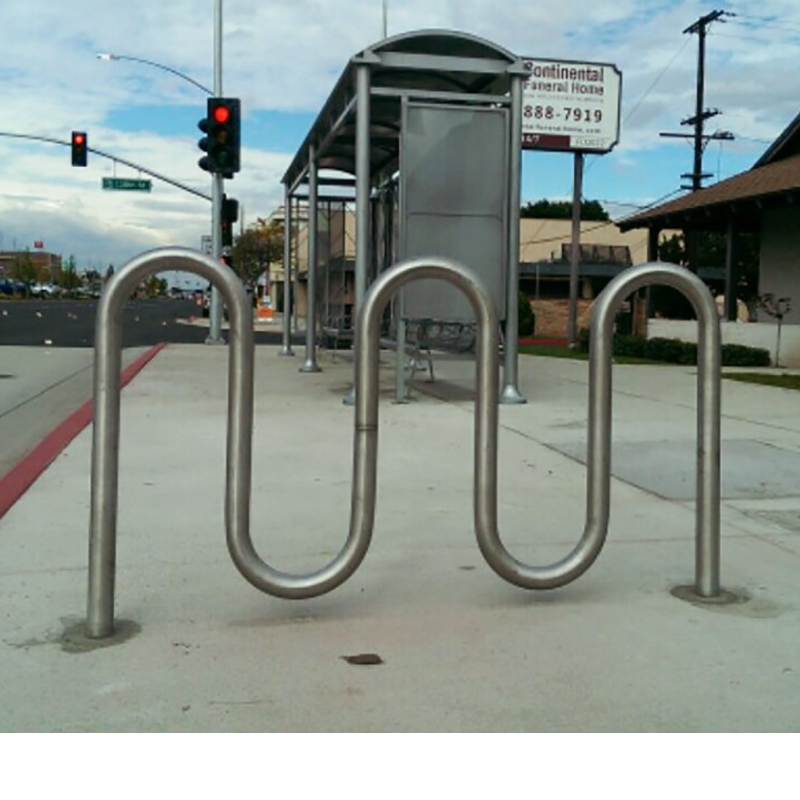 High-definition video surveillance with 24/7 video streaming allows the City and customers to watch over the up to 12 bicycles that are securely supported and individually locked in vertical tracks. Cyclists can view bike parking availability at each hut online. They then access the huts with a card reader or key code. All fee collection is handled through an online membership based program. 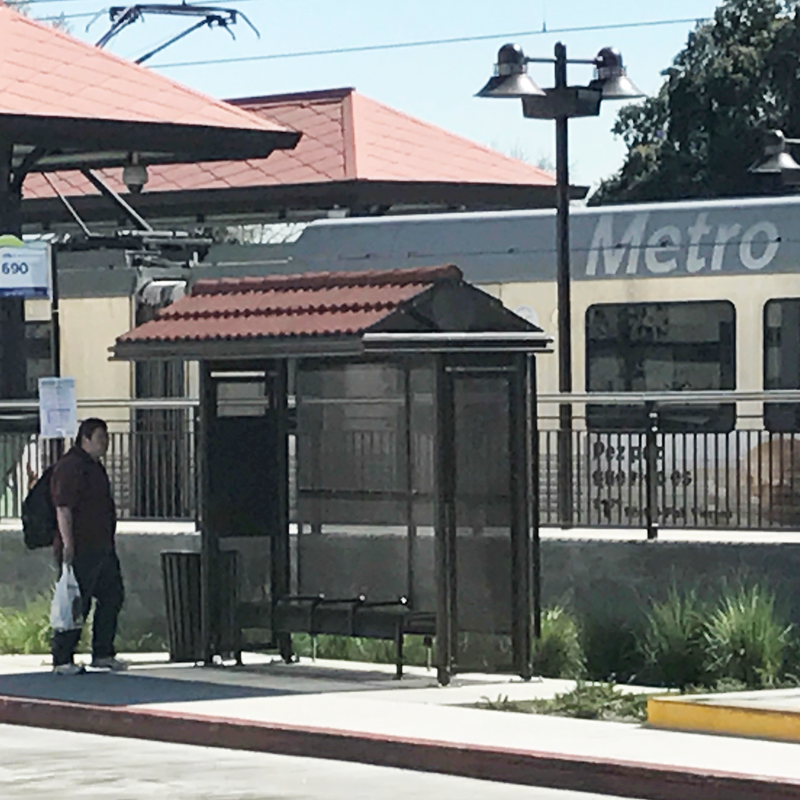 Santa Ana is currently considering a pay-as-you-go short-term usage program as well. 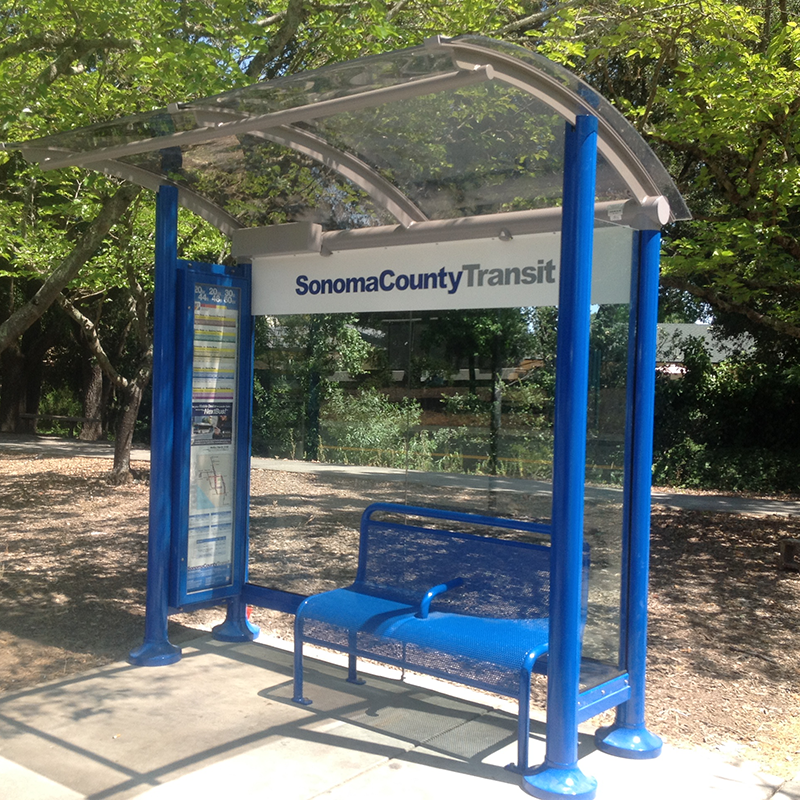 Catching the bus from Charles M Schulz-Sonoma County Airport in Santa Rosa, CA? 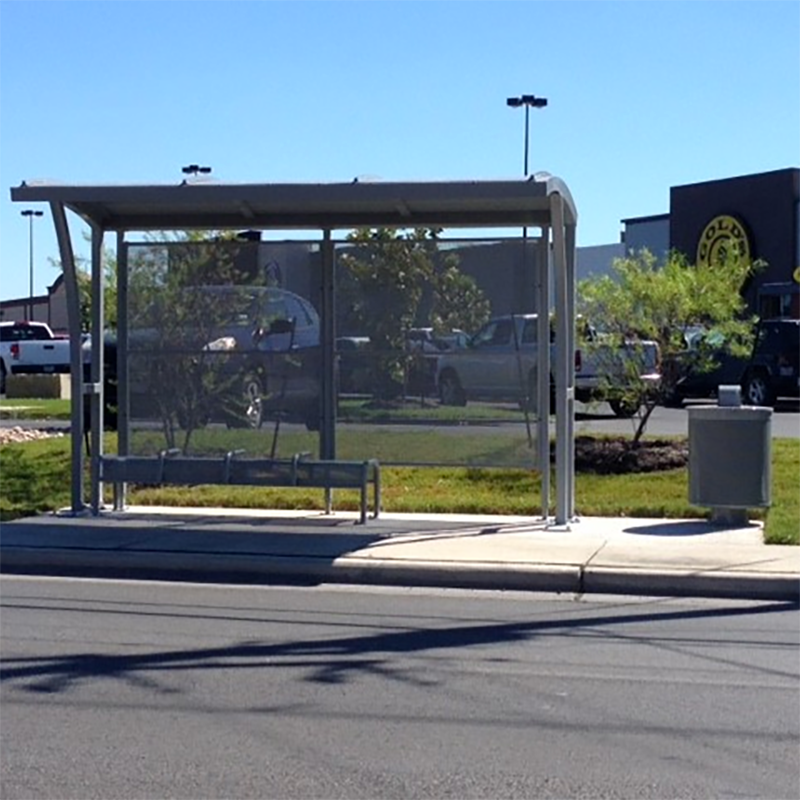 Check out this new Tolar-built transit shelter. 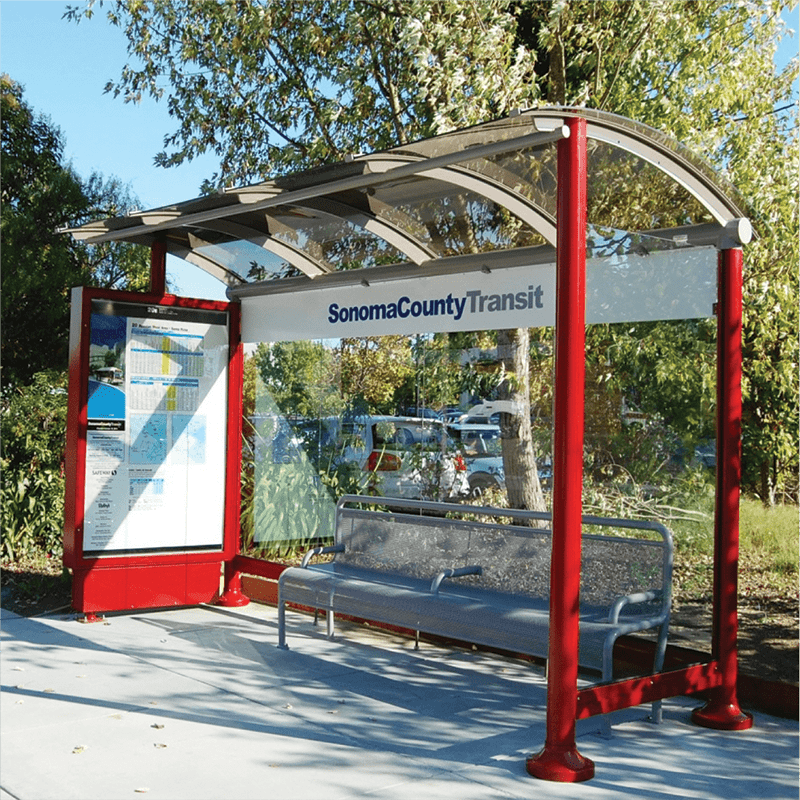 18’ X 7’ Signature Sunset transit shelter, served by Transdev – Sonoma County Transit and Mendocino Transit Authority, features pristine 3/8” heat formed polycarbonate roof panels, low draw LED illumination, connection points for future technology, SCT branding and contour benches. And of course Made in the USA by the 27+ year Tolar Manufacturing team! 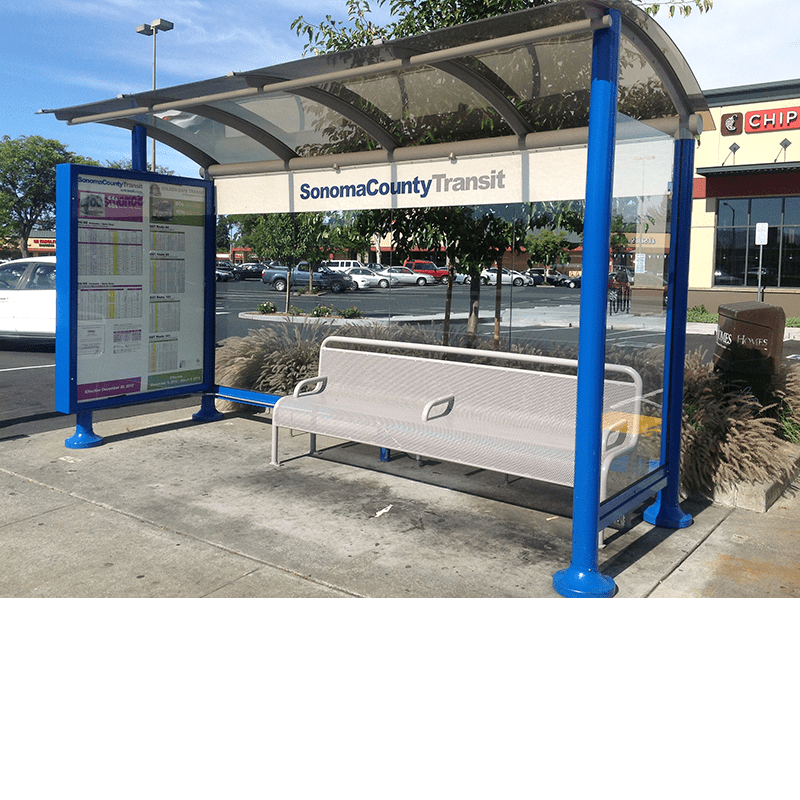 Sonoma County Transit is a national leader in comfort, ergonomics and technology. 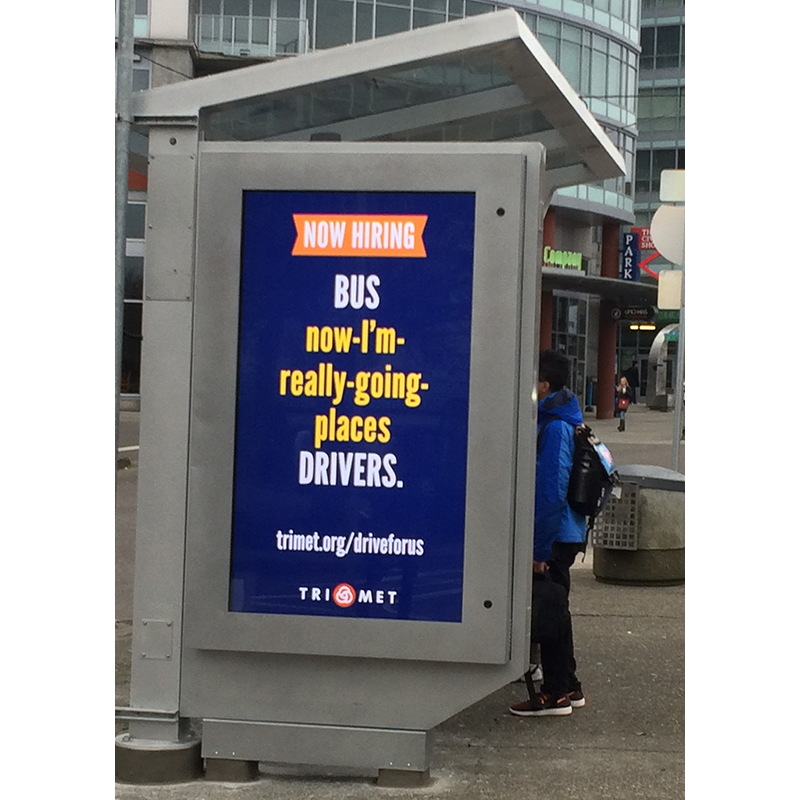 They now also provide WiFi on many of their newer buses. 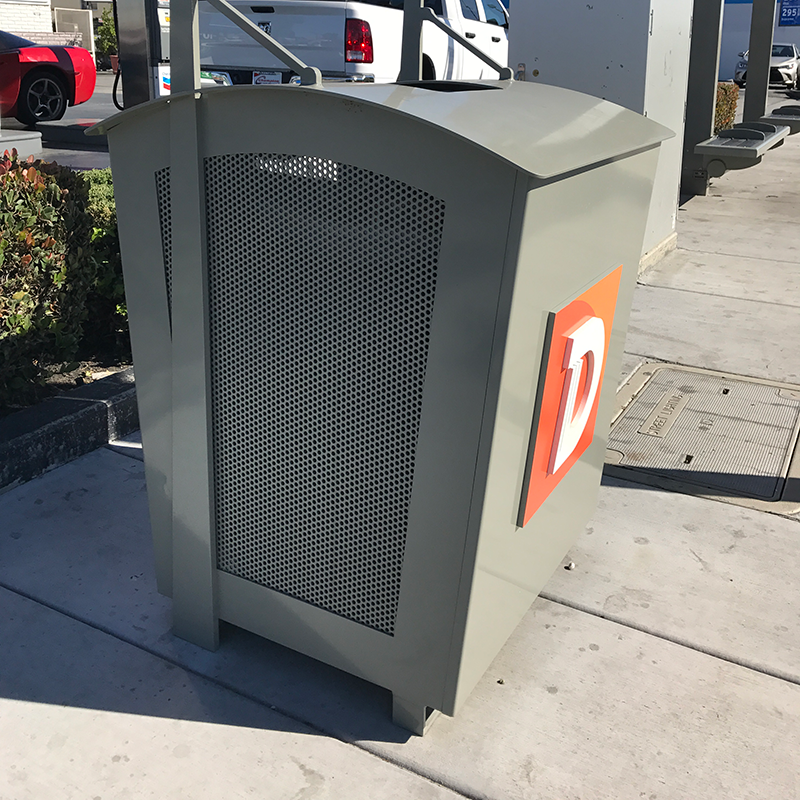 Sebastopol’s newest street furniture, fabricated by Tolar Manufacturing, is also a trendsetting example of design by Autodesk software. 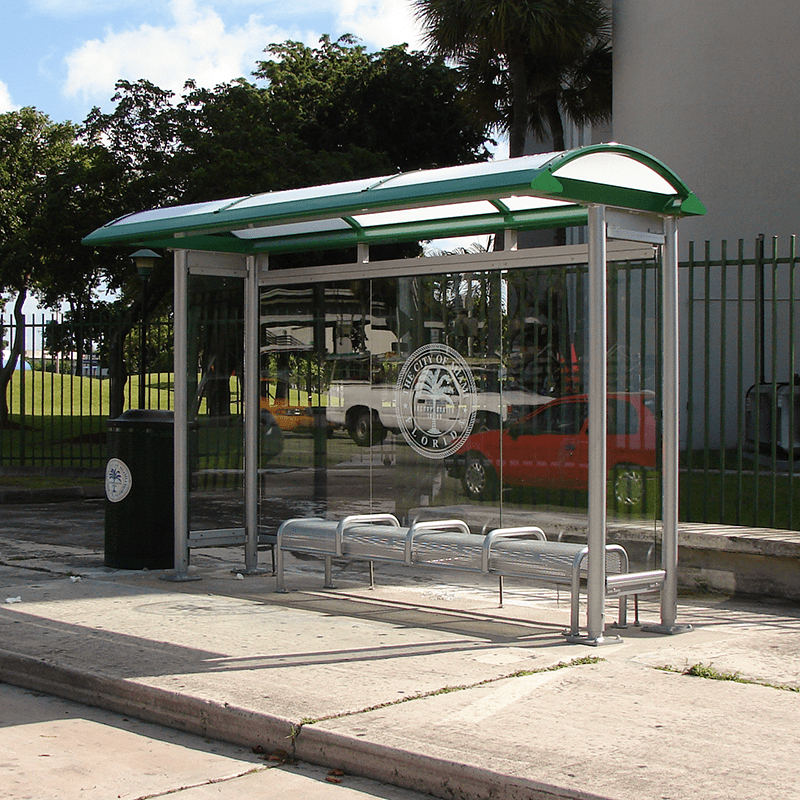 During the development phase, each Signature Sunset series transit shelter was realistically simulated into the environment before the first unit went into production. 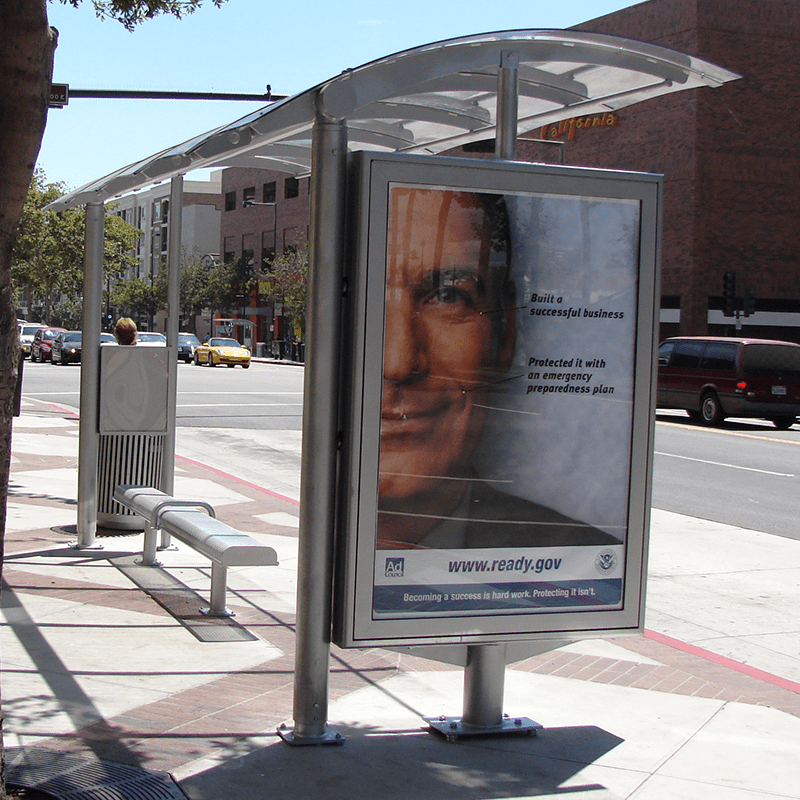 The City of Stockton is located in California’s rich delta region along the San Joaquin River. 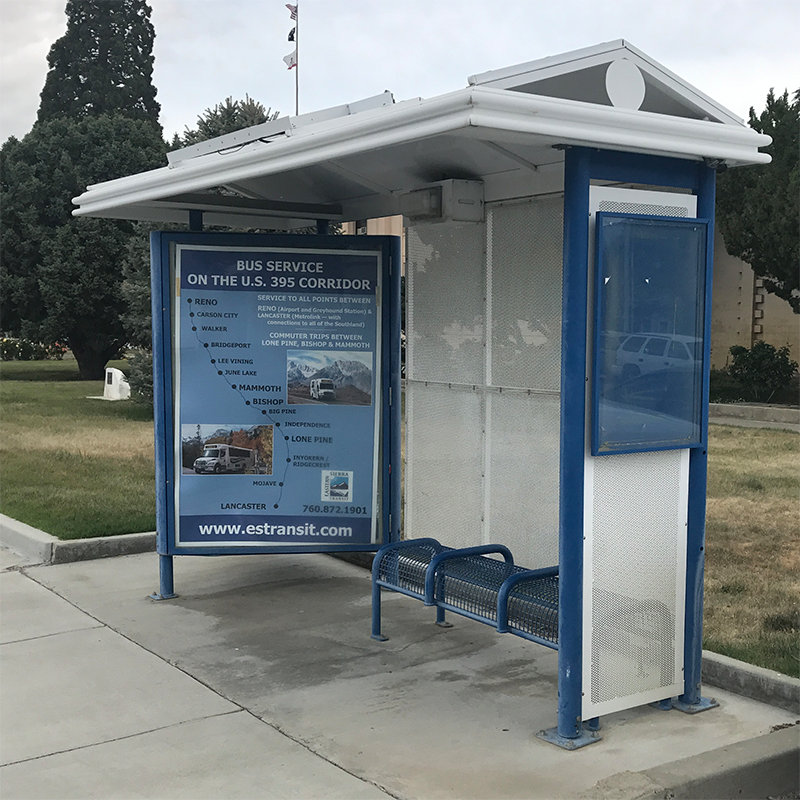 The team at San Joaquin RTD is very involved in their community and does a great job getting residents to school, work, social activities or just to spend time with friends. 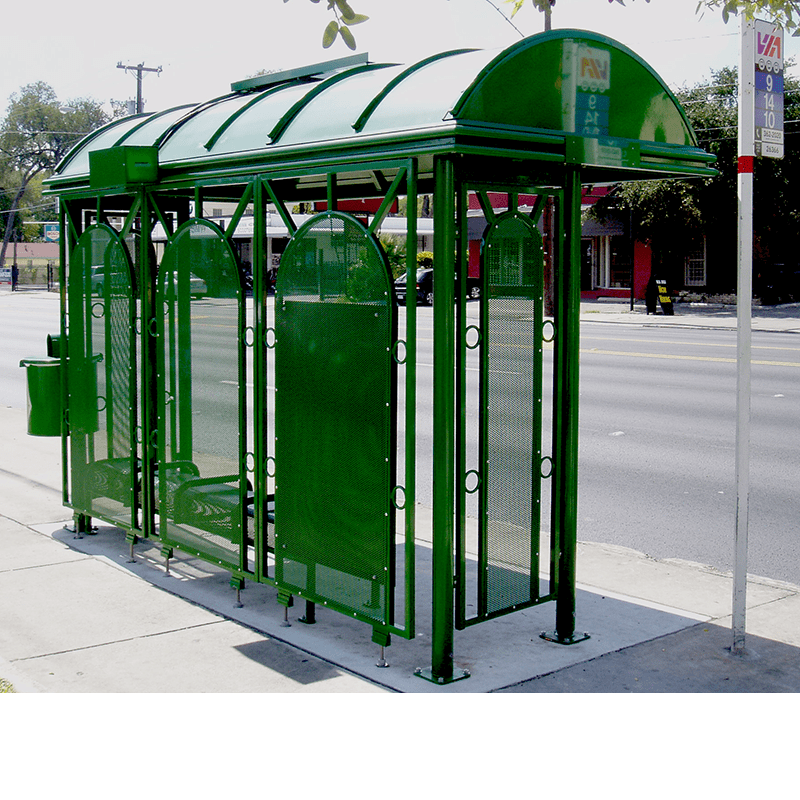 Tolar Manufacturing, through a competitive bid process, was selected to build many of these gull wing shelters along RTD’s BRT routes. 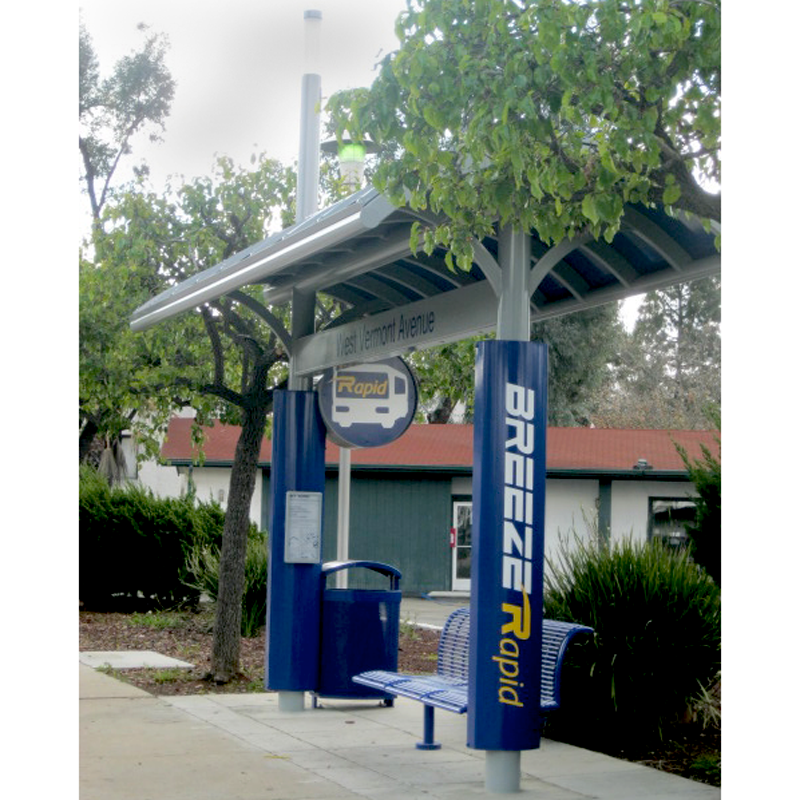 Featuring stainless steel support posts and a unique roof design, this purpose-driven design functions to protect riders from the elements while minimizing maintenance costs. 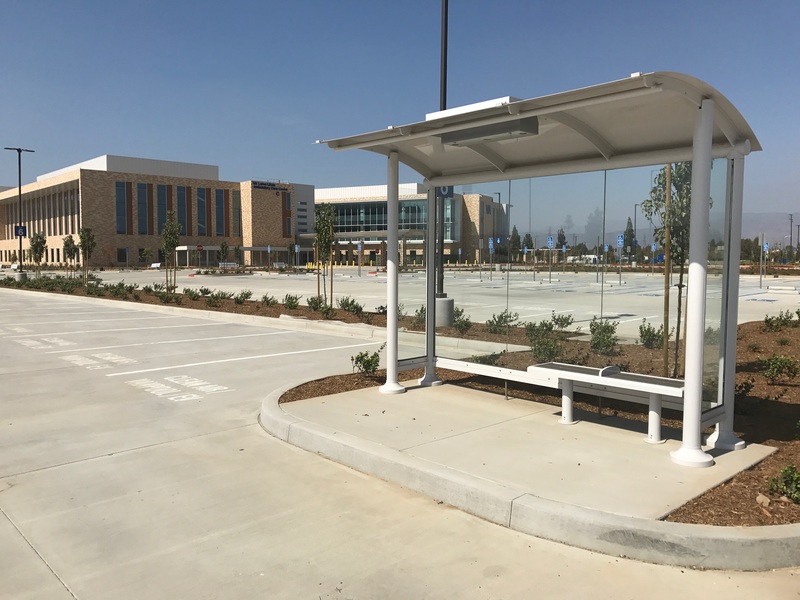 Tolar Manufacturing is proud to have contributed in a small way by fabricating this unique Project of Distinction. 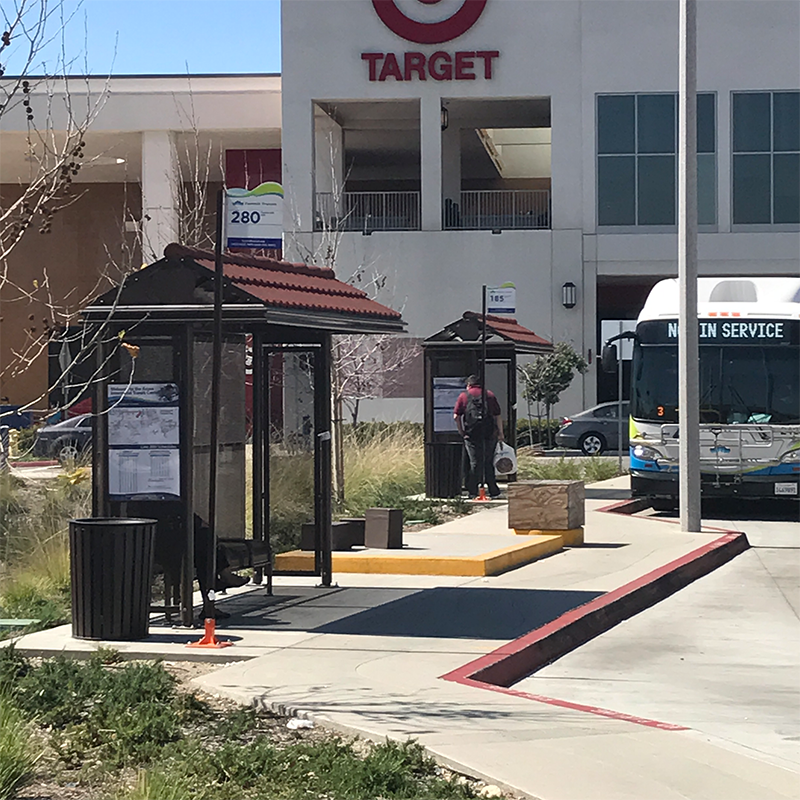 Temple City had project goals that included improving traffic safety, reenergizing one of the city’s main commercial corridors and creating a vibrant community destination. 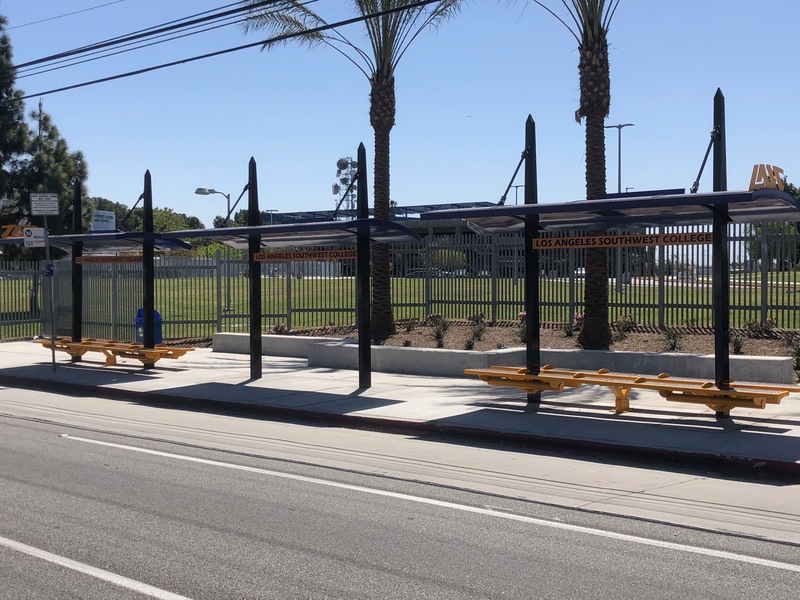 Some of the physical improvements and beautification elements included new sidewalks, added canopy trees and public art; as well as incoming amenities like outdoor dining and bike lanes and new transit shelters. 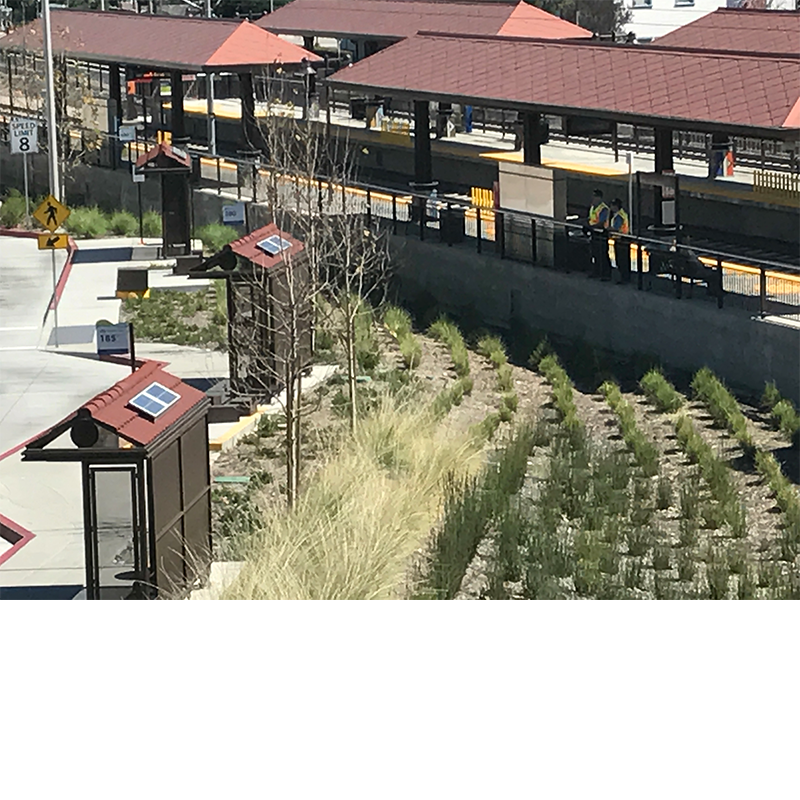 The goal of the project was to transform a portion of Rosemead Blvd from an auto-oriented pass-through into an attractive place for community life. 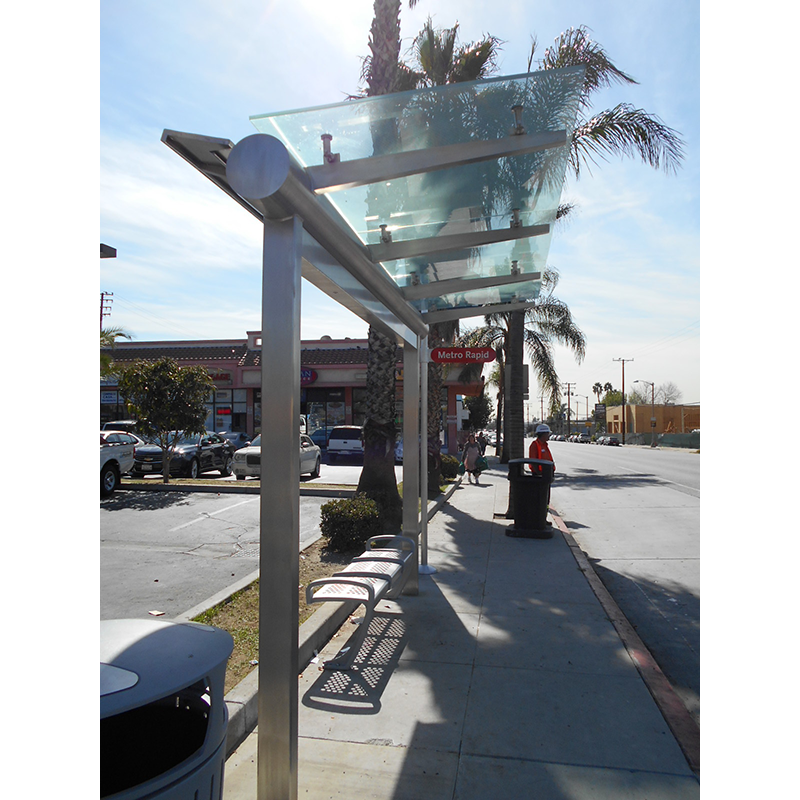 Tolar Manufacturing was proud to be selected to provide design modifications to its existing Signature Sunset series transit shelters. 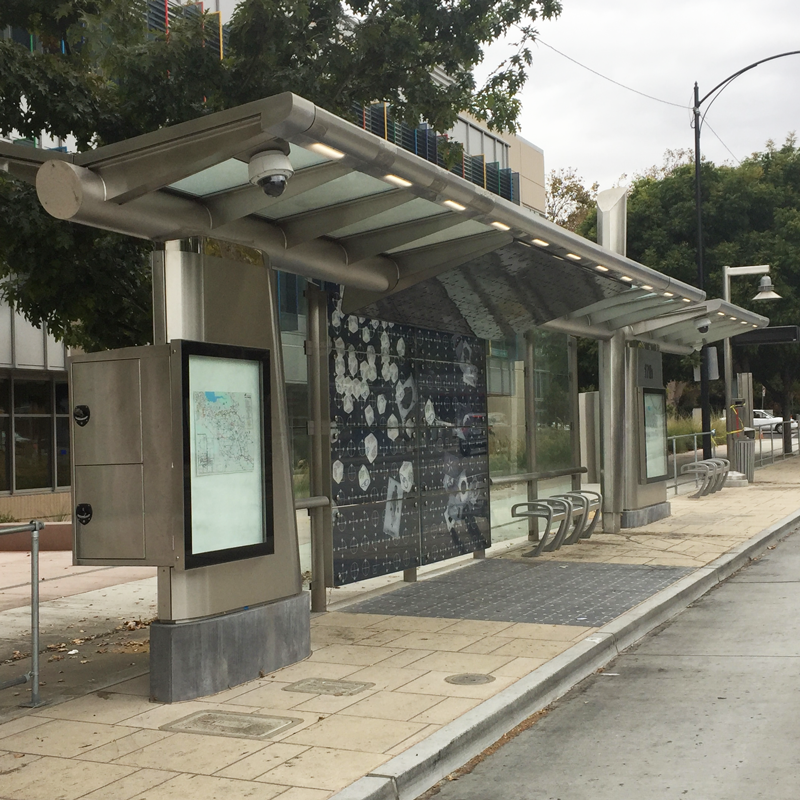 The shelters include custom designed glass, media display kiosk, a below grade installation, custom paint finish, and low draw LED illumination powered by solar. 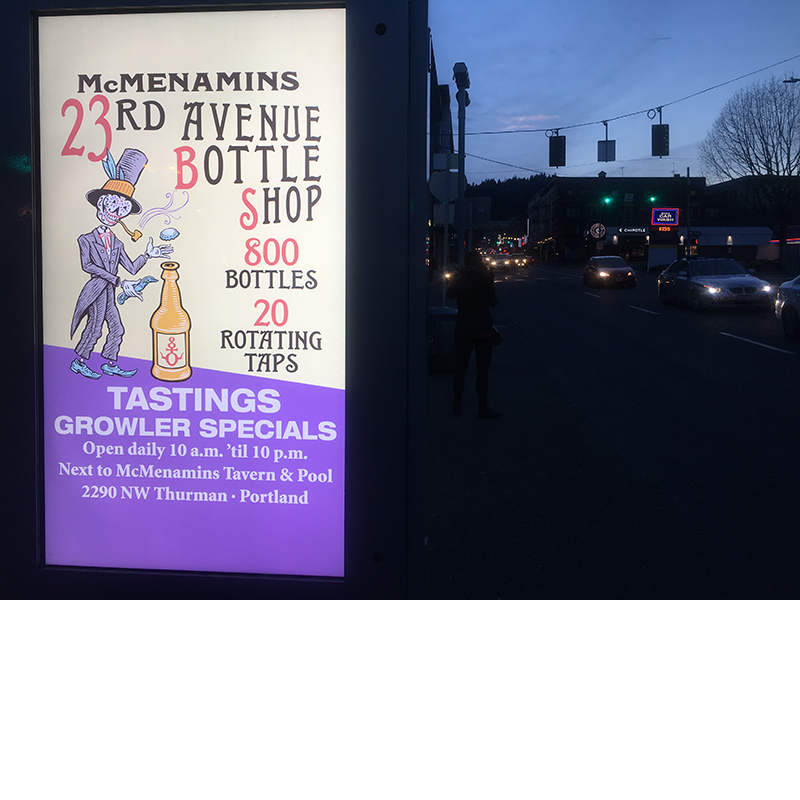 This project illustrates one example of how you can put our team to work for yours, bringing a project from concept to reality. 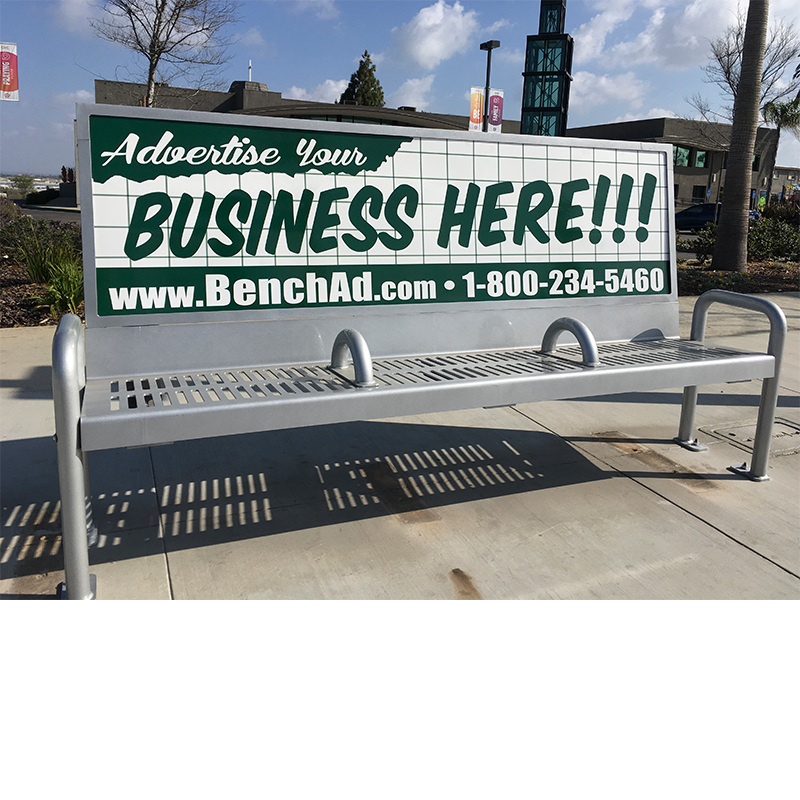 If you are in the San Gabriel Valley in Southern California, check out the complete Rosemead Blvd. 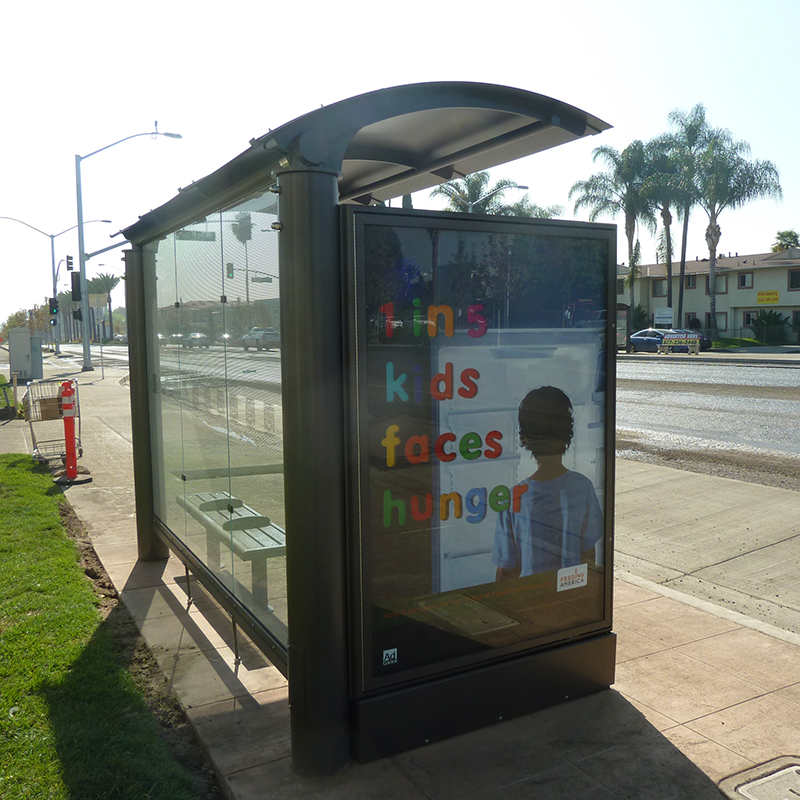 project between Las Tunas and Broadway. 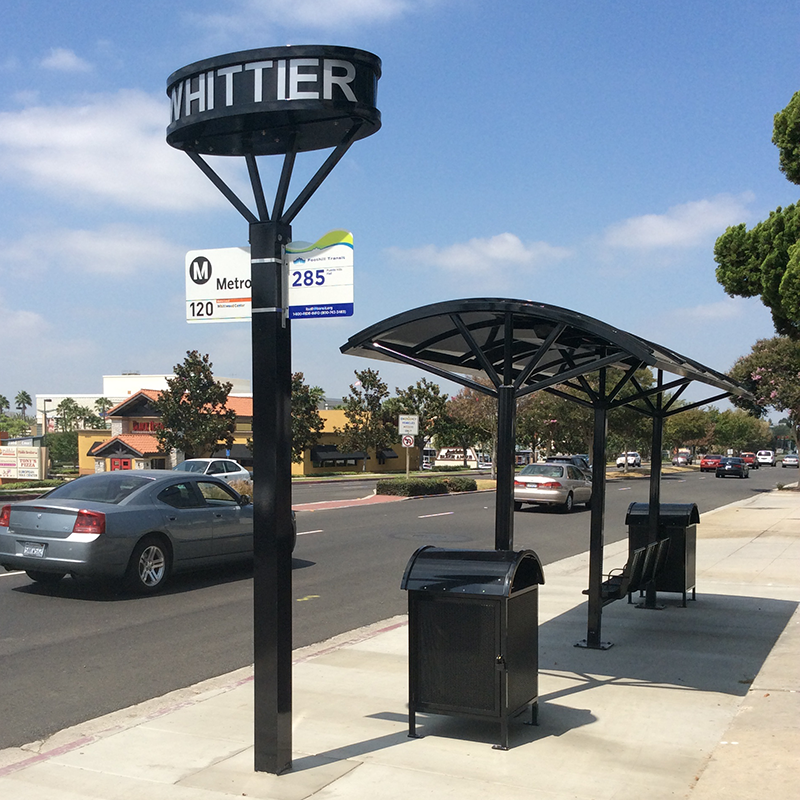 The City of Whittier selected shelters from Tolar’s Signature Voyager series in two different sizes. 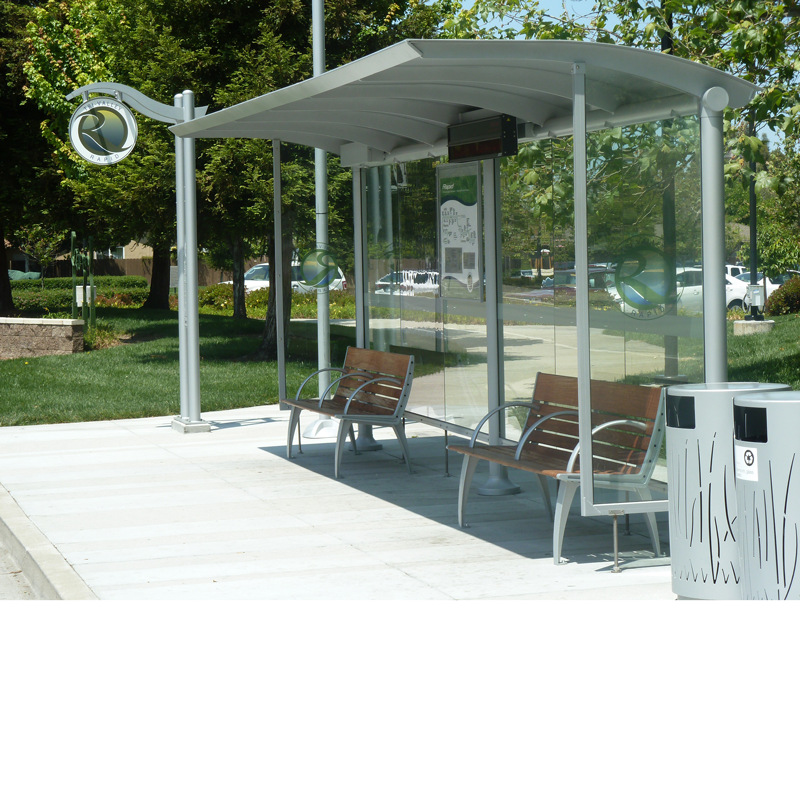 City staff also asked us to provide City branding pylons and matching trash receptacles. 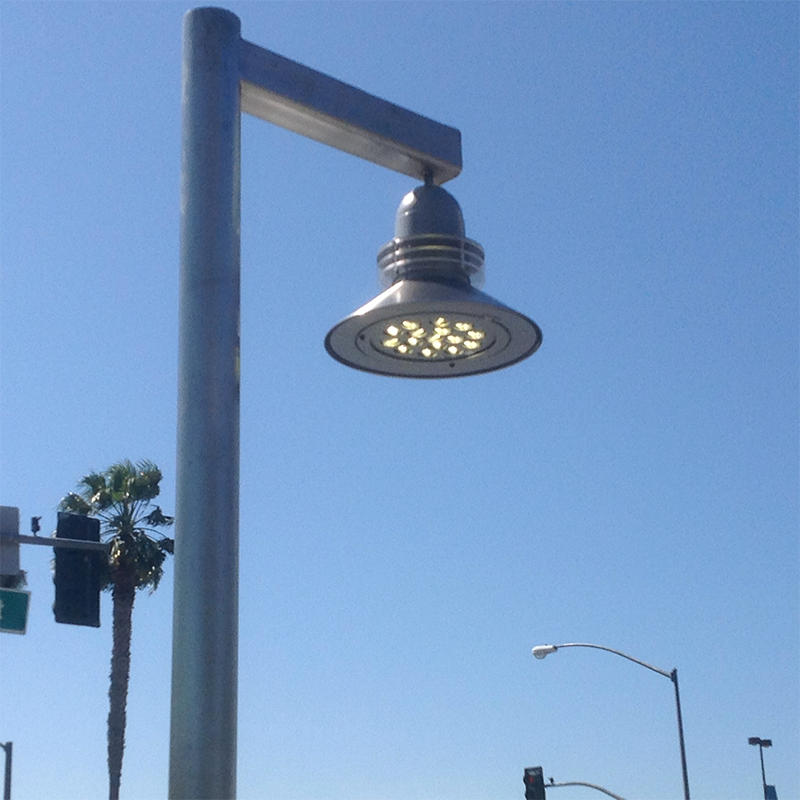 These easy to install and easy to maintain structures are illuminated with solar powered LED fixtures. 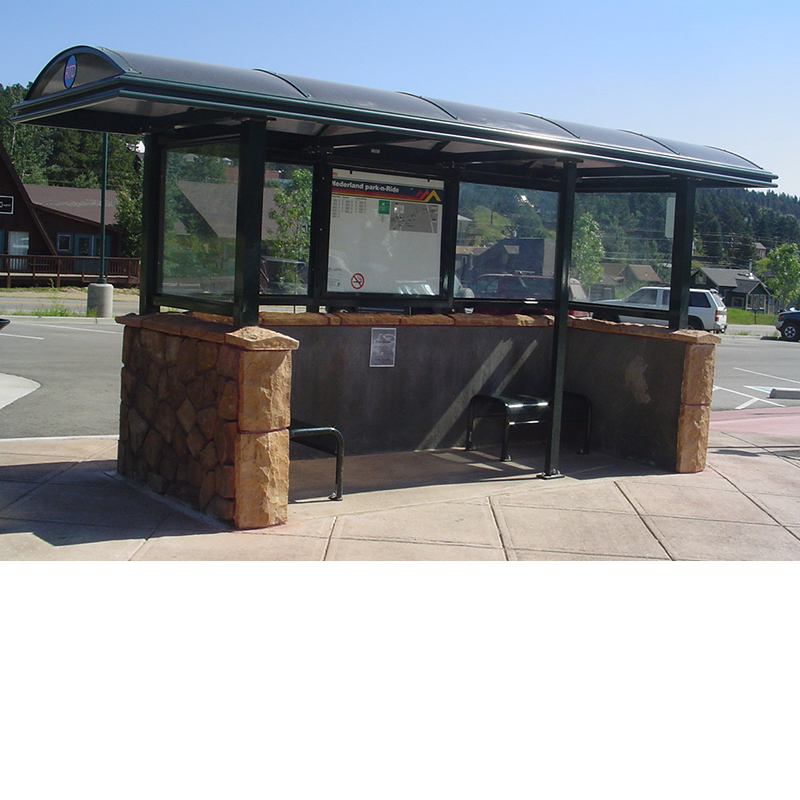 Through a competitive bid process Tolar Manufacturing was awarded a multi-year contract to design and build a standard transit shelter for RTD-Denver. 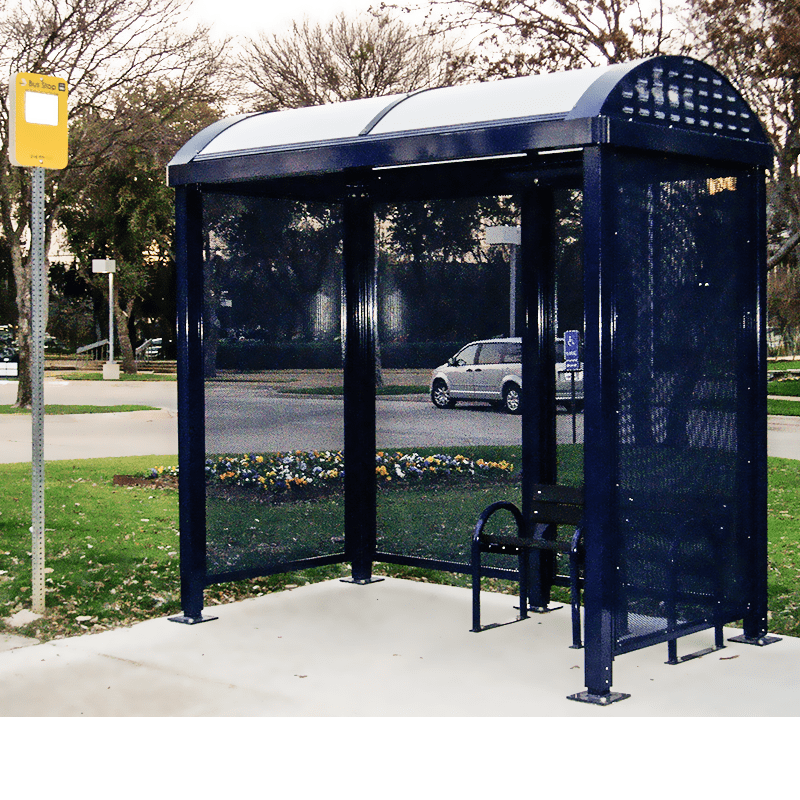 The shelter based on Tolar’s legacy Sierra series features three different wall options plus a combination of perforated aluminum and 3/8” tempered glass walls, an integrated map case, integrated bike loops and roof overhangs on both ends for additional shelter capacity. 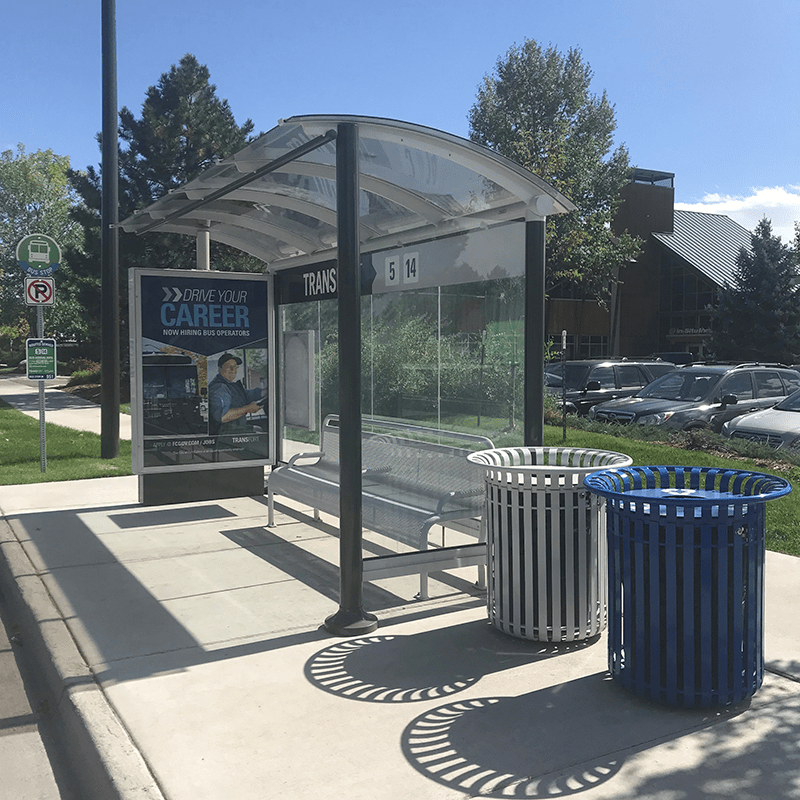 Tolar Manufacturing was recently awarded a project by the City of Ft. Collins, Colorado for transit street furniture elements for their Lincoln Corridor project. 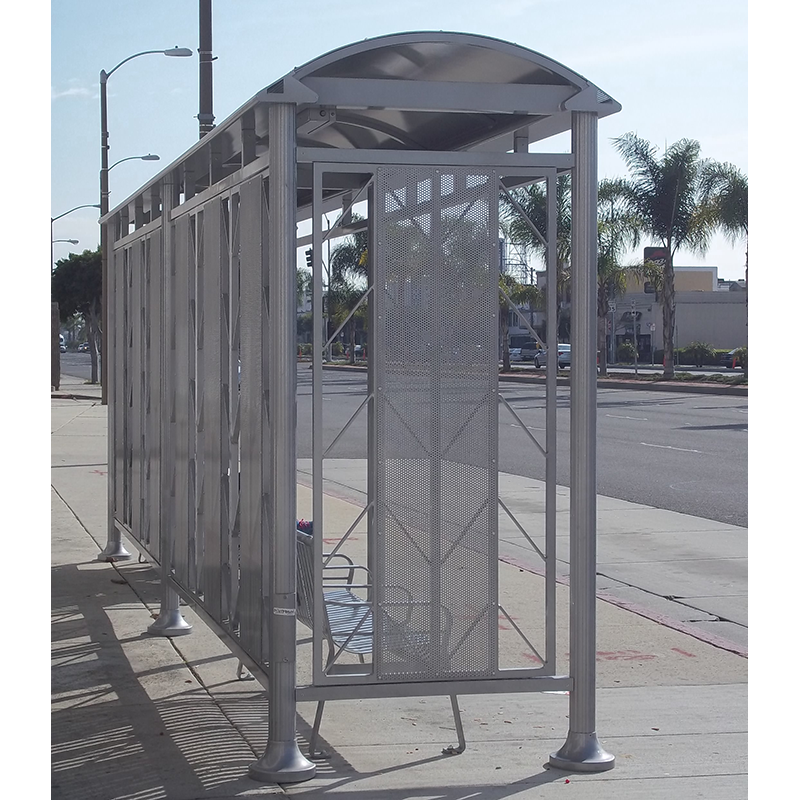 The Tolar Signature Sunset 14-ft advertising shelters include environmentally friendly solar illumination, rear wall branding, steel strap benches as well as steel strap waste and recycling receptacles. 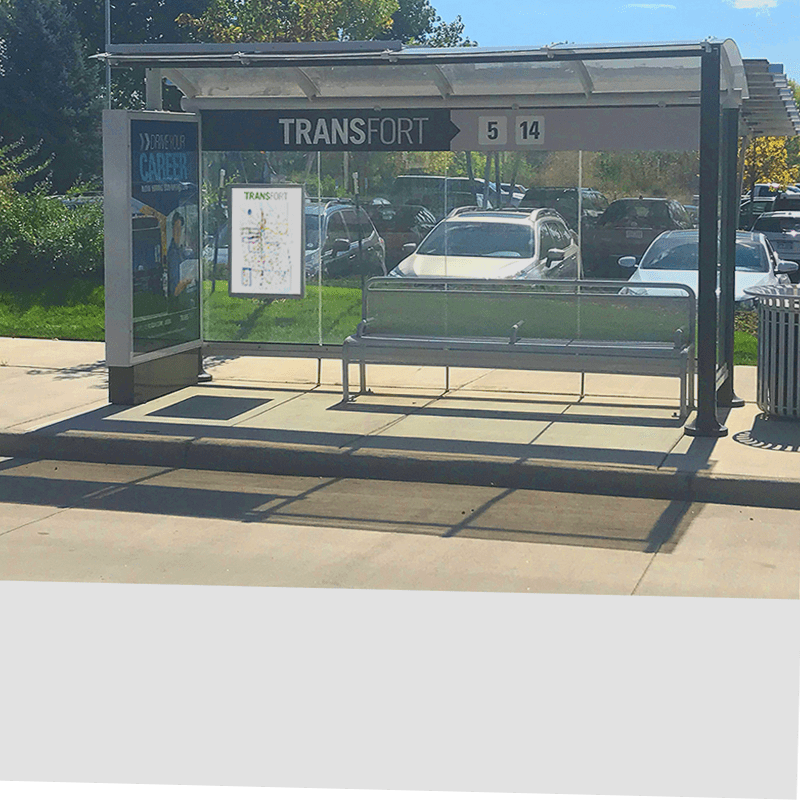 Other project improvements include custom sculptures, paver art, improved landscaping, lighting, bike securement locations and pedestrian mobility improvements, truly creating a Sense of Place™ for the City of Fort Collins. 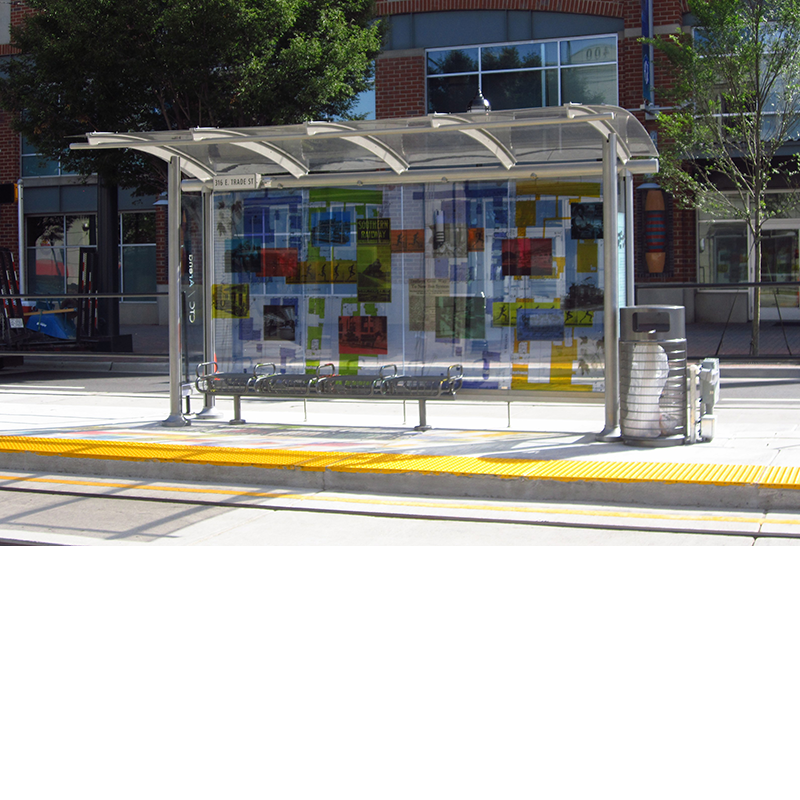 We are proud of the role our team played in this great neighborhood improvement project for the City of Ft. Collins. 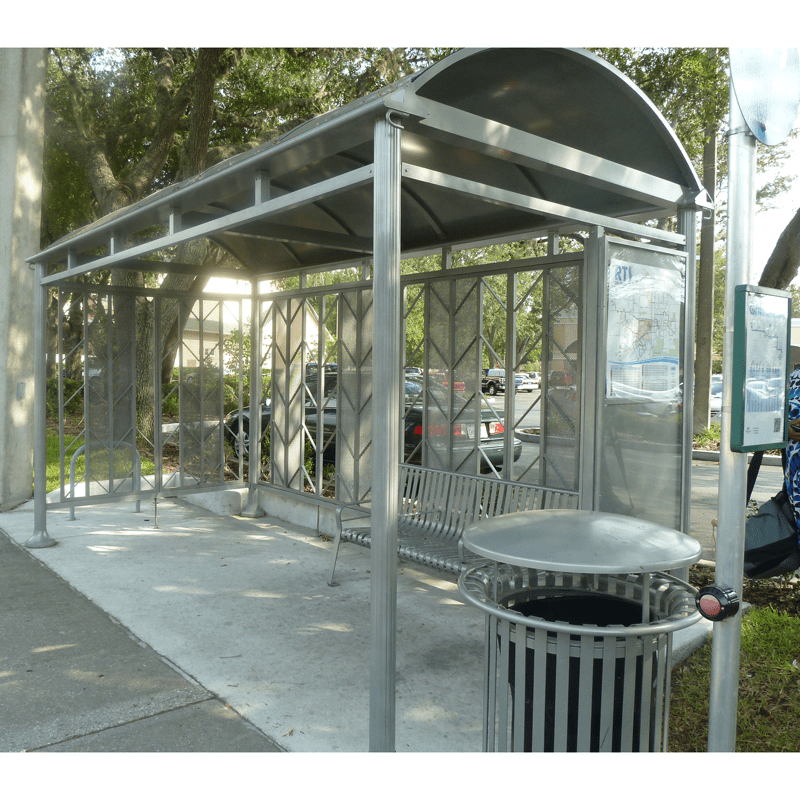 The Regional Transit System in Gainesville, home of the Florida Gators, selected this high capacity transit shelter solution from Tolar’s Euro line. 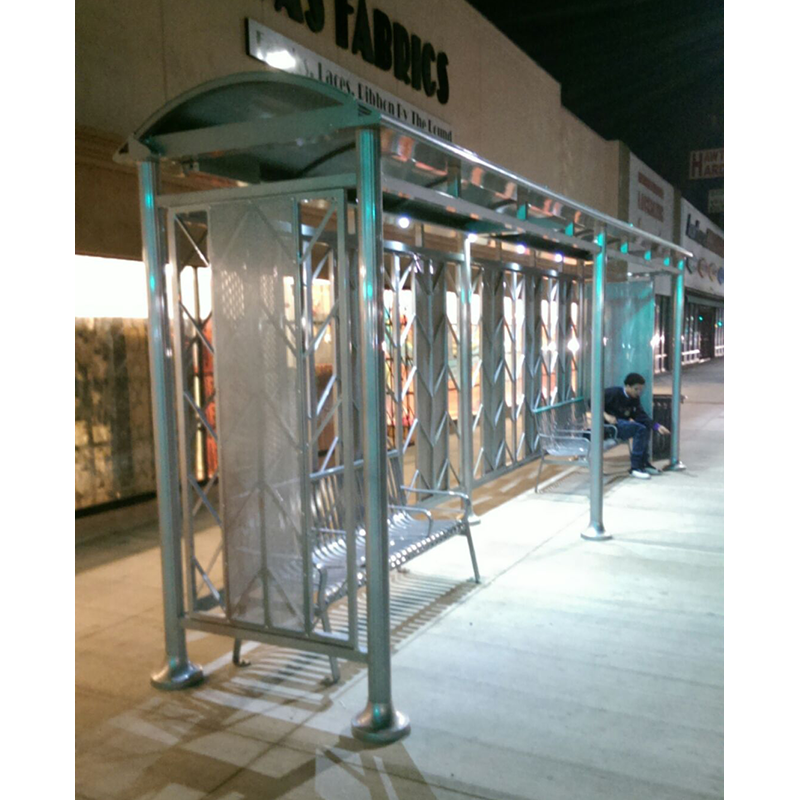 Designed for high volume locations, this shelter is unique to this project with a 16′ X 8′ footprint, custom Herringbone design perforated metal walls, steel strap street furniture and an integrated map case. 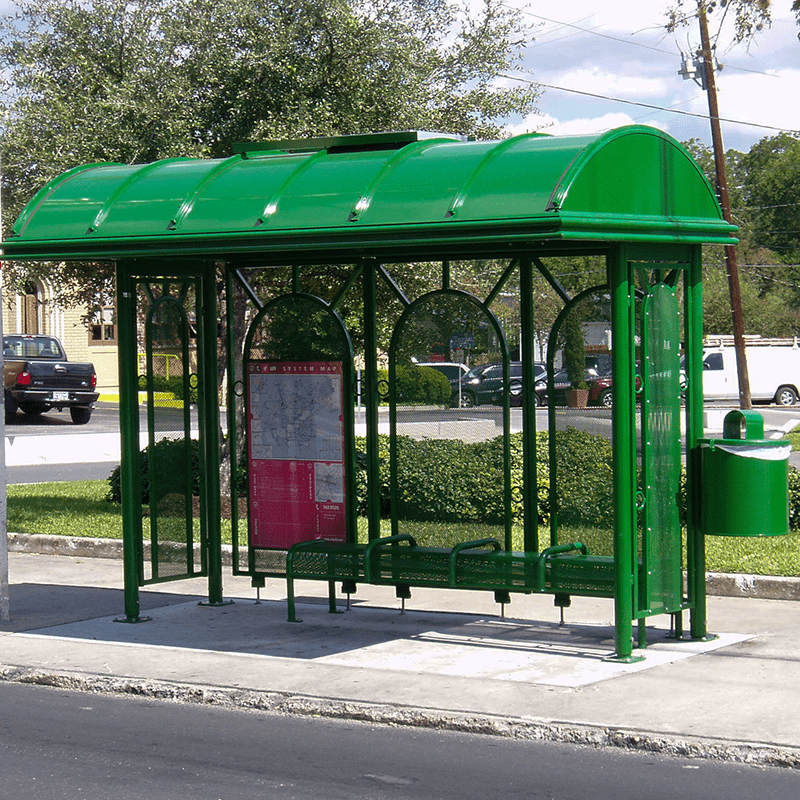 The transit system selected this distinctive shelter design for several major trip generators in the Gainesville community. 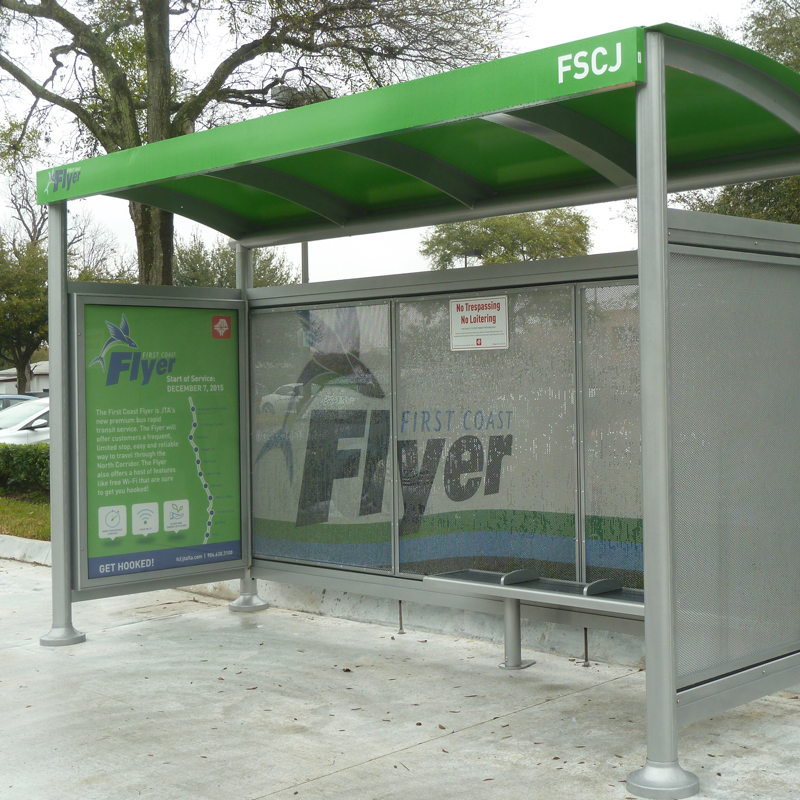 Tolar Manufacturing, through its long-term contract with the Jacksonville Transportation Authority, worked with their team and various stakeholders to develop a menu for JTA’s national recognized First Coast Flyer service. 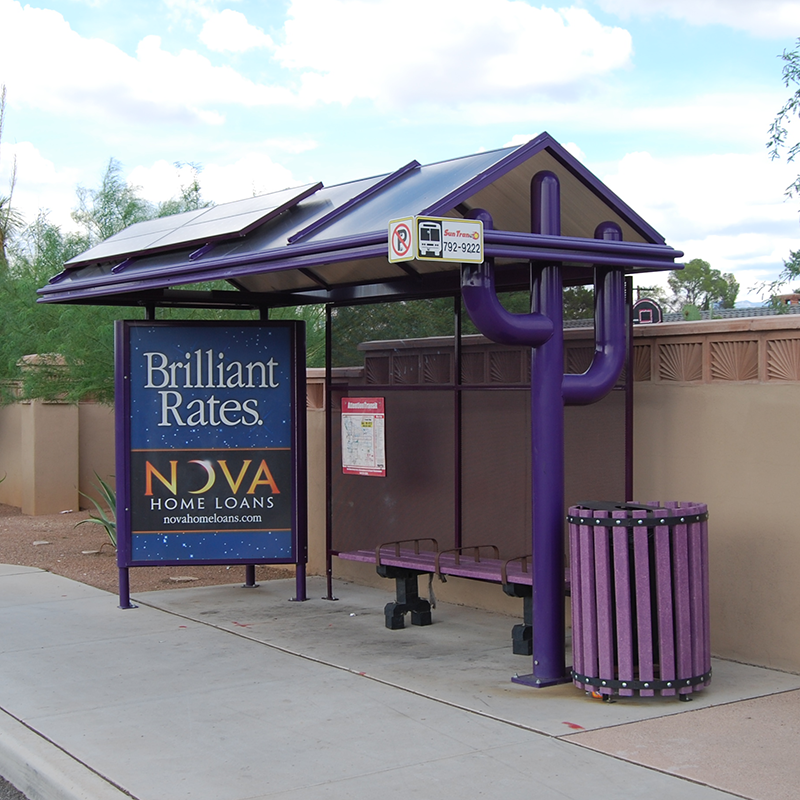 Our portfolio of amenities included a 15’ transit shelter with advertising and non-advertising options, custom branding, Mesa benches, bike loops and a 10’ branding/passenger informing totem with twin 32” digital displays in a NEMA-rated enclosure to provide up-to-date passenger information. 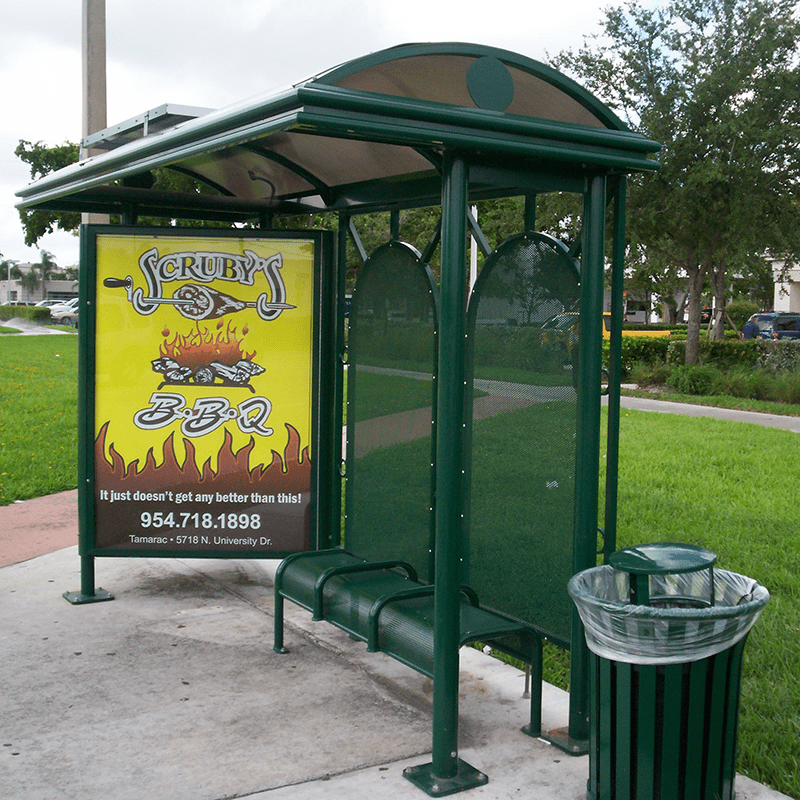 The Jacksonville Transportation Authority wanted to bring a new look to their downtown transit shelters. Tolar worked with their team to accomplish that goal using state of the art engineering software, including digital prototyping. 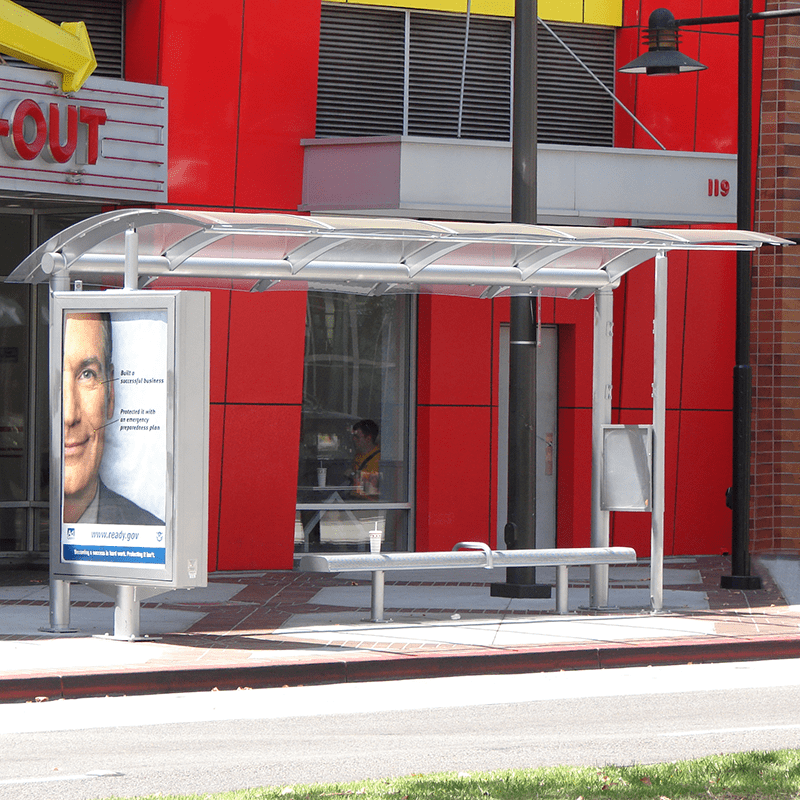 The end result is a comprehensive street furniture menu. 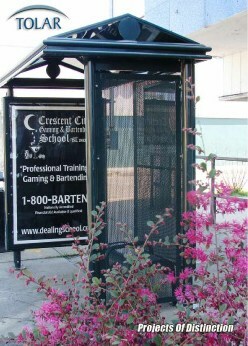 Deigned to feature shelters in three different lengths with or without an advertising kiosk and drawn from Tolar’s Signature Sunset series, Tolar designed and fabricated radius roof shelters with LED solar illumination, custom perforated metal rear walls, agency map case, location plaques with JTA logos, complementary steel strap bench and trash receptacle, bike loop and custom powder coat finishes. 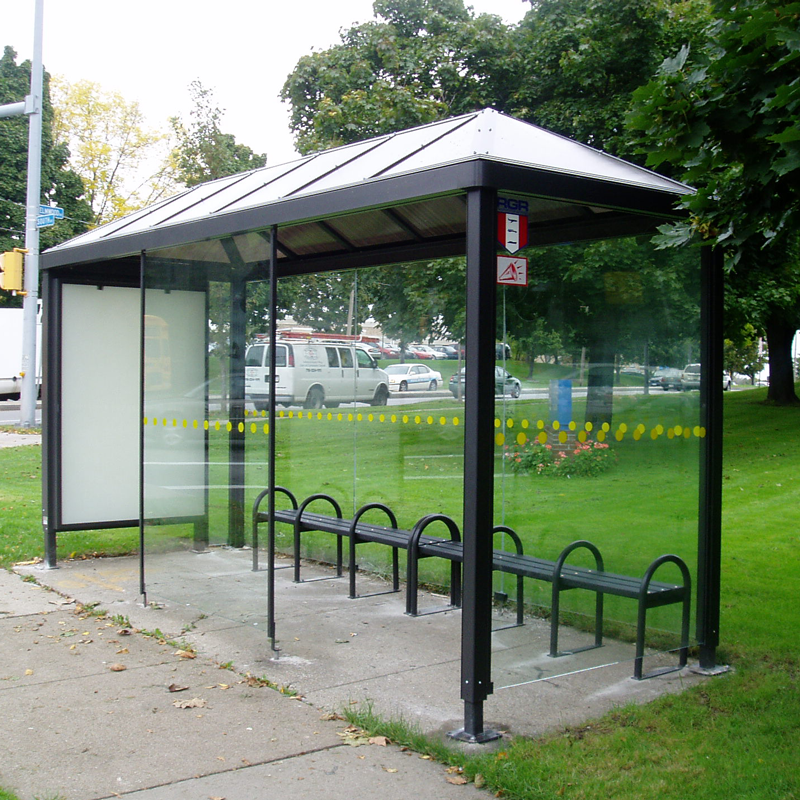 A key feature of this modular design is that all shelters use the same kit of parts for ease of maintenance. 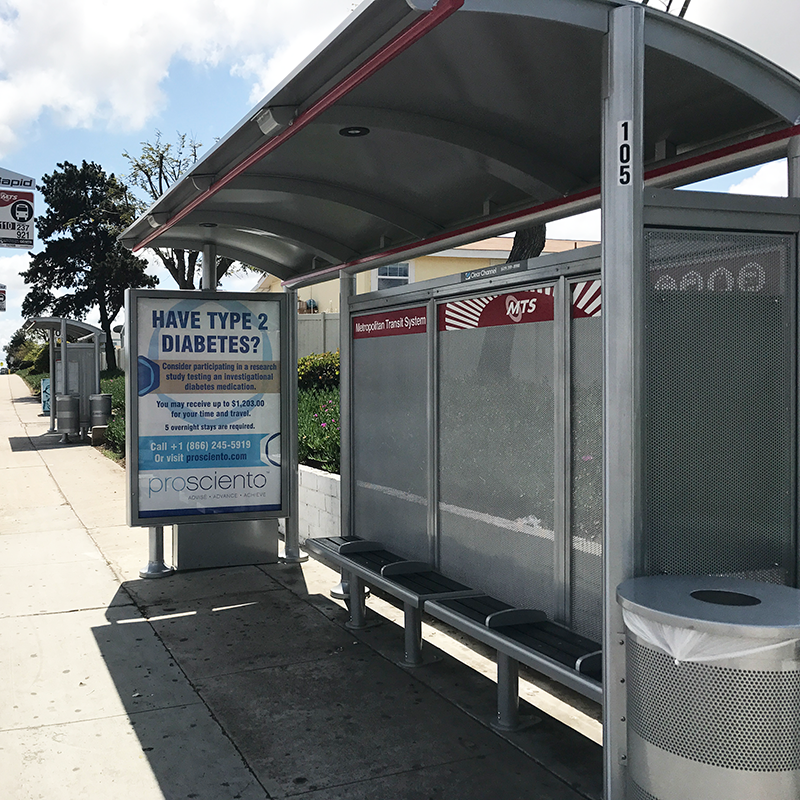 The team at JTA recognizes that quality street furniture and accurate passenger information help encourage the use of mass transit in the community and they made the necessary investment in that process. 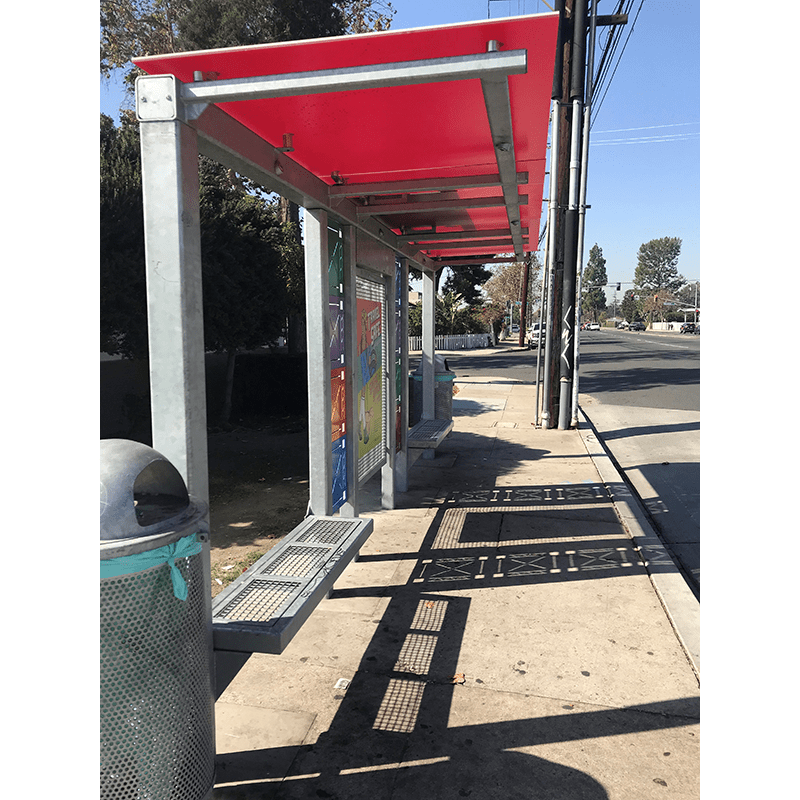 The Tolar Team collaborated with an outdoor advertising client to create a hybrid shelter design consisting of a Euro series shelter roof extrusion and a Sierra series shelter support system. 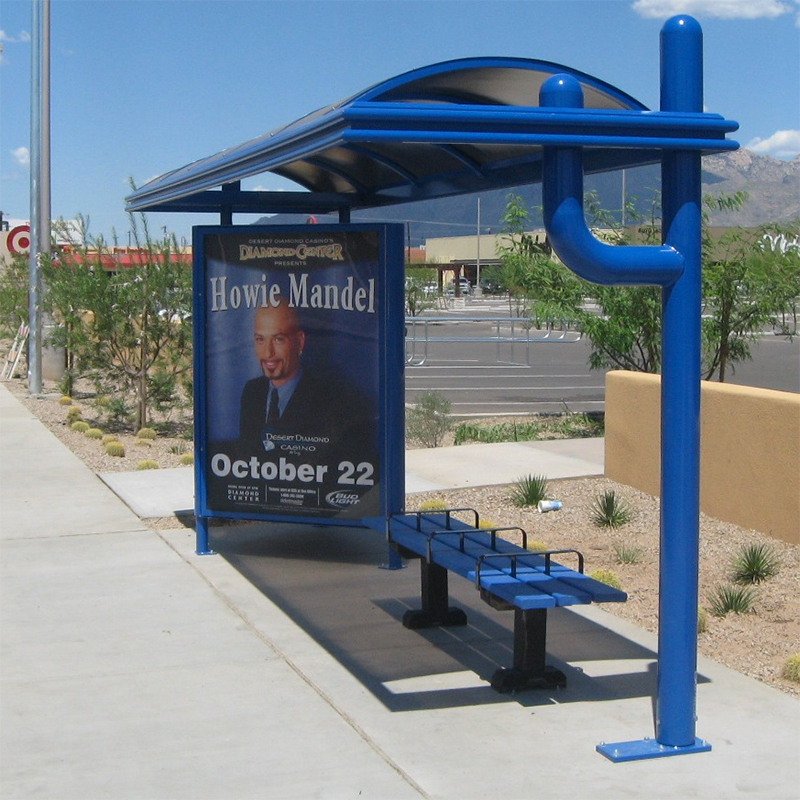 Coined, “The MAX Shelter,” the design includes two non-advertising shelter models and one model with an advertising display. 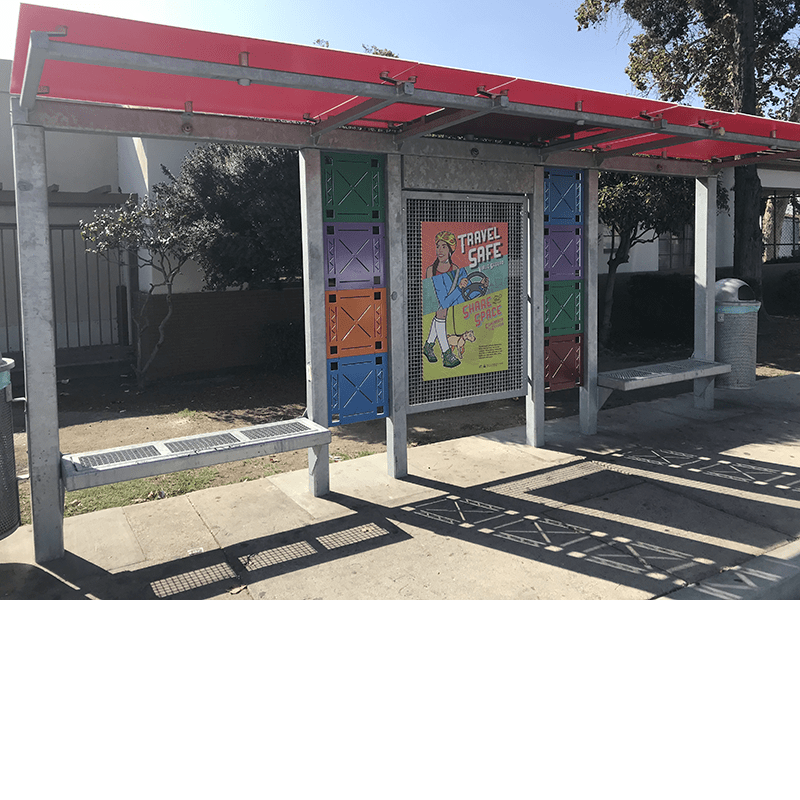 All of the shelters featured two-color, powder-coat paint design with white Lexan roof panels and were made with an 8-foot perforated-metal bench and optional solar lighting. 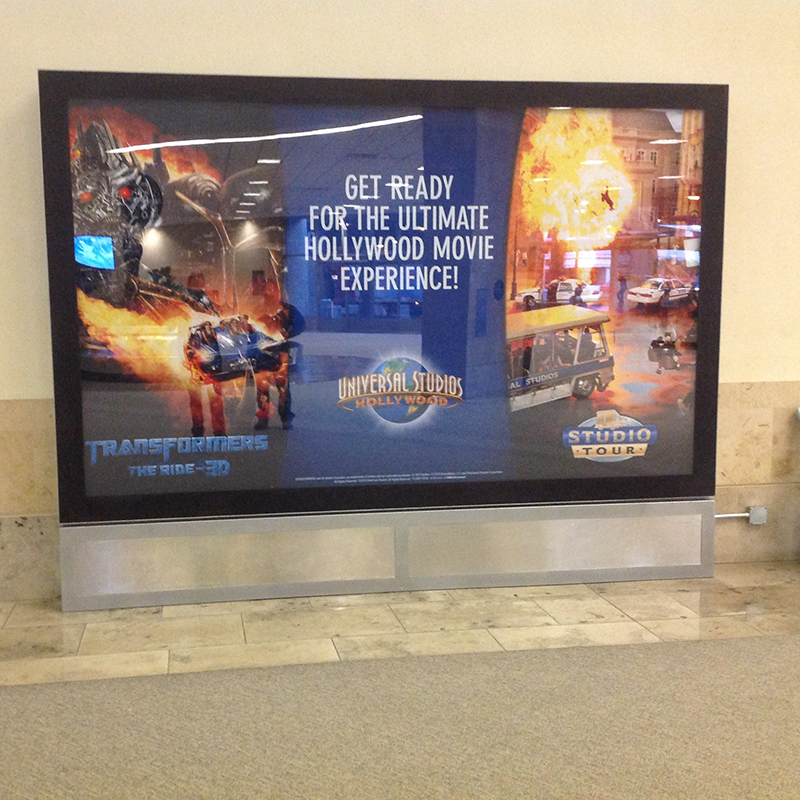 There are a tremendous amount of activities for kids and adults alike in Orlando, Florida. 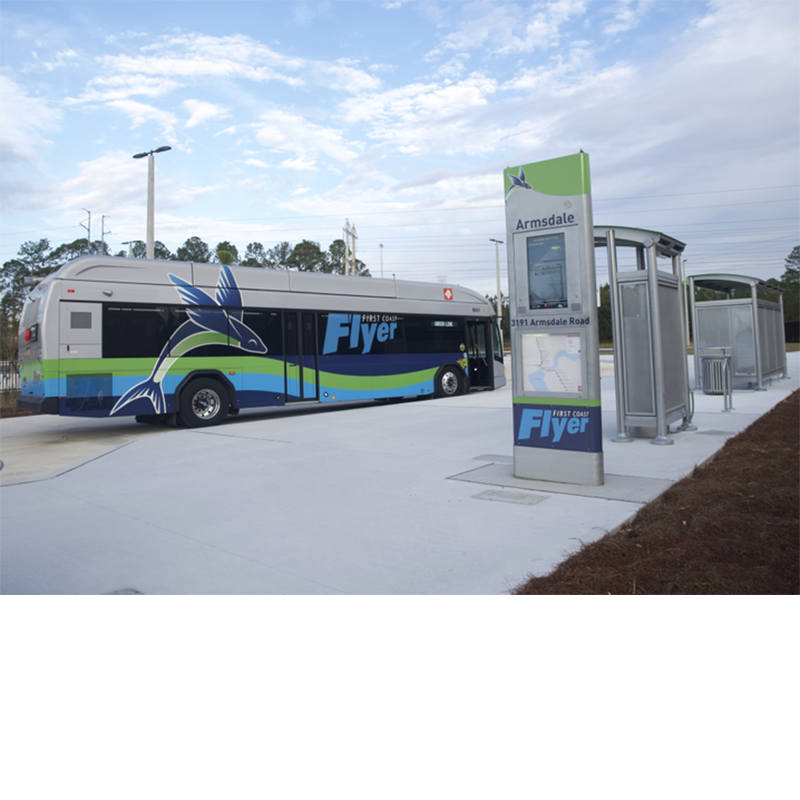 You can ride to most of them in air-conditioned comfort on Lynx, Central Florida’s fantastic transit provider. 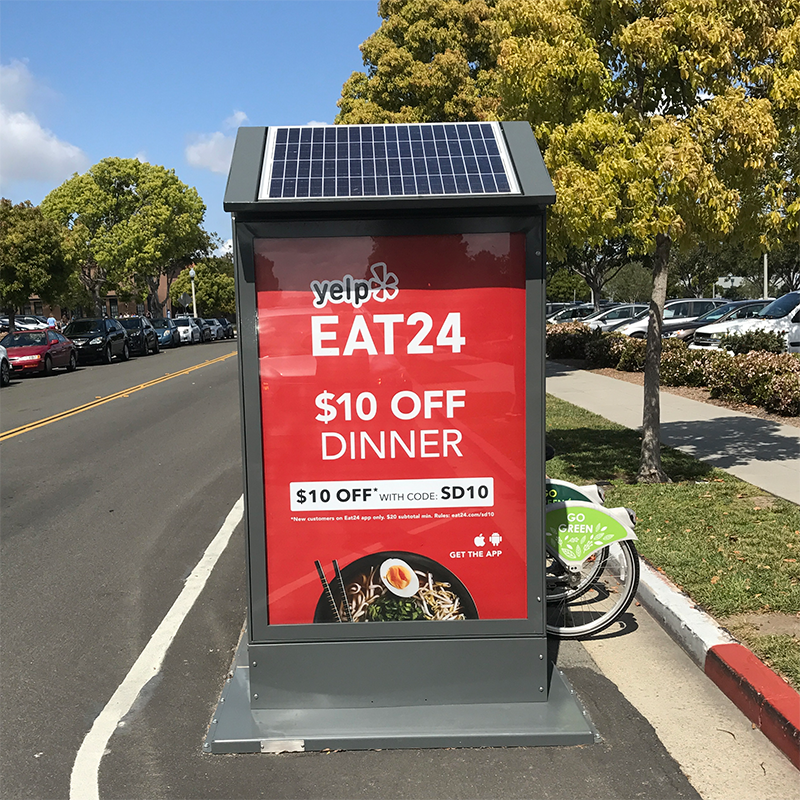 Tolar was selected for a multi-year award to create a distinctive menu of large and small shelters with optional advertising kiosks, solar illumination, complementary bench and trash receptacles. 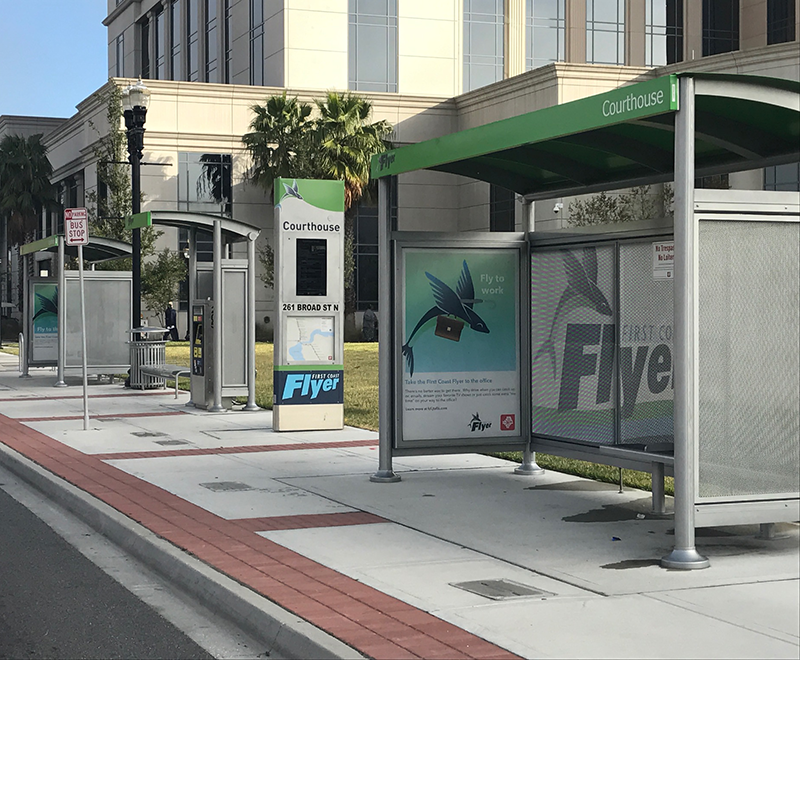 Ranked as the fifth best outdoor city by Forbes in 2008, the service provided byHillsborough Regional Transit (HART) in Tampa, Florida is a great way to get to the activities in the Tampa Bay community. 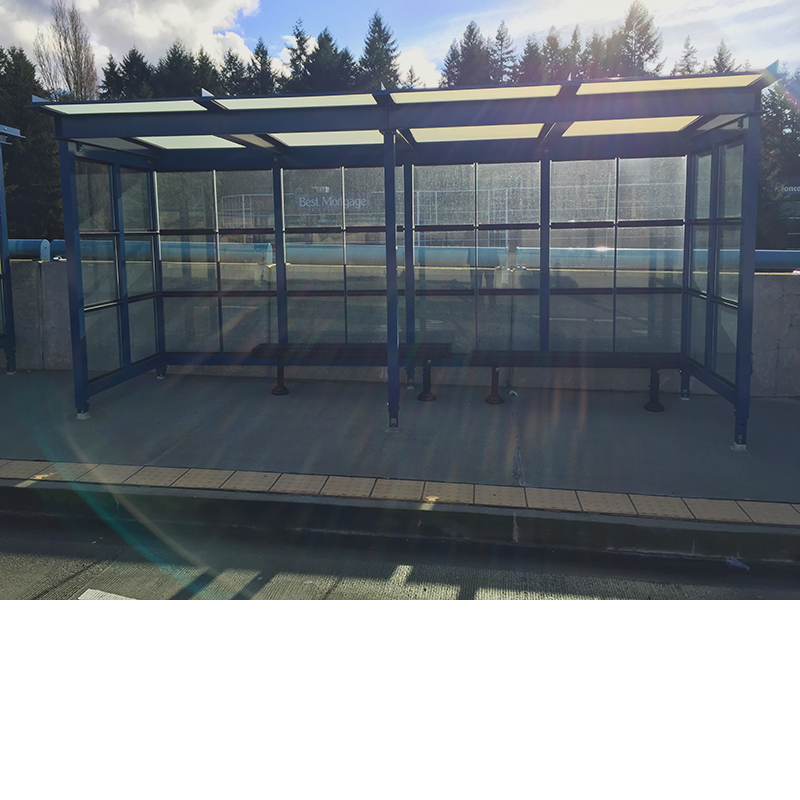 Tolar Manufacturing was pleased to be awarded a second multi-year contract to fabricate transit shelters and provide solar illumination for the HART. 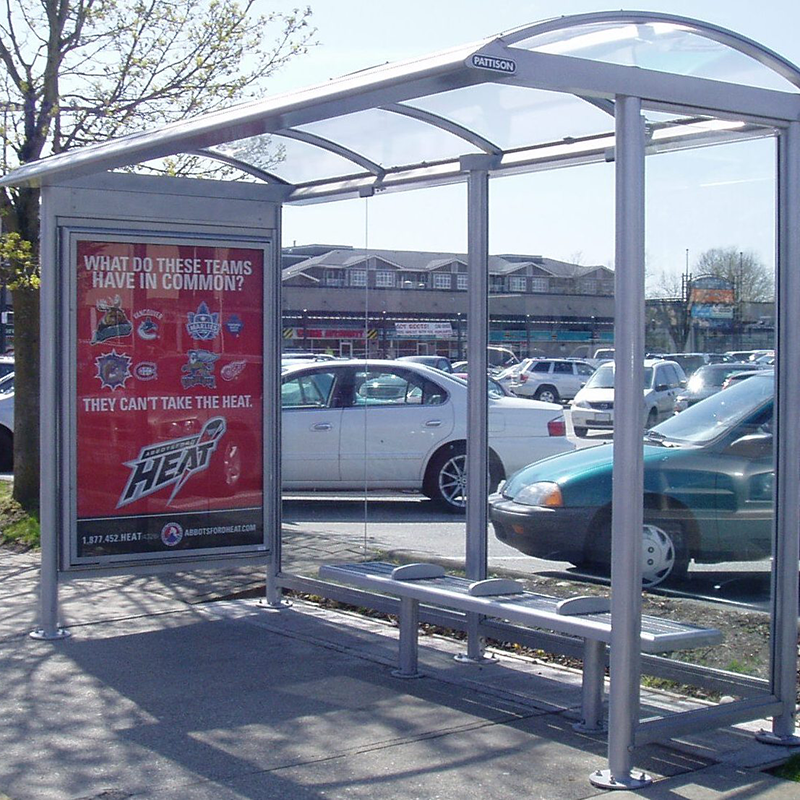 Selected from our Niagara product line, these shelters are designed to support HART’s core mission of connecting people. 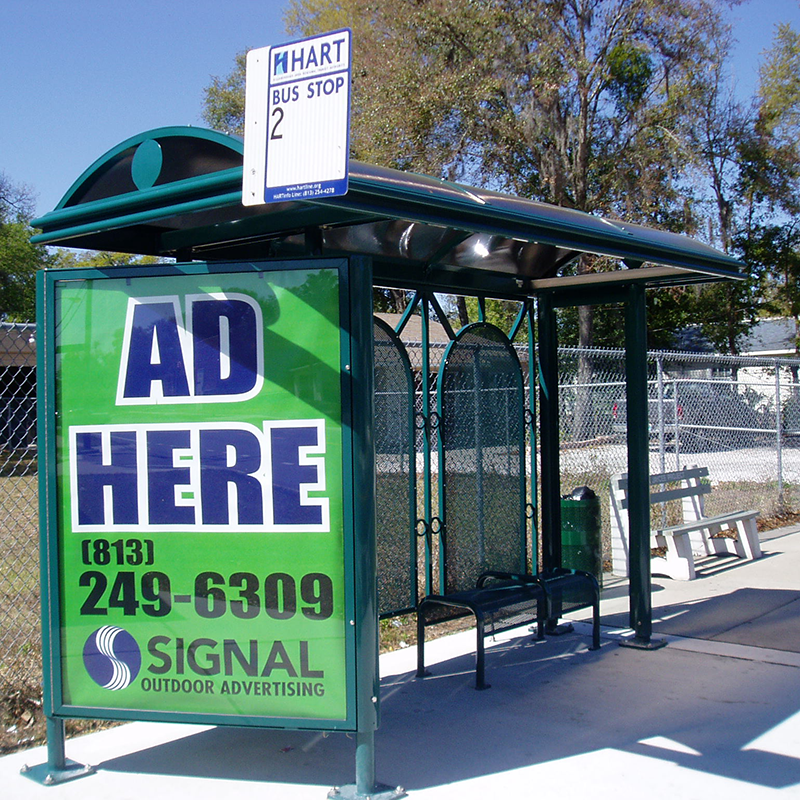 In addition, Tolar is honored to also provide the shelters for HART’s shelter advertising partner. 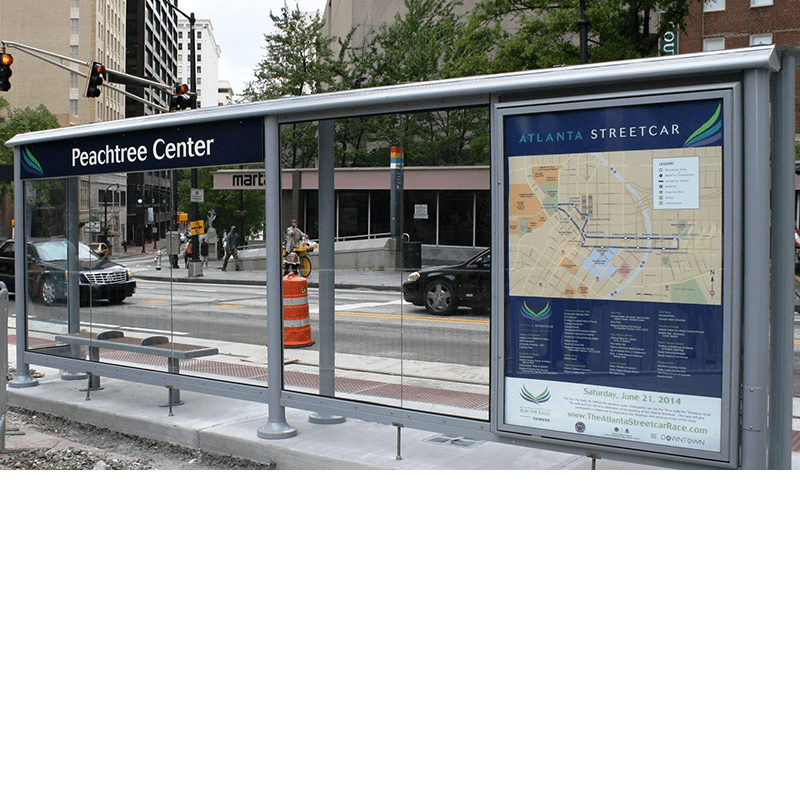 The purpose of the Atlanta Streetcar is to provide an integrated multi-modal, high-quality transit network that links communities, improves mobility by enhancing transit access and options, supports sustainable projected growth, promotes economic development, and encourages strategies to develop livable communities. 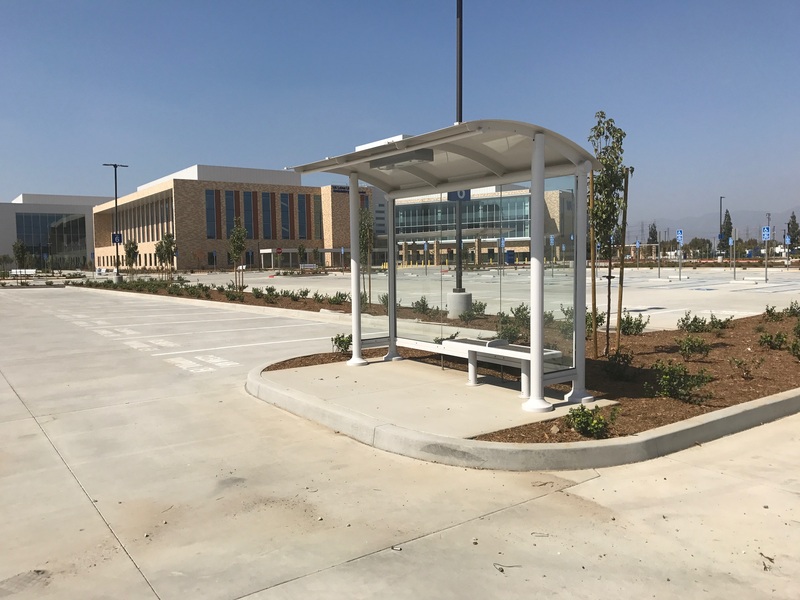 Tolar Manufacturing was proud to be selected to complete the final design and fabrication for this exciting project. 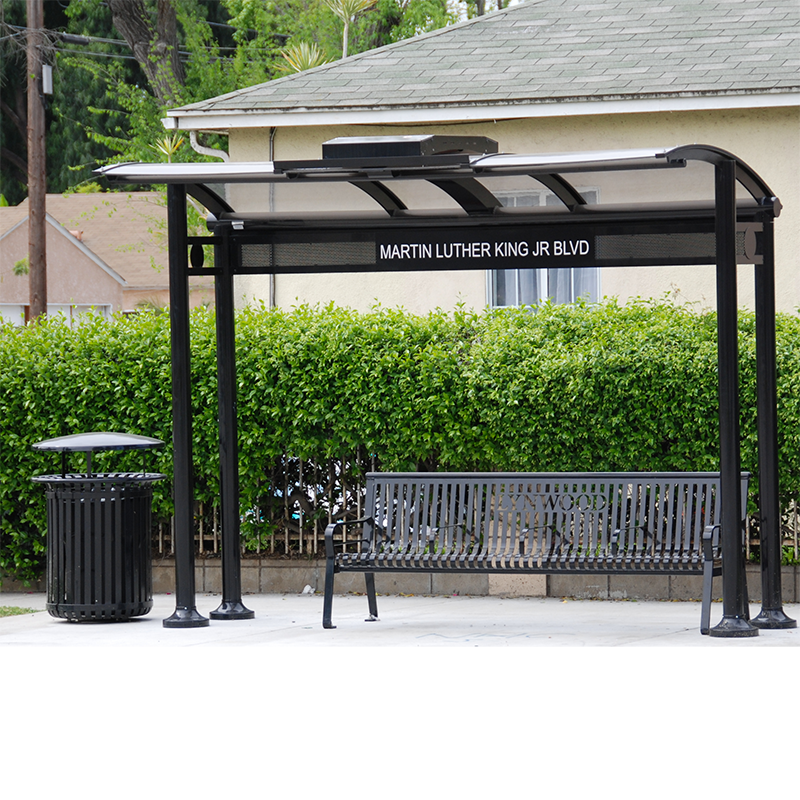 Based on our Signature Empire series, the transit shelters feature a custom grey roof panel, rear wall map case powered by LED illumination and agency branding. 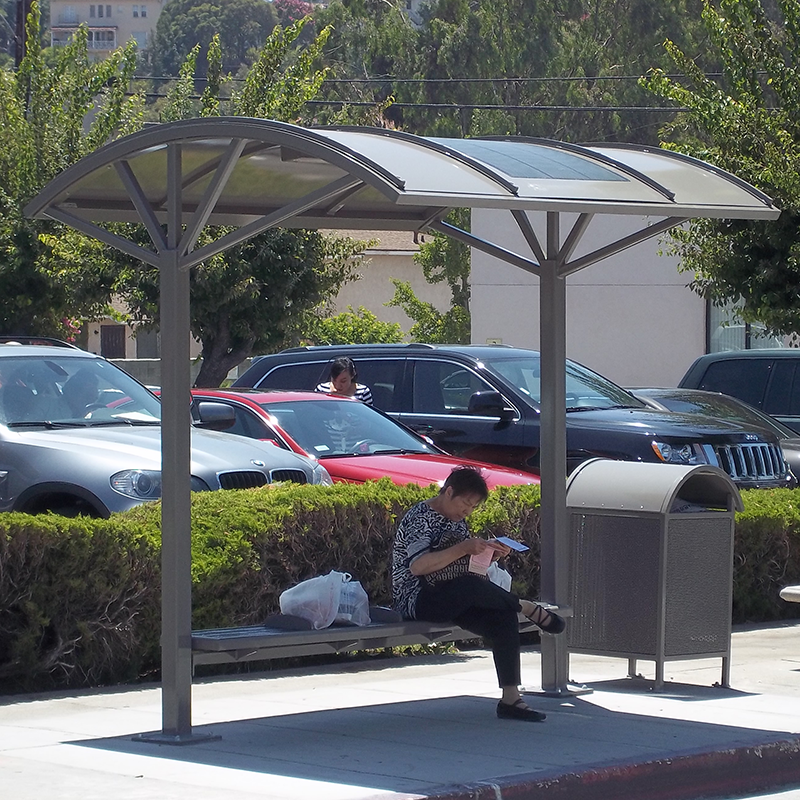 Since 1965 the residents of the metro Atlanta area have been served by the multi-modal transit services of the Metropolitan Atlanta Rapid Transit Authority (MARTA). 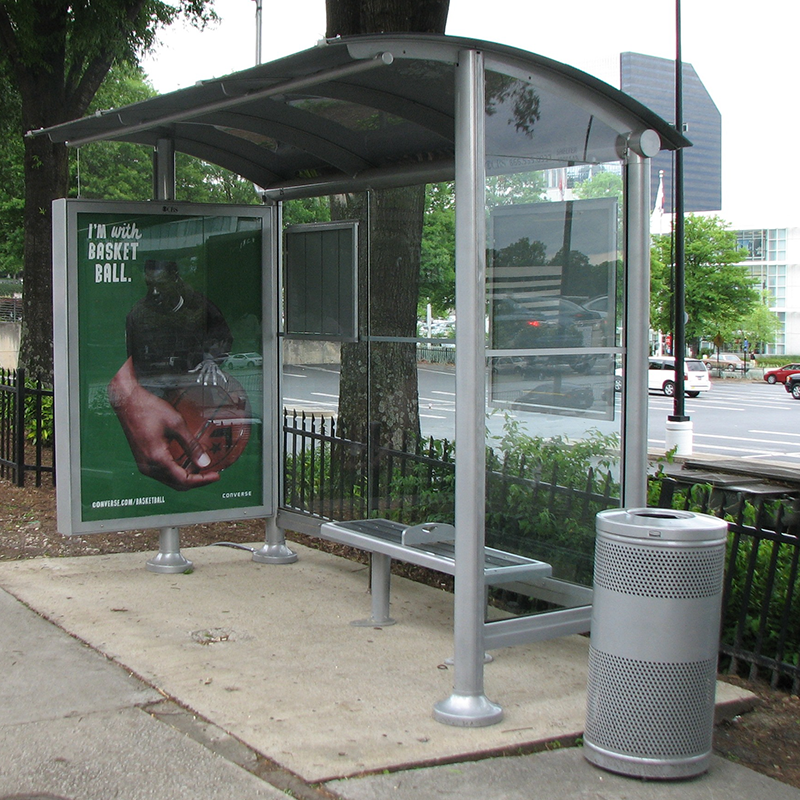 Whether you choose rail or the bus, the professionals at MARTA are hard at work every day meeting the transportation needs of their community. 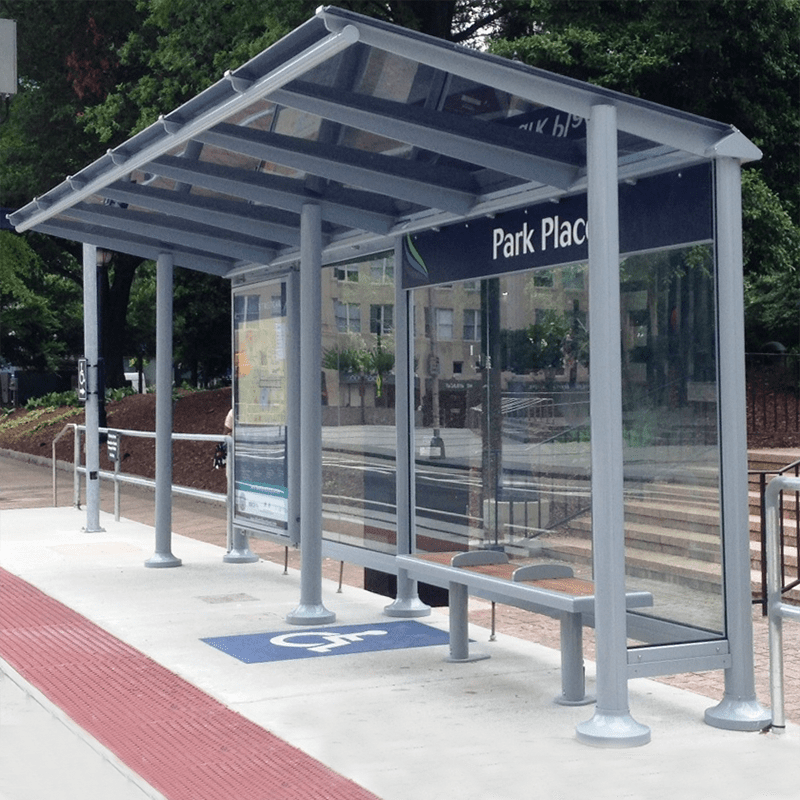 Tolar Manufacturing, after a detailed interview process and plant inspection, was chosen by MARTA through its outdoor advertising partner to provide the transit shelters for this dynamic community. 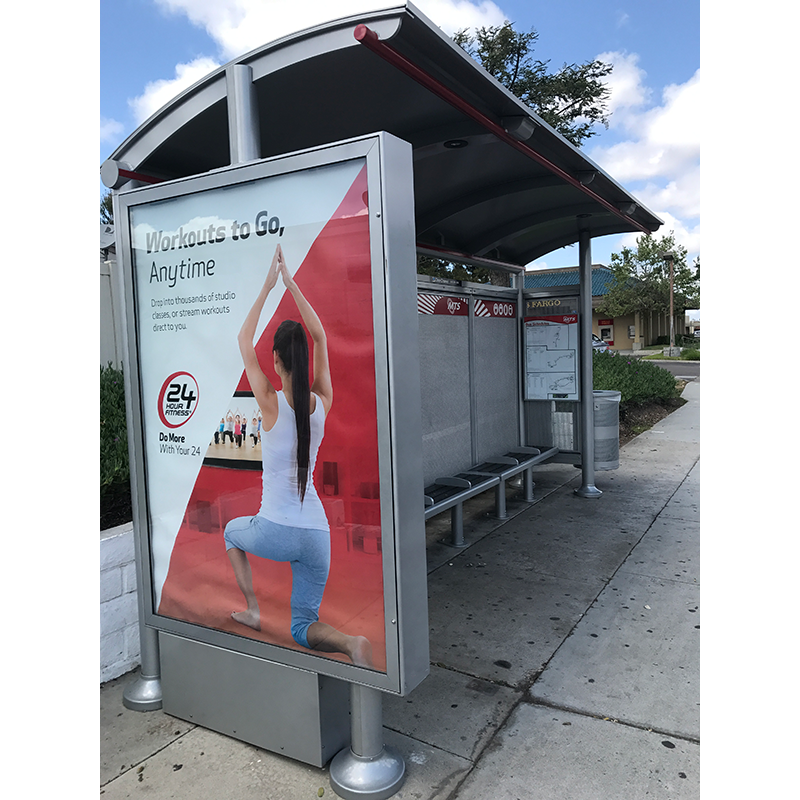 Based on our Signature Sunset series, the MARTA street furniture solution features an all aluminum construction with custom radius roof panels, a media display kiosk, LED illumination, integrated map cases and an environmentally-friendly bench with recycled slats. 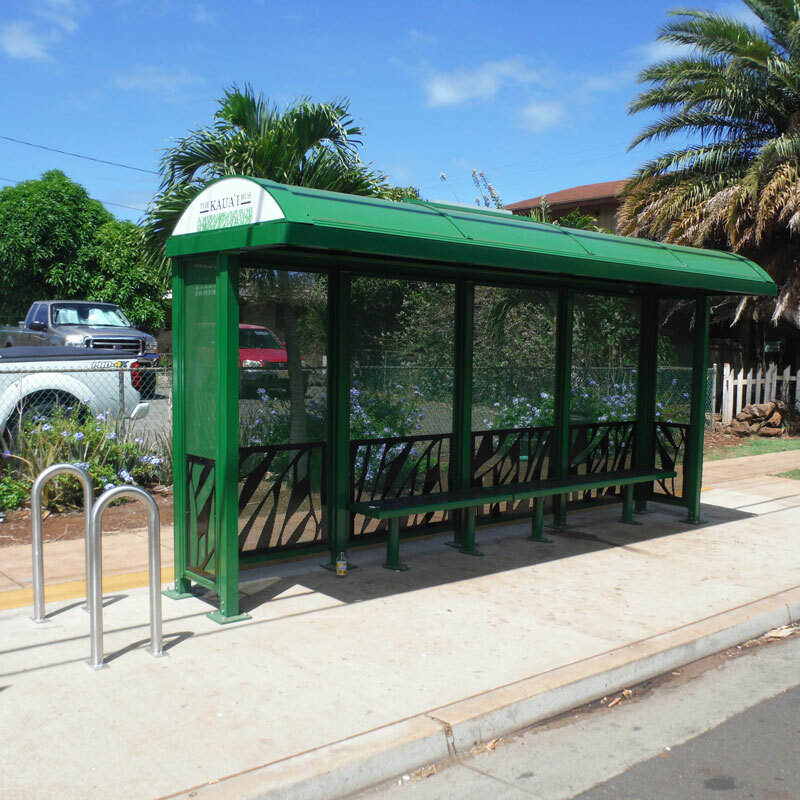 Tolar Manufacturing worked with the County of Kauai and their project consultants to design and fabricate four unique shelter designs based on our Niagara series. 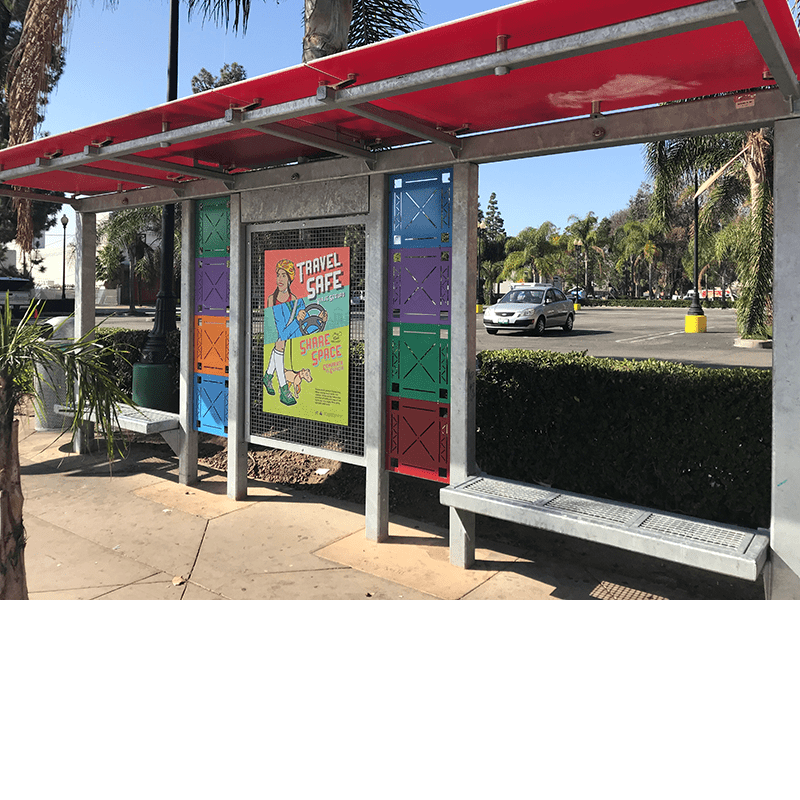 The design communicates the bus service branding with sugar cane patterns along the shelters walls, integrated map case, Mesa benches and dusk to dawn solar illumination. 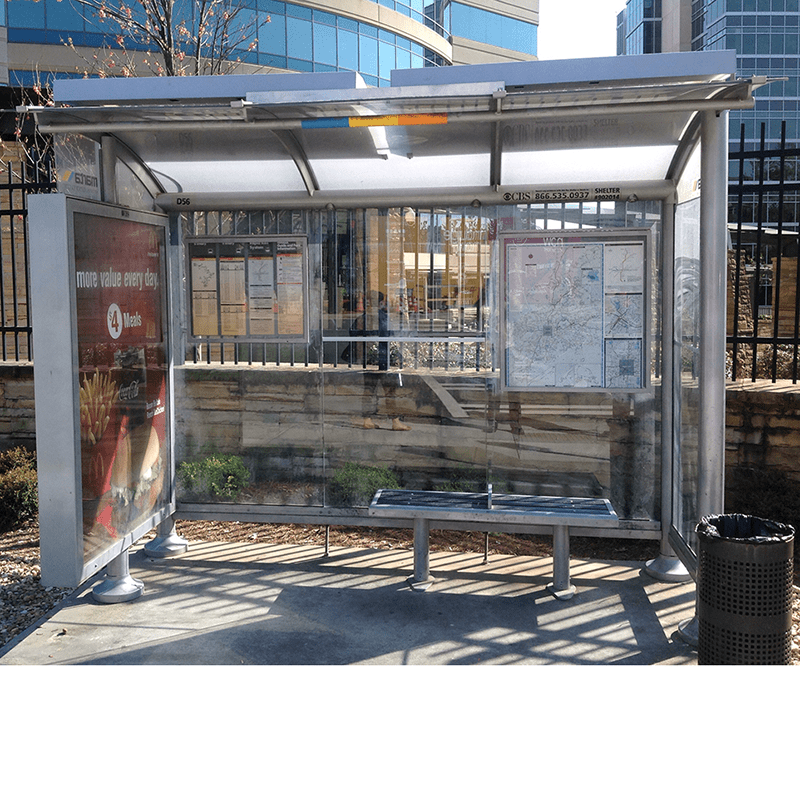 Des Moines Area Regional Transportation Authority (DART) was looking to brand the shelters along their transit routes with the design of their new downtown transit hub, DART Central Station. 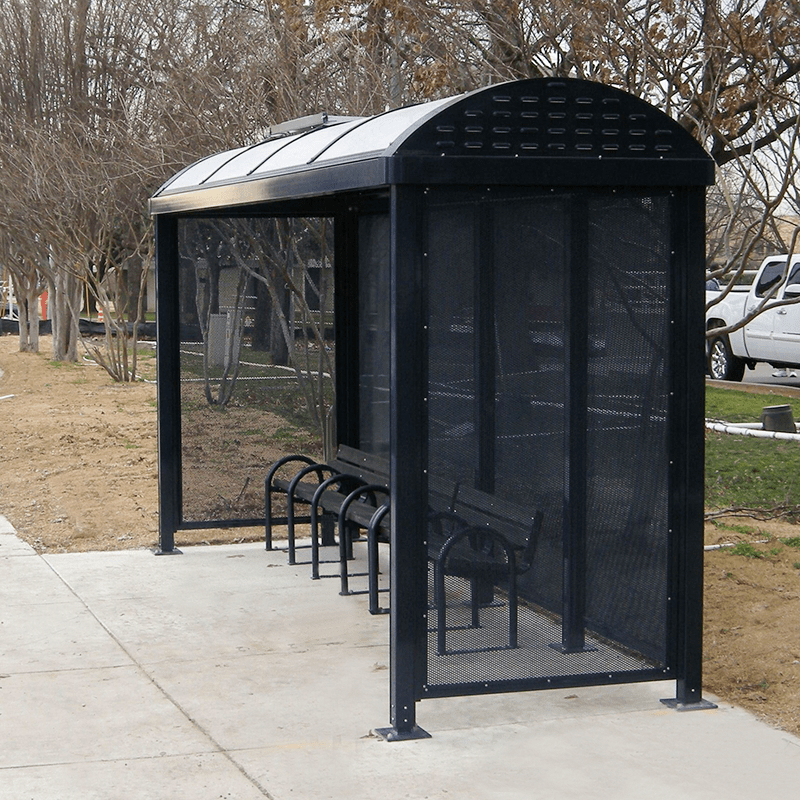 Tolar Manufacturing, through a competitive procurement process, was tasked with designing and fabricating the transit shelters for the project under a multi-year contract. 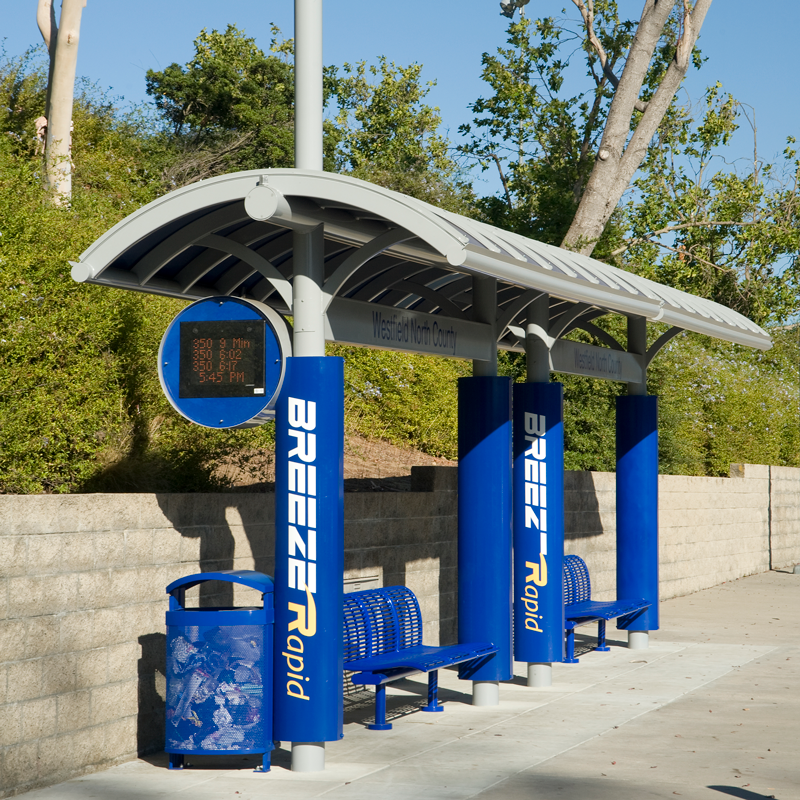 The 11’ shelters, based in concept on Tolar’s Signature Empire series, feature an open beam design, angled support posts, integrated map case, flat back-to-back media display kiosk and Mesa bench. 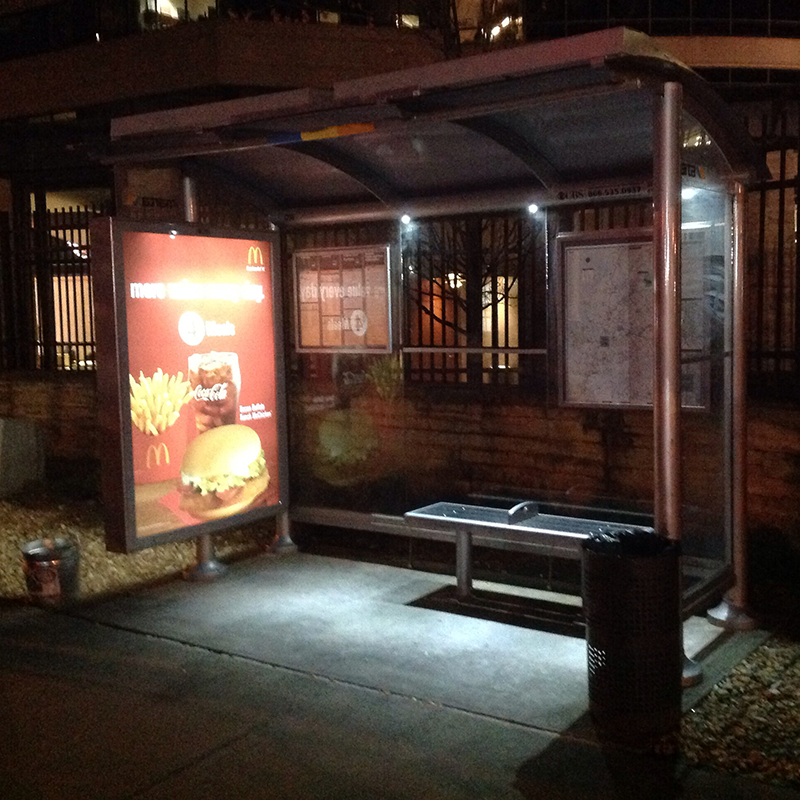 The shelters are illuminated with low draw LED fixtures with the flexibility to be powered by 110V or solar. 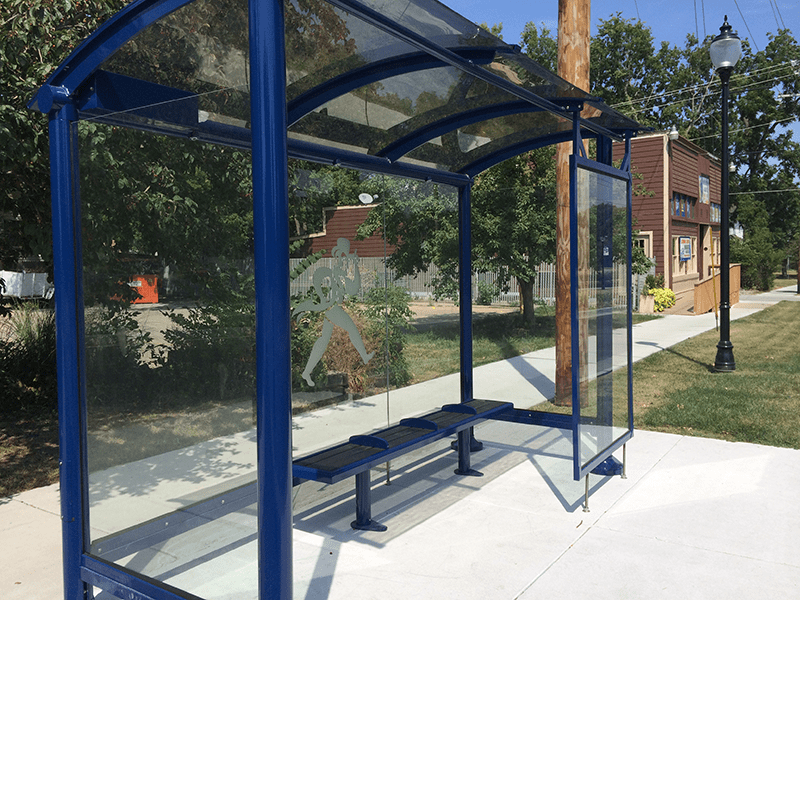 The City of Topeka was looking for distinctive street furniture solutions for specific locations with custom elements to reflect the communities in which they were installed. 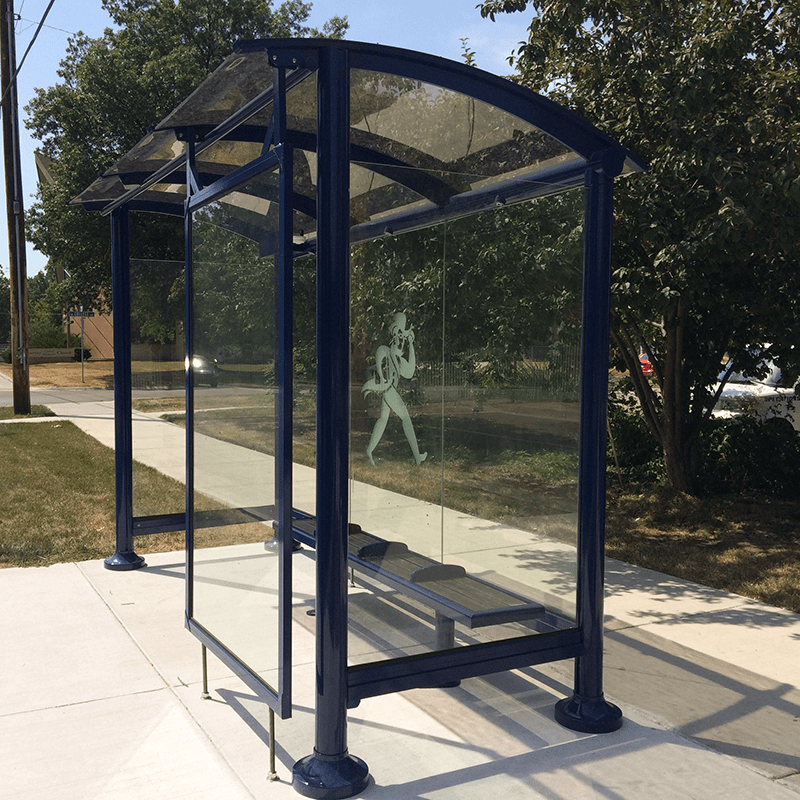 In this example from Tolar’s Signature series custom etched glass was incorporated into the shelter design in order to create a true Sense of Place™ in the community near Washburn University. 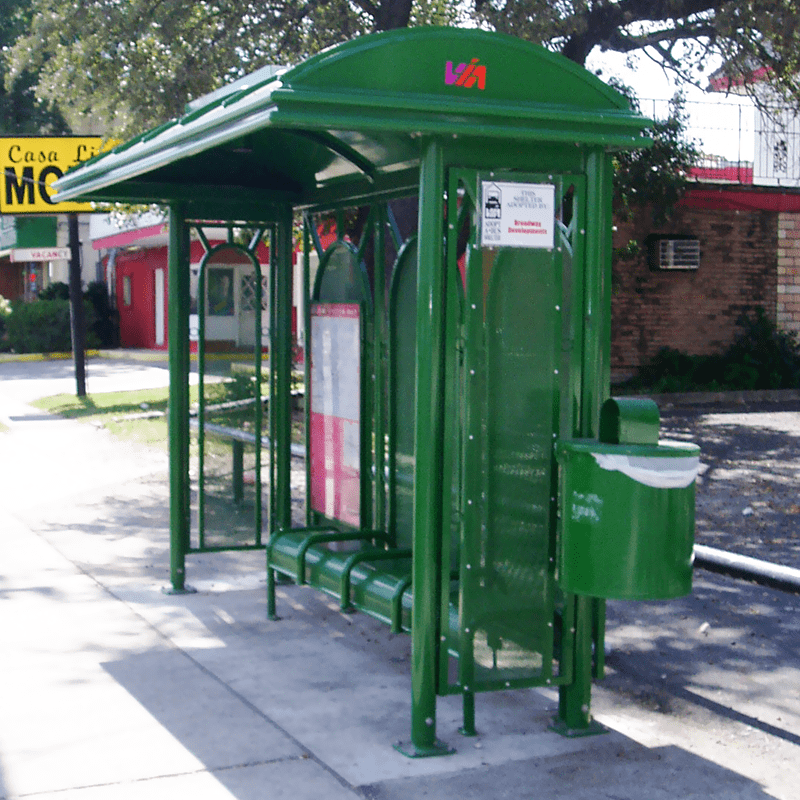 The leadership at the New Orleans Regional Transit Authority, in addition to their many other service initiatives, set a goal of dramatically increasing the number and quality of passenger waiting shelters in the community as it rose after Katrina. 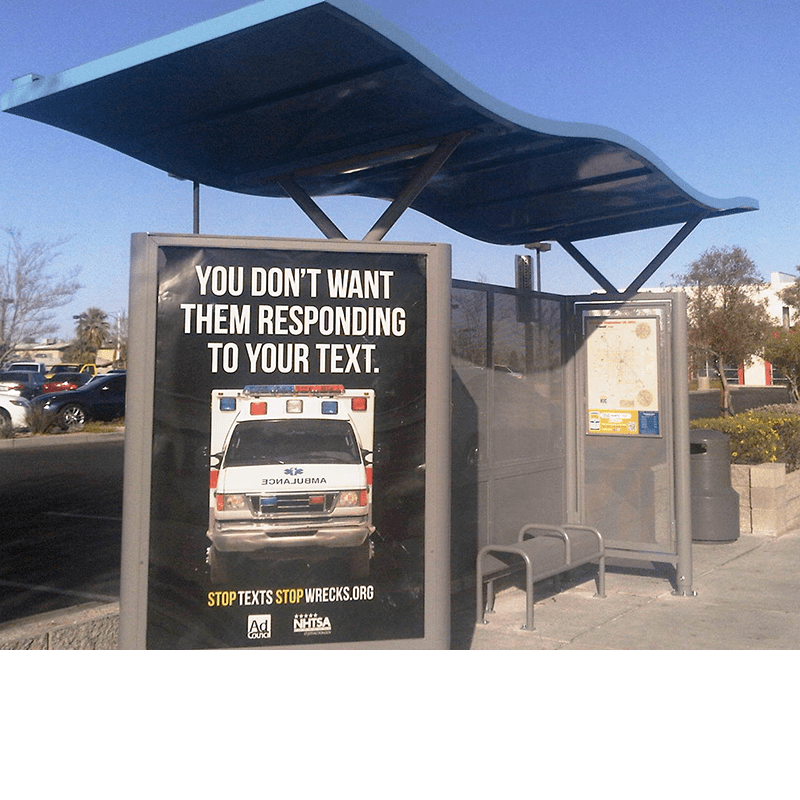 Tolar was tasked by RTA and their outdoor advertising partner to maximize the distinctive value of our Sierra series offering to deliver something uniquely New Orleans. 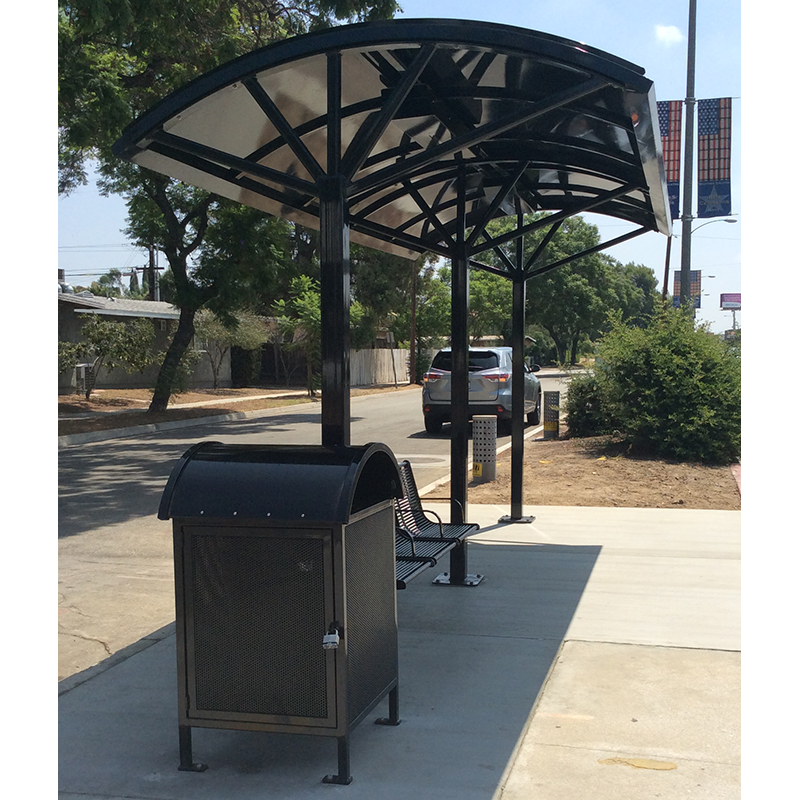 The Tolar team designed and fabricated two separate shelter styles, many powered by solar illumination, for the New Orleans general market. 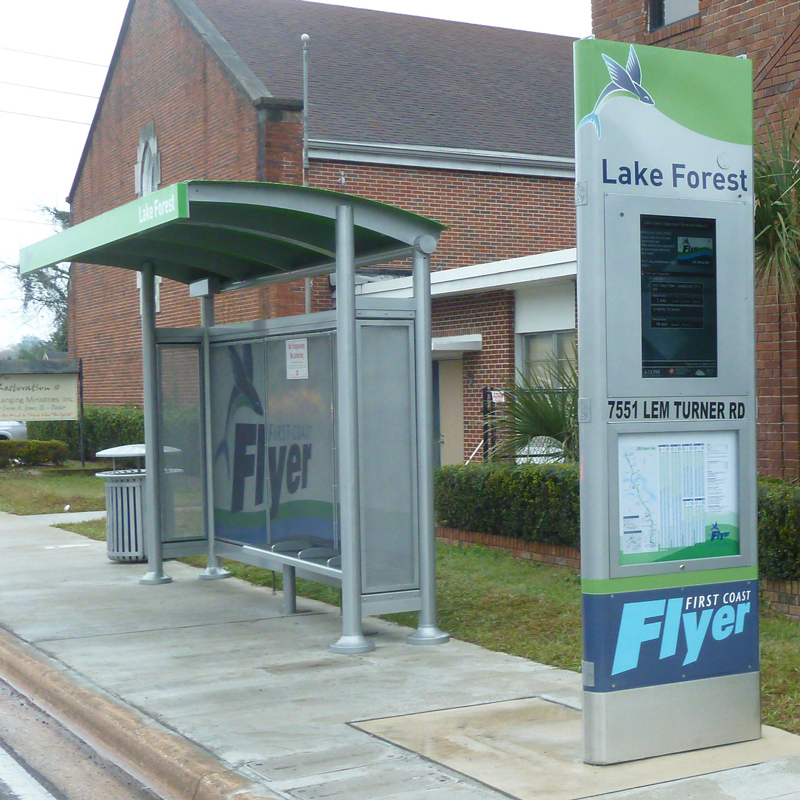 Tolar also created uniquely New Orleans kiosks and way finding signage. 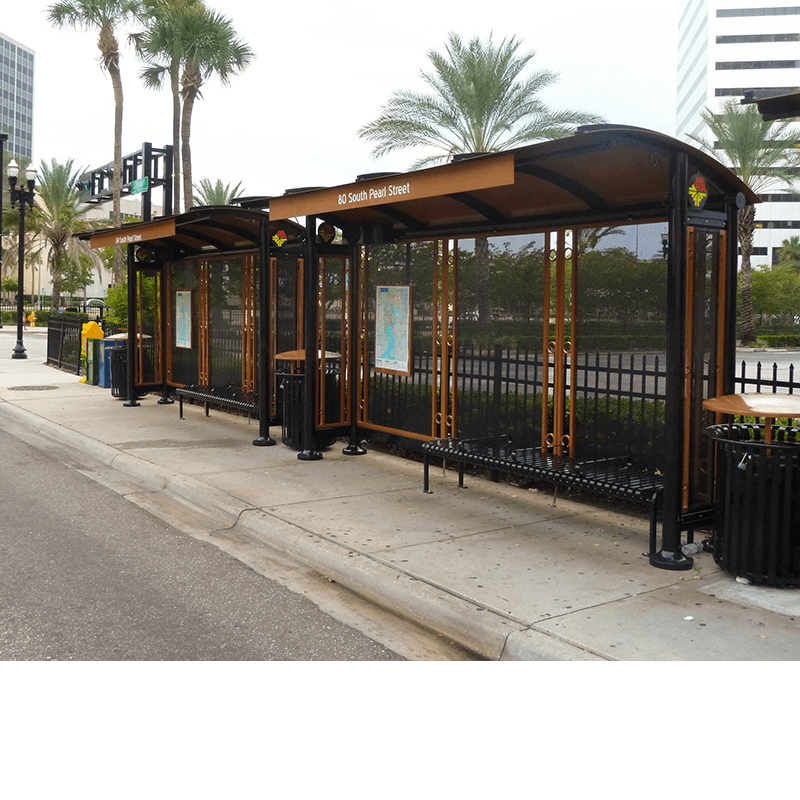 The team at New Orleans RTA re-invented a great transit system in a very short period of time and the Tolar Team is extremely proud to have played a small part. 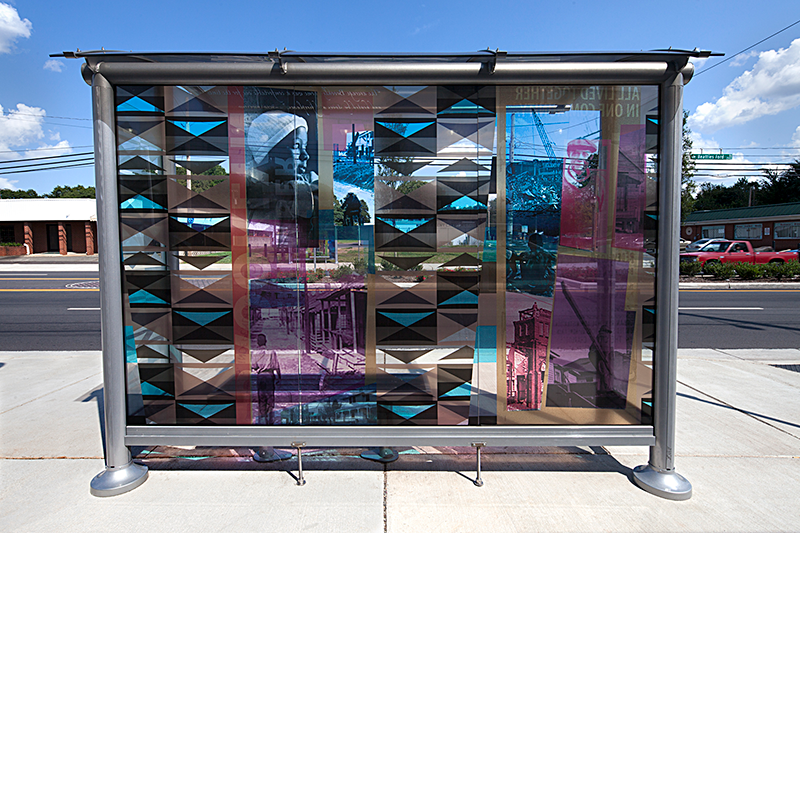 Tolar Manufacturing, working with our transit agency partners, was tasked with designing and fabricating transit shelters from our Signature Sunset series that incorporated custom are glass to help create a Sense of Place™ at transit stops throughout the Charlotte area. Las Vegas, in addition to being an internationally recognized gambling and entertainment mecca, is also home to great recreational opportunities at nearby Lake Mead, Mt. Charleston or the Red Rock Canyon National Conservation Area. 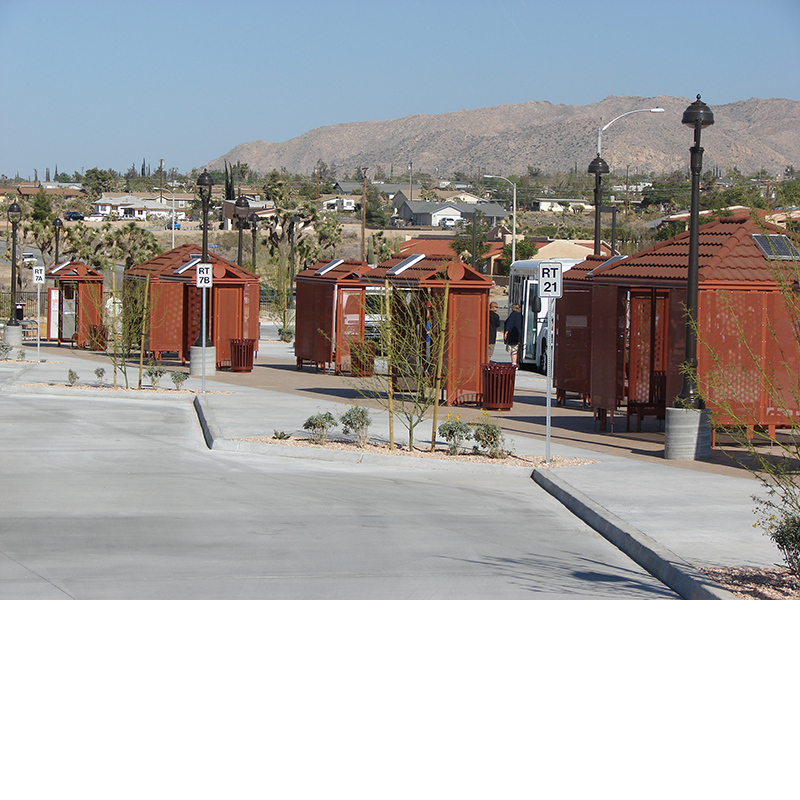 Tolar Manufacturing offers a shelter portfolio as diverse as the Las Vegas landscape. 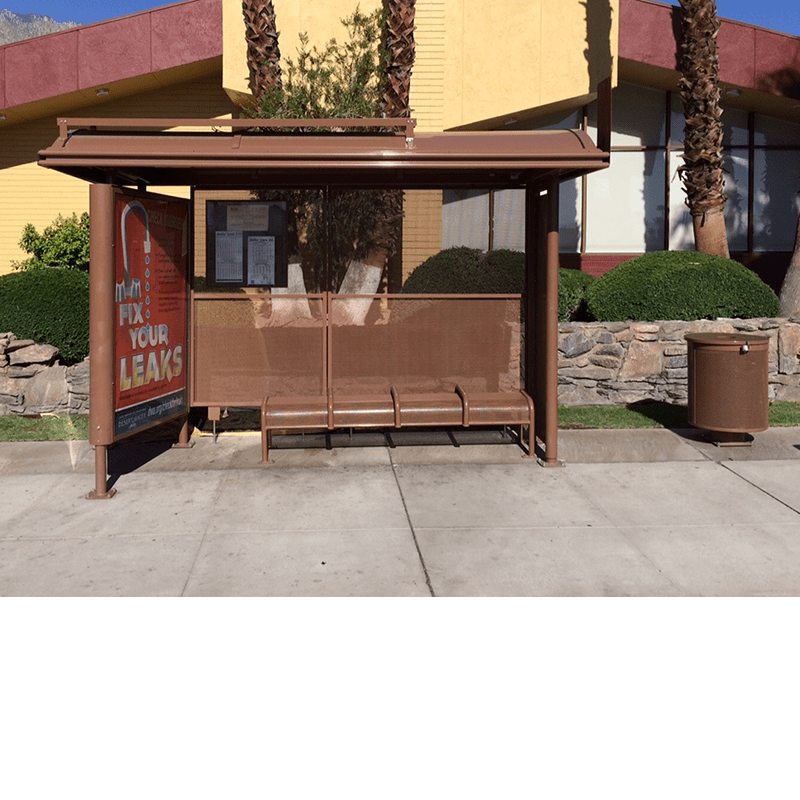 This illustration of transit shelters we were selected to fabricate for the Regional Transportation Commission of Southern Nevada is one such example. 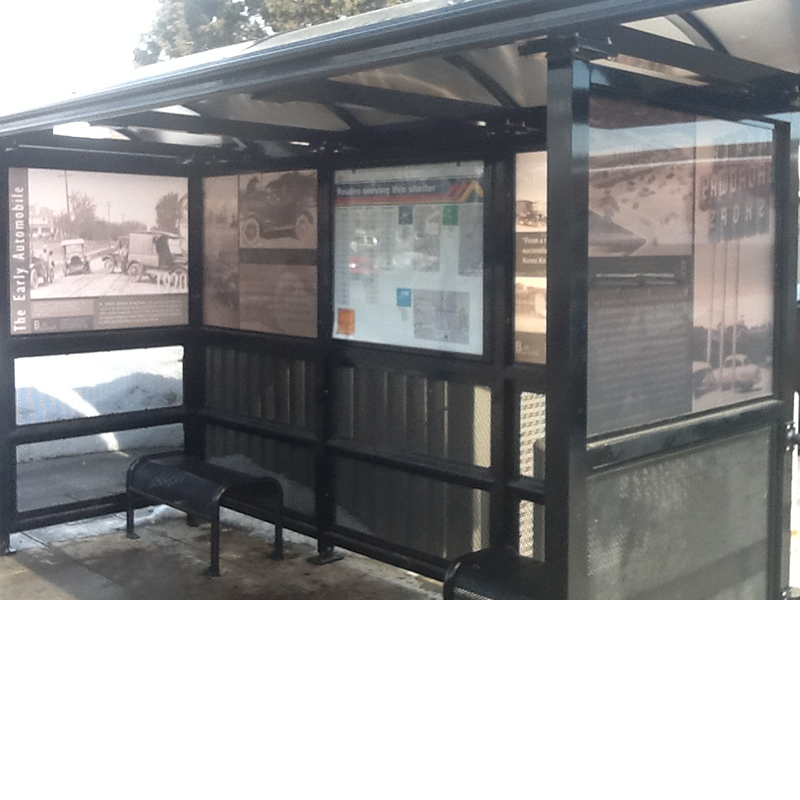 Based on a concept commissioned by RTC, Tolar adapted our Signature series to meet the needs of the Metro Las Vegas community with all aluminum construction, wave roof, media display kiosk and complementary bench and map case. The structure illumination is powered by photovoltaic panels. 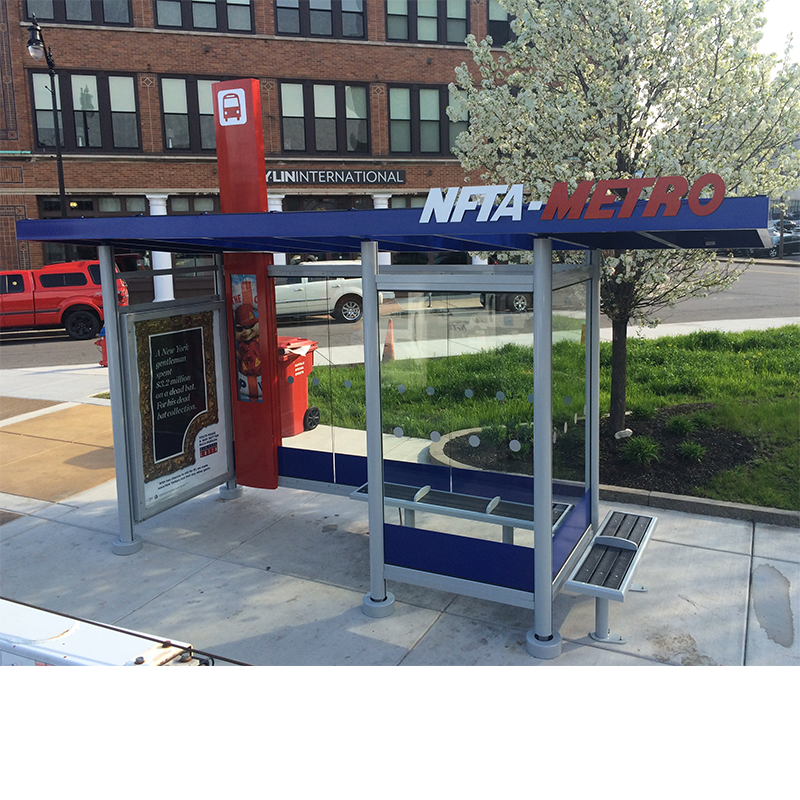 NFTA in Buffalo (NY) awarded Tolar Manufacturing the opportunity to develop and fabricate their new transit shelter design. 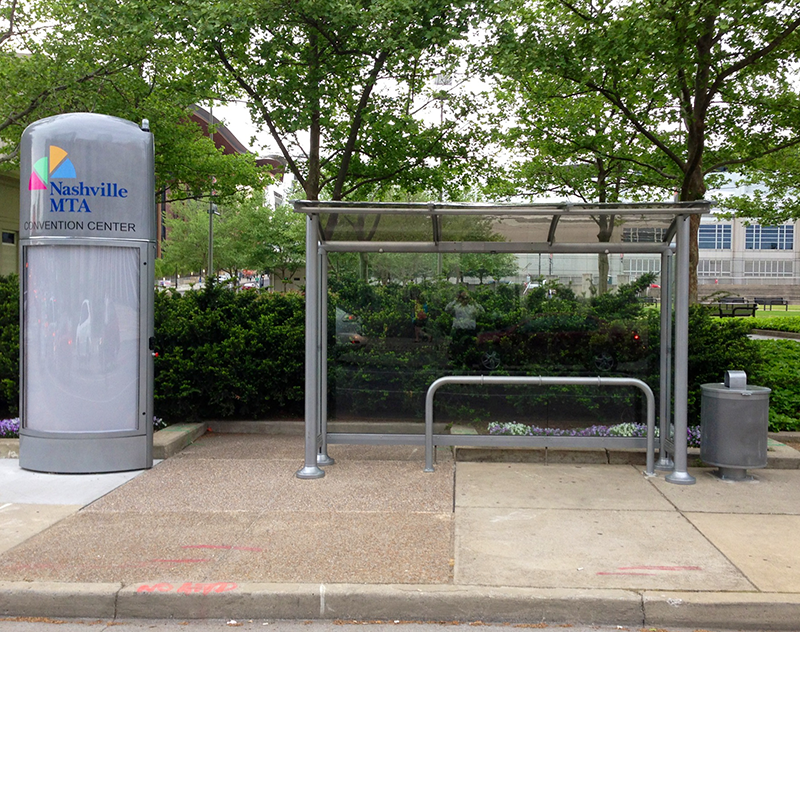 Agency branding was incorporated in to this Signature aluminum structure that also includes glass walls, totem, integrated map case and optional advertising media display kiosk to give a fresh look to the NFTA street furniture standard. 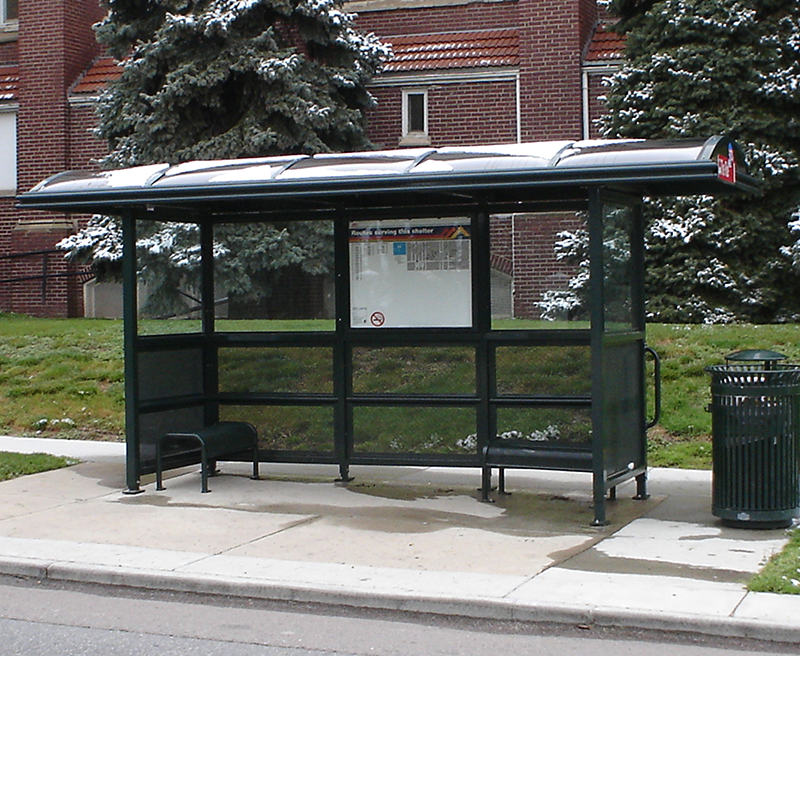 In downtown Rochester the transit district was losing use of their indoor terminal. 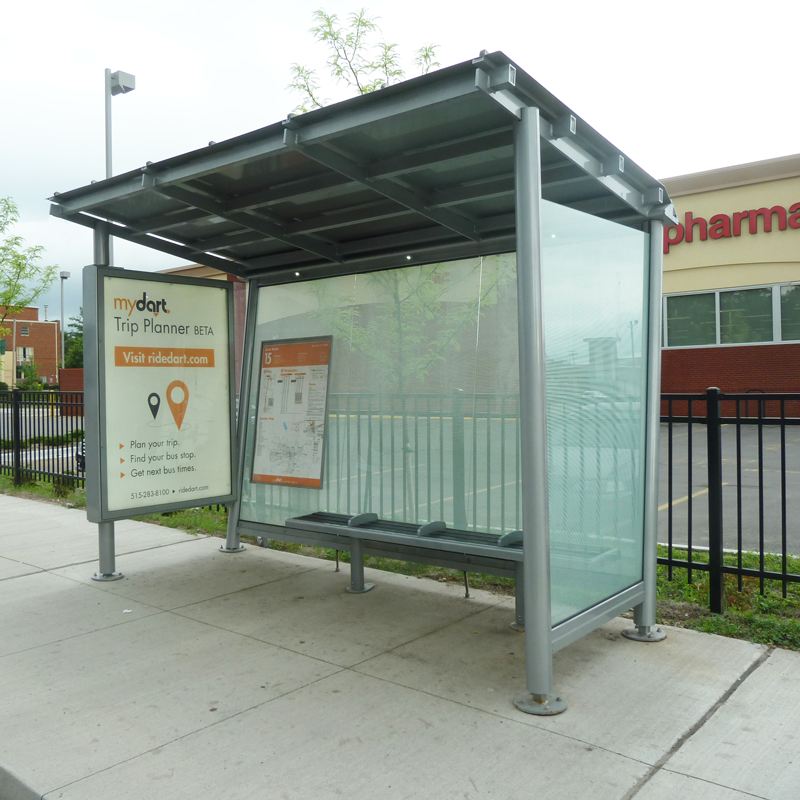 To replace the space, RGRTA selected eight of the Tolar Niagara series hip peak shelters with advertising kiosks, complementary recycle slat benches, and front glass and heaters as an economical solution to their passenger amenity dilemma. 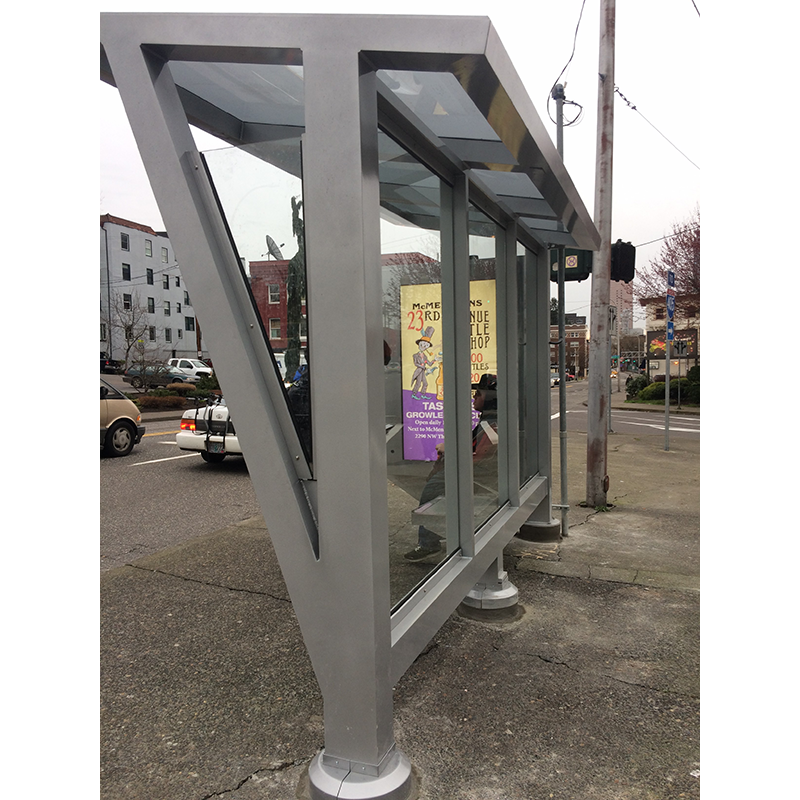 Tolar worked with the transit agency, its advertising provider and the City of Portland to provide this custom street furniture solution for transit riders. 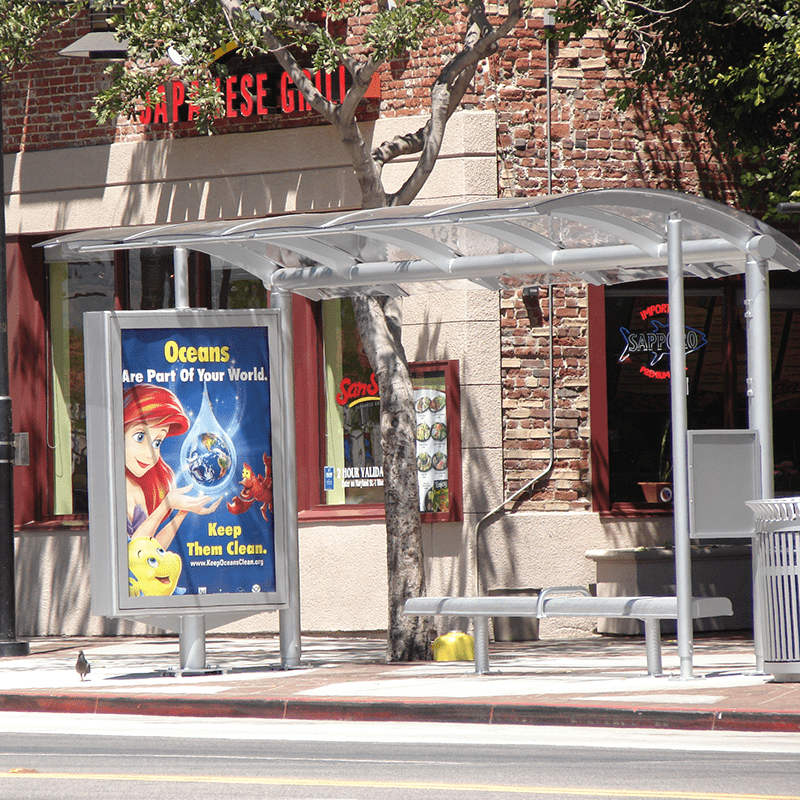 This Signature series custom aluminum structure features back to back 75” LCD hi-bright displays in a NEMA enclosure, laminated glass gray roof panels, and an integrated bench. Nashville is known as the Music City and it is a large tourist destination. 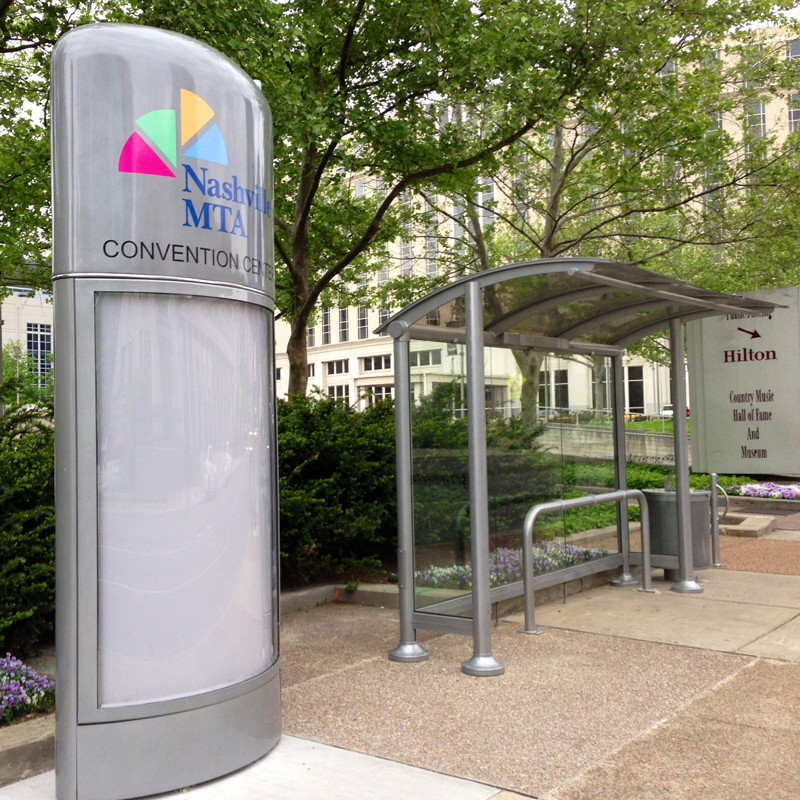 Locals and tourists alike look to Nashville MTA to get them where they need to go. 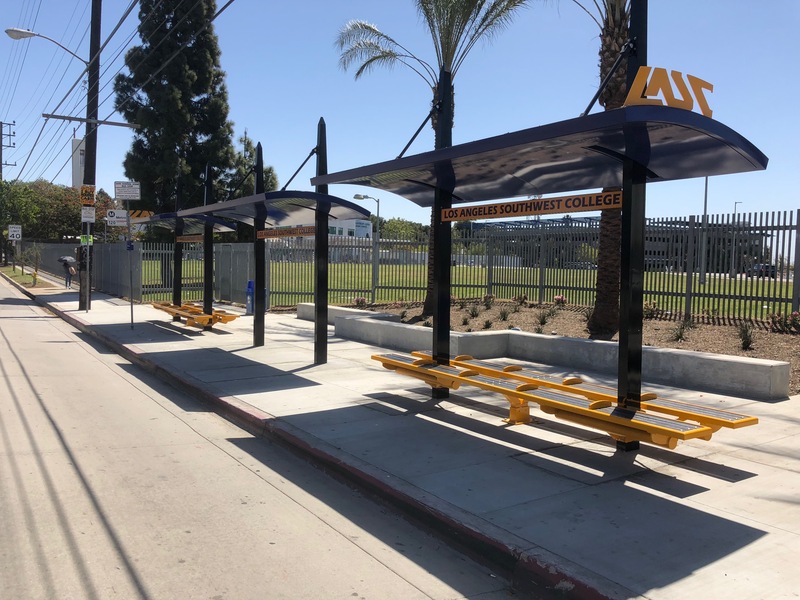 There is a good possibility that while waiting for one of MTA’s clean and on-time buses they will be spending time at a Tolar-designed and fabricated shelter or bench. 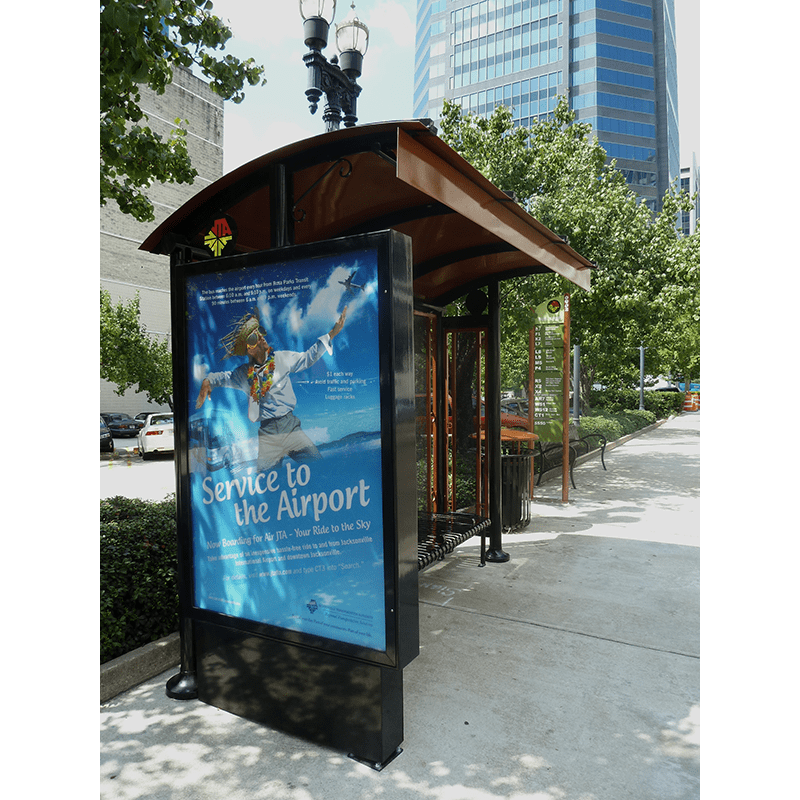 Through a competitive bid process, Tolar has been fortunate to have the opportunity to fabricate our Niagara series transit shelters, perforated metal advertising benches and solar illumination for Nashville. 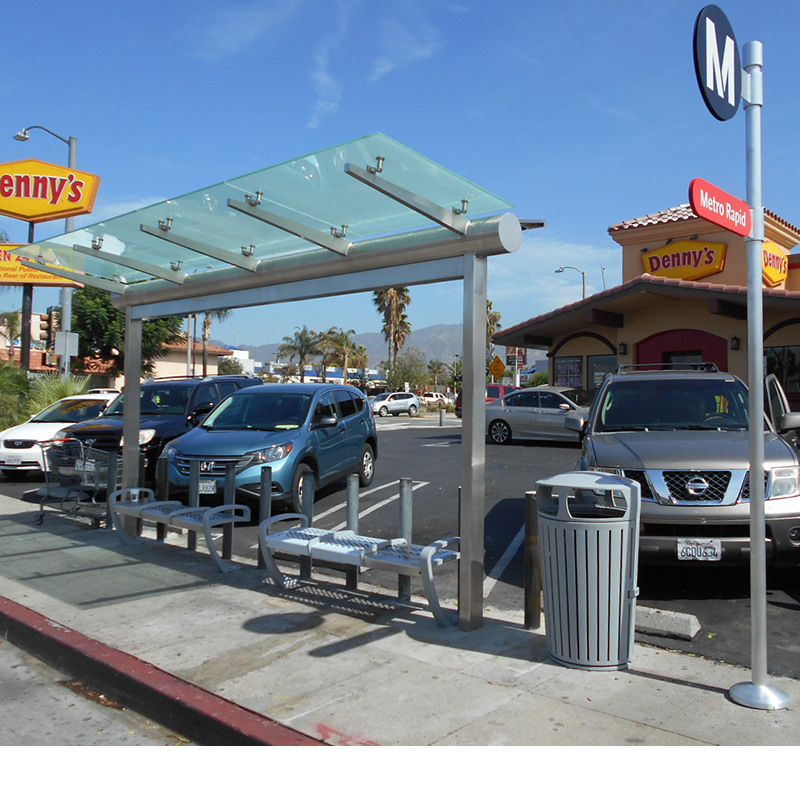 We were also honored to be awarded a contract to design and fabricate street furniture for the BRT route including custom radius roof shelters custom glass, lean rail, bike loops, solar illuminating and a distinctive fiberglass branding kiosk. 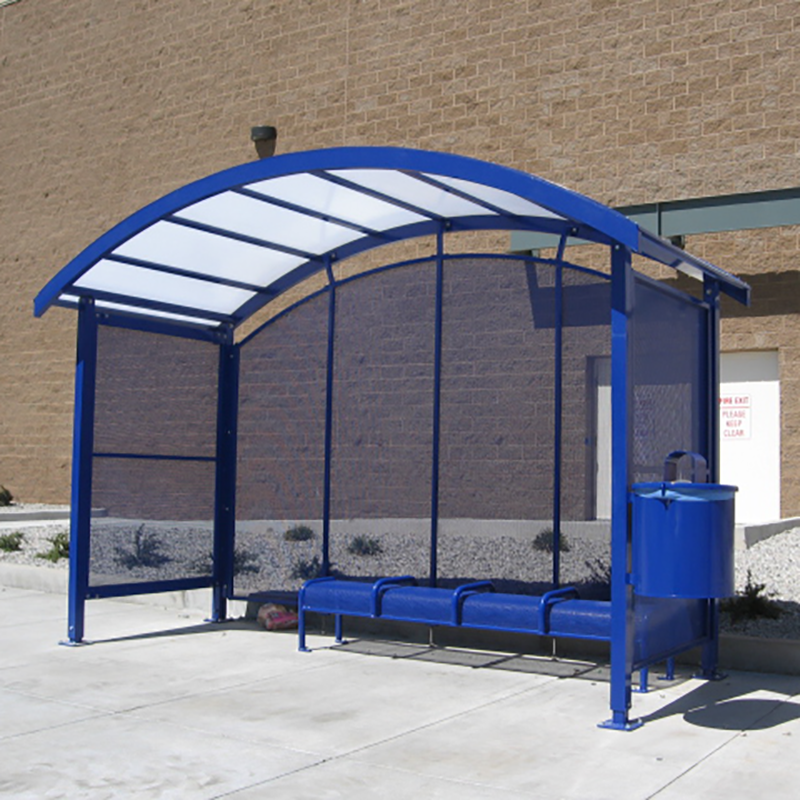 Tolar Manufacturing was awarded a recent procurement for transit shelters that incorporate features from our popular Signature series. 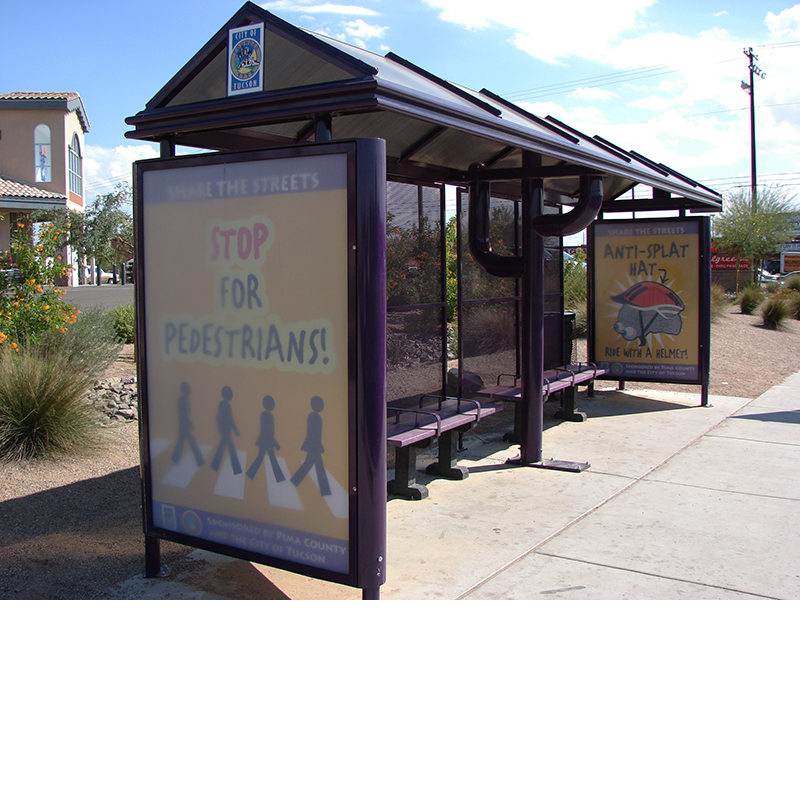 The 12’ 5” shelters allow for optional rear wind screens and an agency banner. 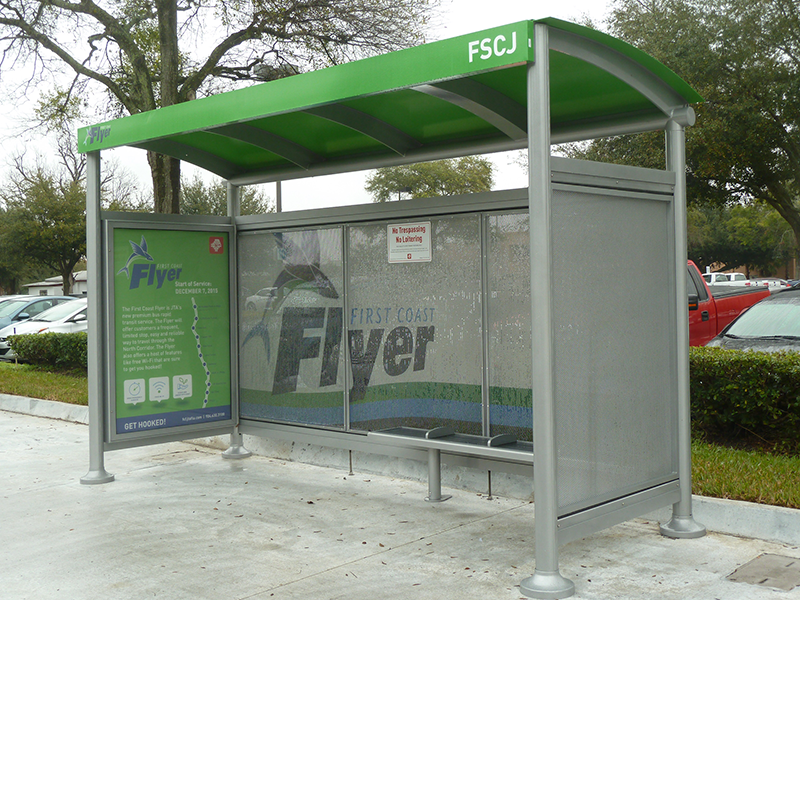 Tolar Manufacturing designed and fabricated this transit shelter from our Sierra line for Del Mar College in Corpus Christi, Texas. The 9-foot dome roof includes #solar panels, which provide dusk-to-dawn illumination. 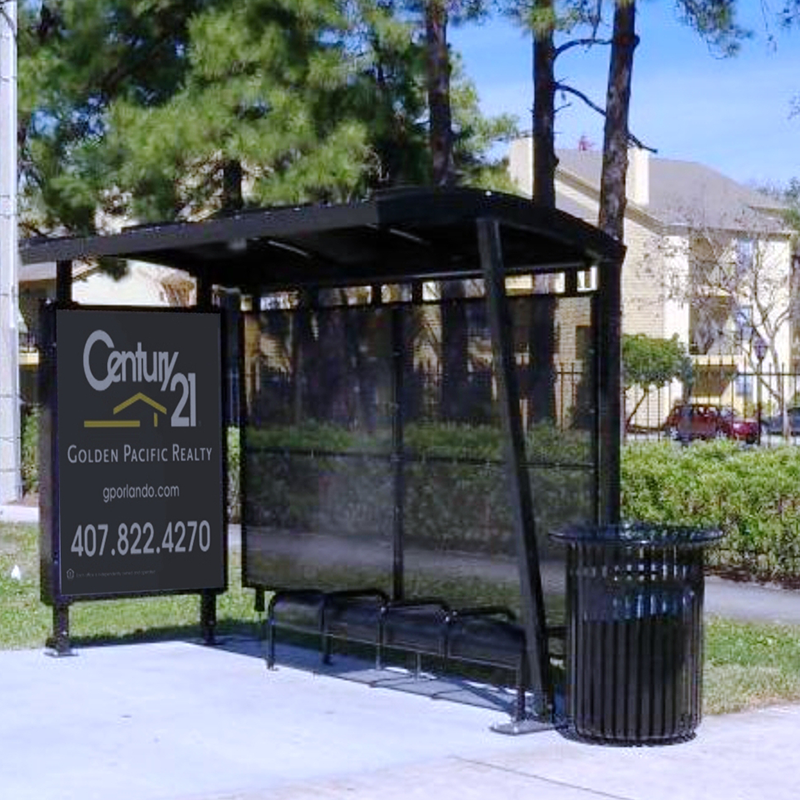 The eye-catching paint scheme coordinates with agency branding at Corpus Christi Regional Transportation Authority. 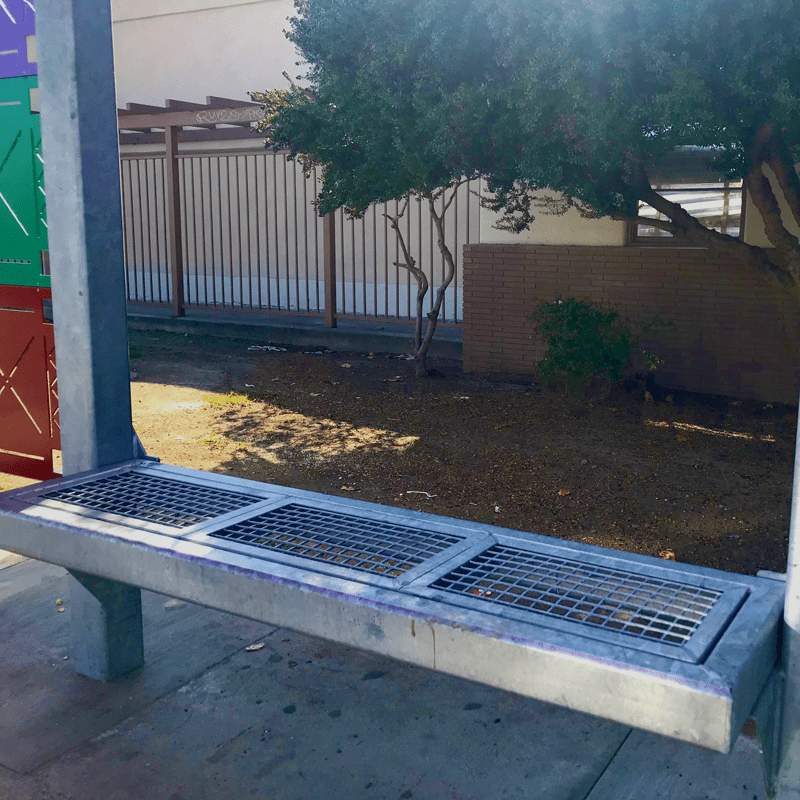 Other features include Victorian-style perforated metal rear wall, comfortable bench, and wall mounted trash receptacle. The Dallas area is home to many unique destinations, including places like the Dallas Farmers Market, Reunion Tower, The Arboretum, Dallas Museum of Art, not to mention a wonderful variety of restaurants and clubs. 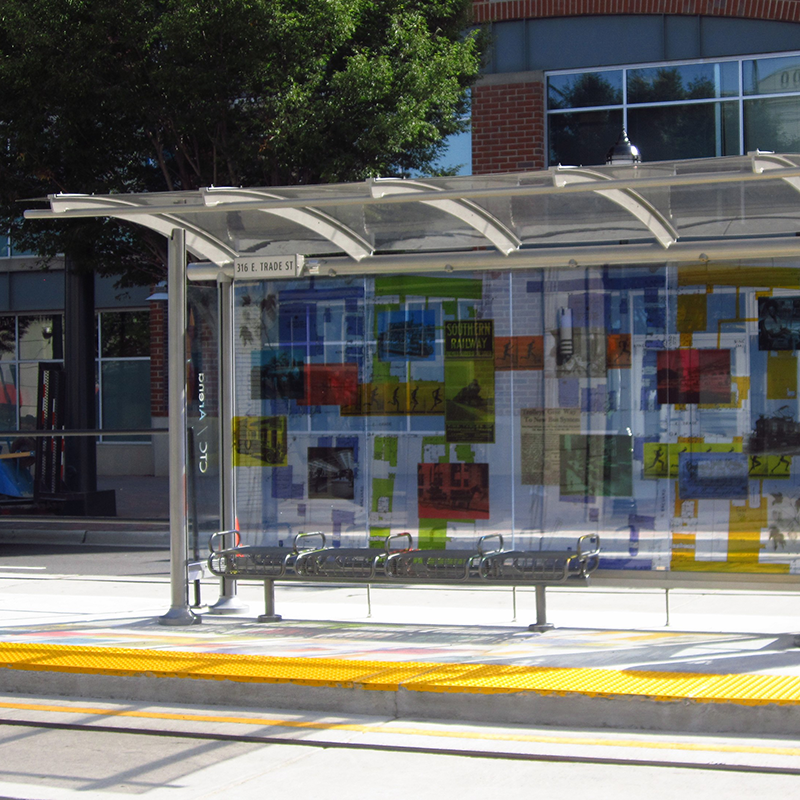 Dallas is also fortunate to have a world class transit system, DART, to get people to these great places. 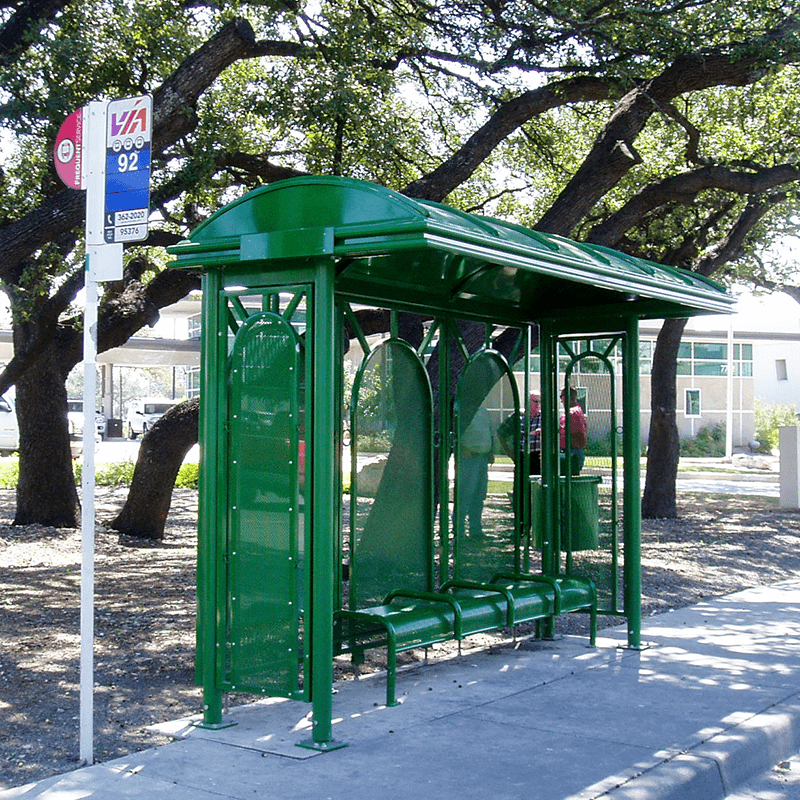 The Tolar team is fortunate to have been selected to provide transit shelters for the DART community. 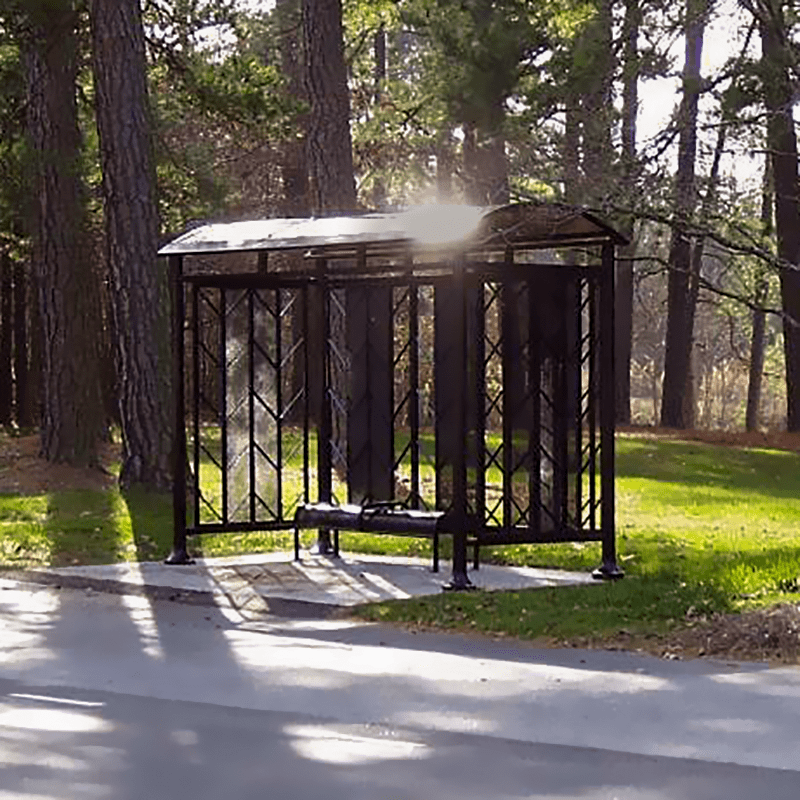 The shelters, selected from our Niagara series feature four unique sizes of dome roof shelters, recycle slat benches and solar illumination. 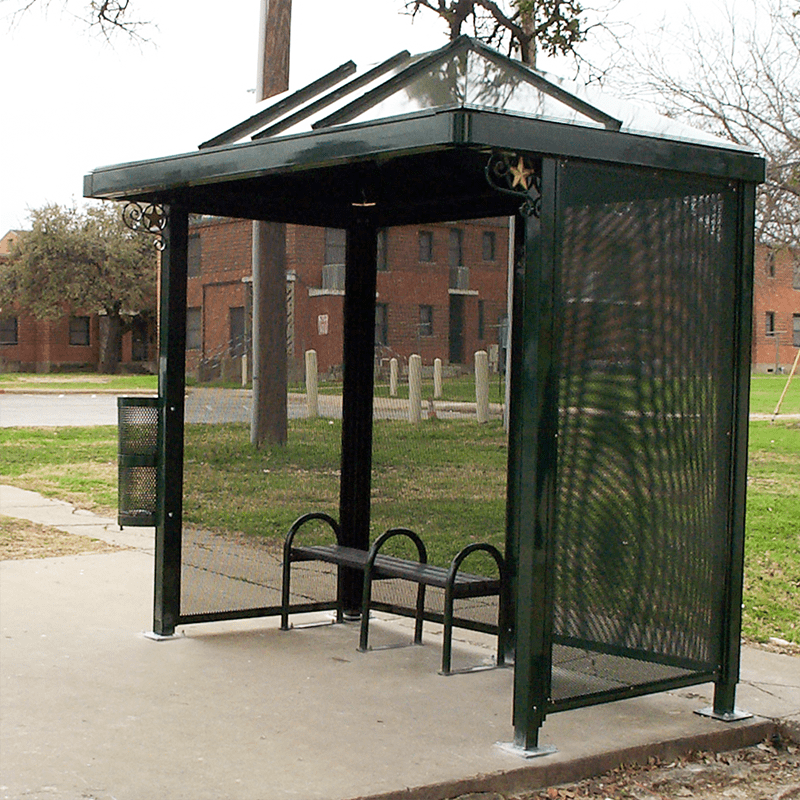 Tolar Manufacturing has again been selected to design and fabricate transit shelters for the Fort Worth Transportation Authority (The T). 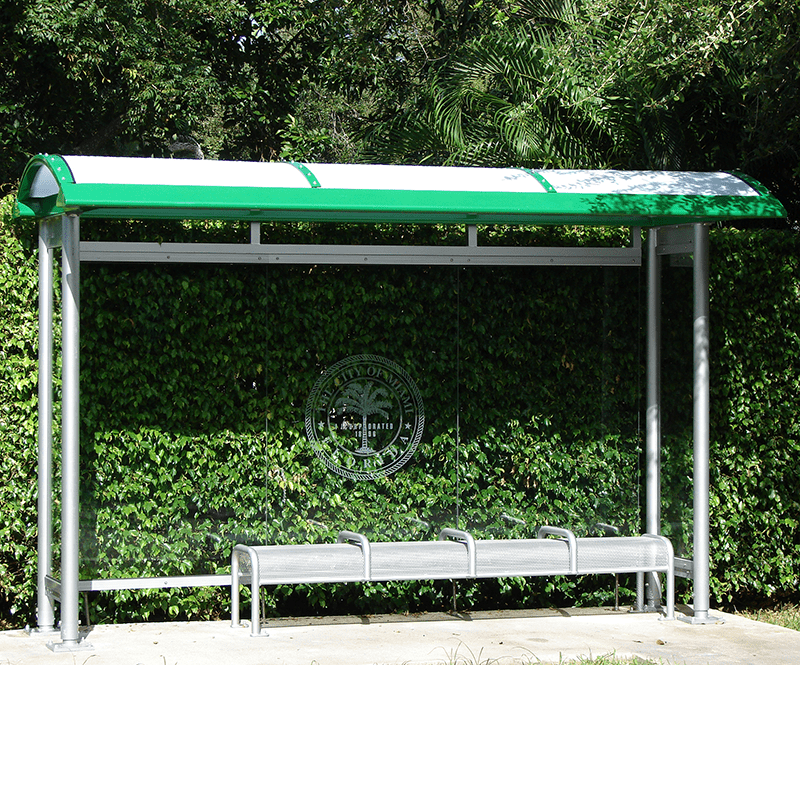 From our Niagara series, these 12’ hip roof shelter solutions include custom scrollwork featuring the Star of Texas, as well as dusk-to-dawn LED-powered solar illumination. 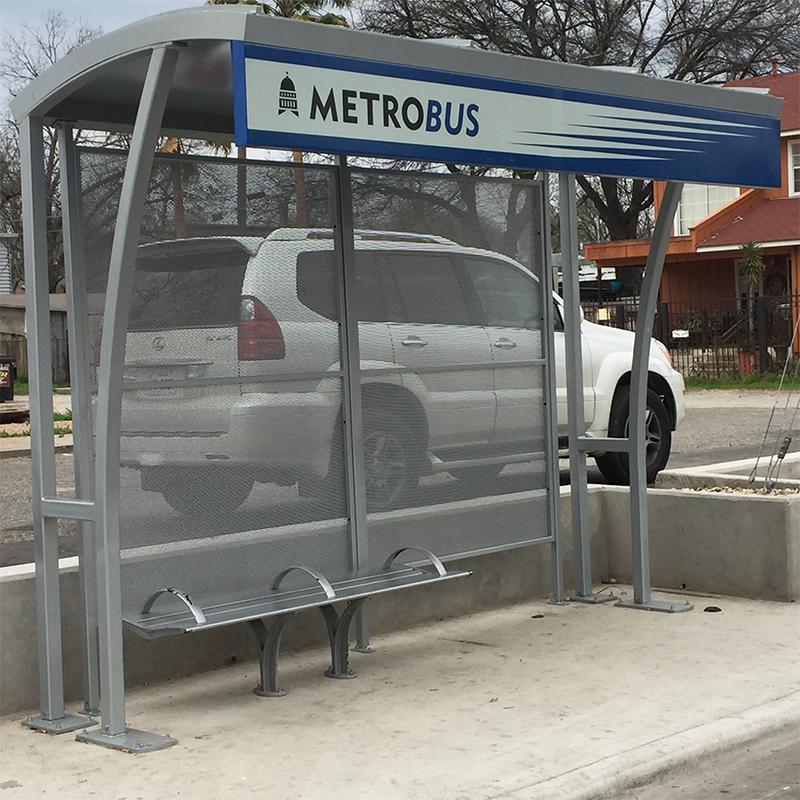 Tolar is proud of its role in helping to grow transit ridership in the Ft. Worth community. 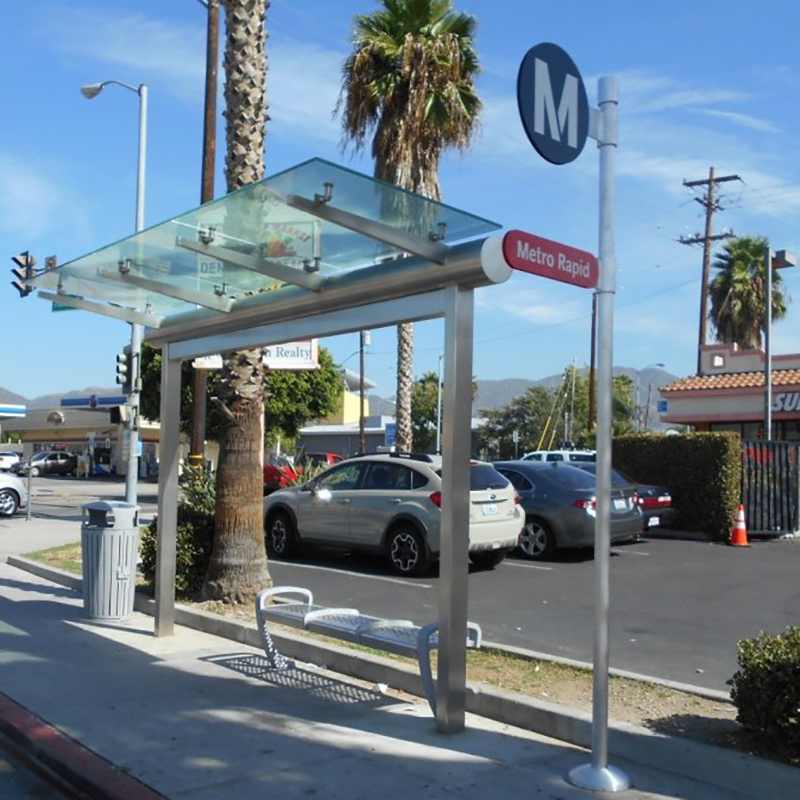 Tolar was chosen by VIA Metropolitan Transit through competitive bidding to fabricate and install shelters and street furniture from our Sierra series. 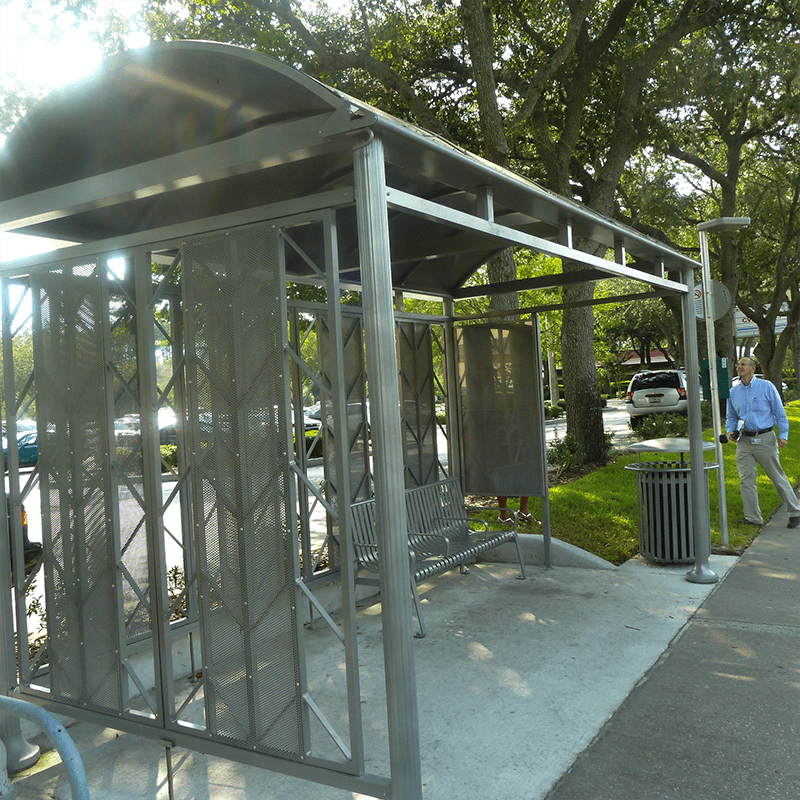 Designed to deal with the demands of San Antonio’s southwestern climate, the 13-foot domed-roof shelters feature aluminum roof panels with raised decorative battens, Victorian-style perforated-metal wall panels, dusk-to-dawn solar LED roof lighting, integrated rear wall map case, an 8-foot perforated metal bench with anti-vagrant bars and a pole-mounted trash receptacle. 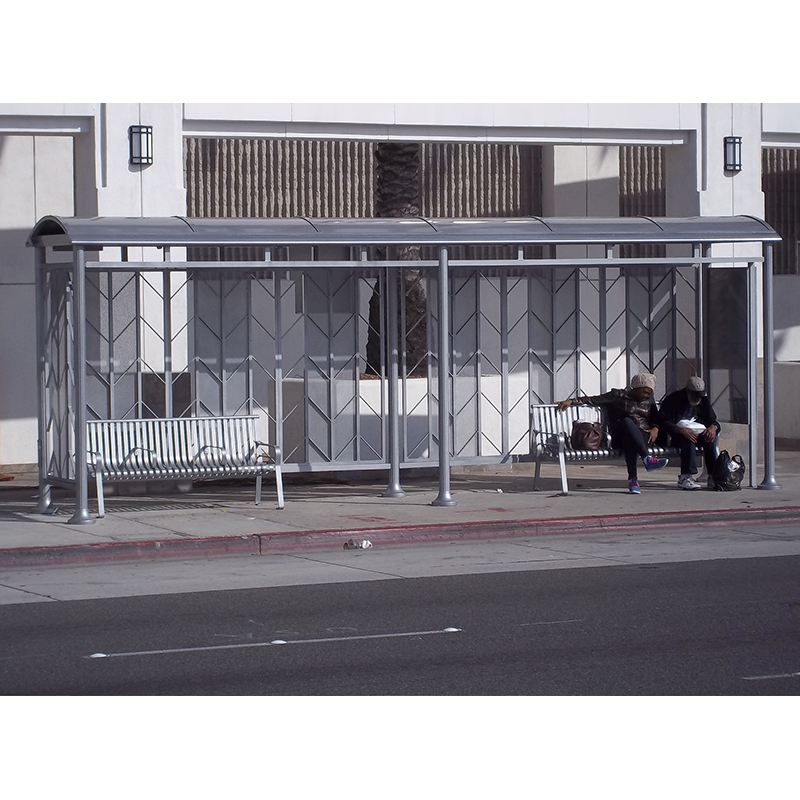 City officials worked with the Tolar Team to design a shelter based on our distinctive Euro series incorporating a herringbone design and perforated metal walls. 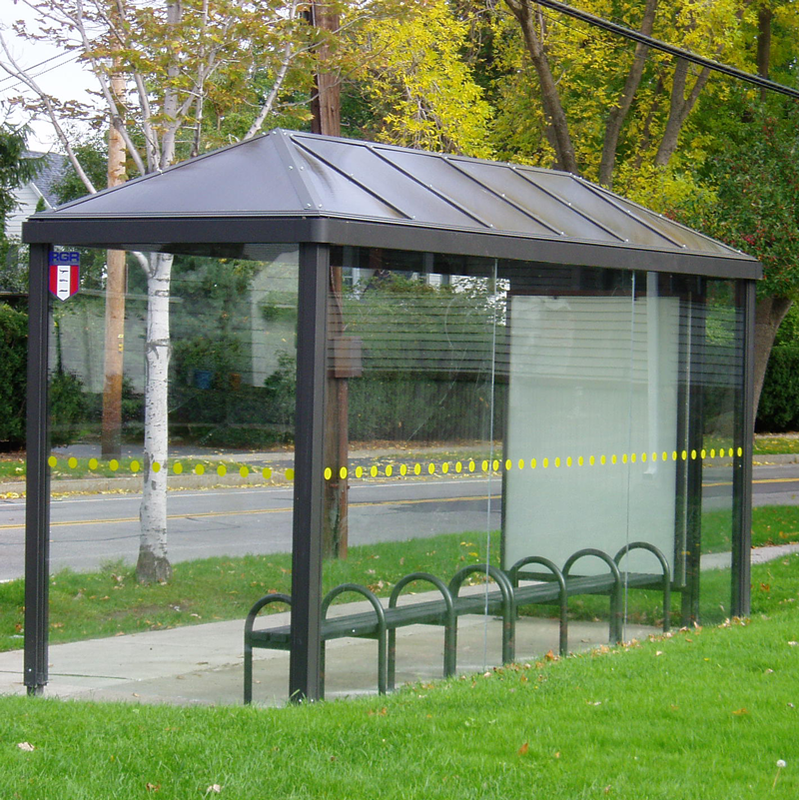 The Euro-style roof is supported by fluted support posts, and the anchoring shoe is concealed by aluminum escutcheons. 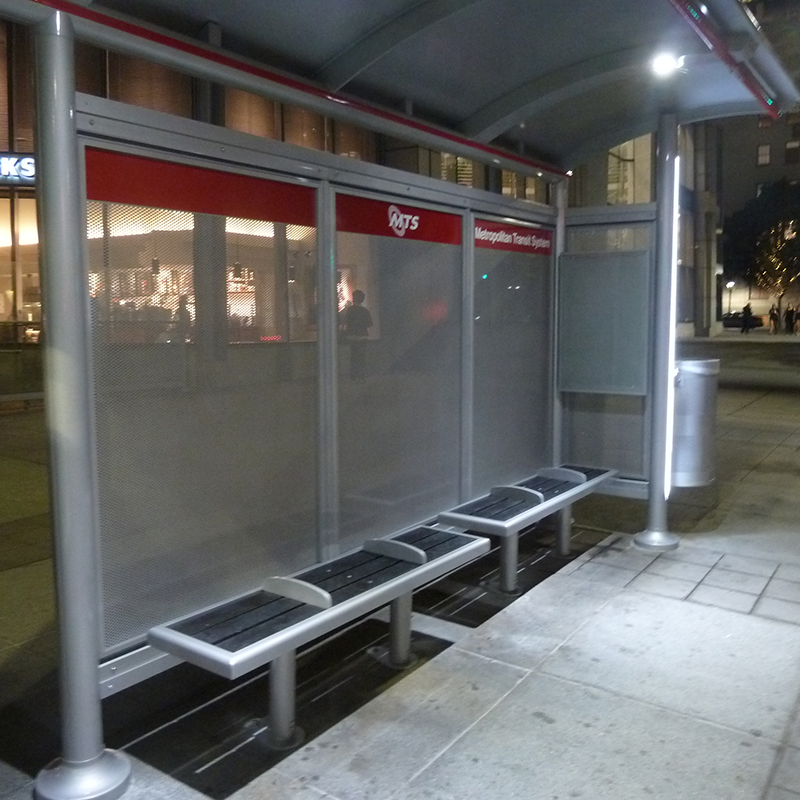 The shelter set includes a 6-foot perforated aluminum bench with an anti-vagrant bar. 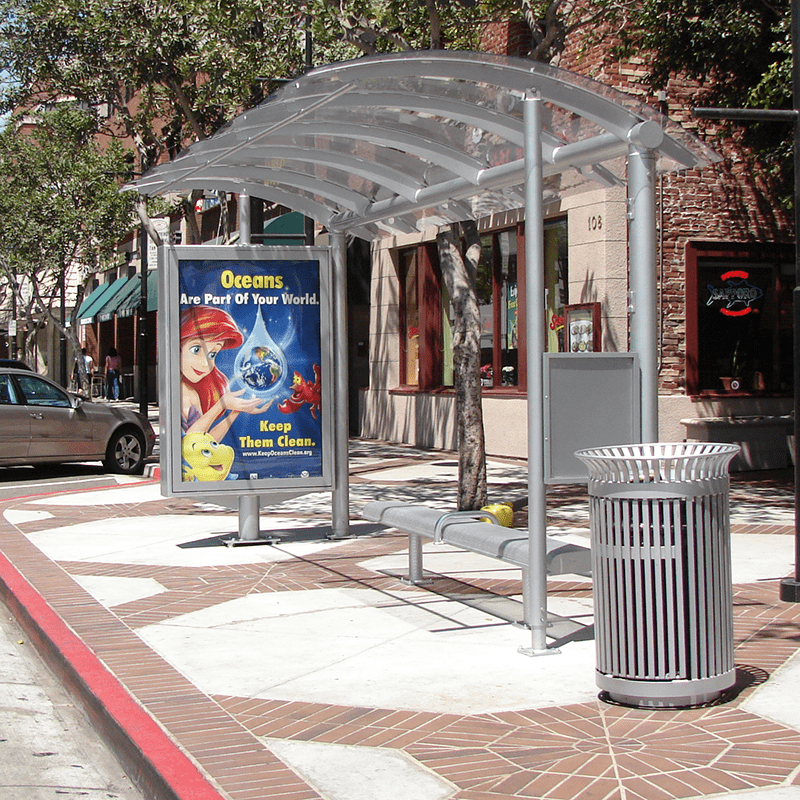 The design was fabricated in both 13- and 20-foot lengths for installation throughout the city. 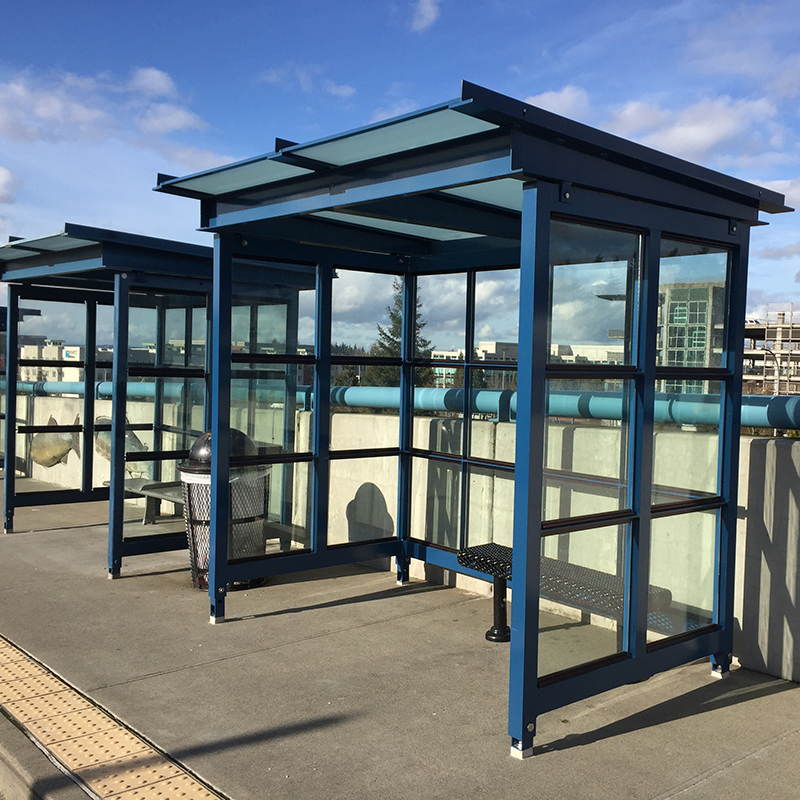 Tolar Signature Custom 9’ and 17’ Aluminum framed angled flat roof BRT station shelters with laminated glass roofs and aluminum flamed laminated glass walls for Sound Transit stations in Metro Seattle.